At this stage we would like to share some statistics of the countries we visited. Starting with Sudan. It was a pleasure to fill the vehicle with Petrol. At R4.20 per liter it reminded us of South Africa 12 years ago. Petrol stations are everywhere but power cuts and availability is a problem. The exchange rate was 7.1 Sudanese Pound for 1USD. Money must be exchanged and cannot be drawn from an ATM. We exchanged US Dollars for Sudanese Pound. 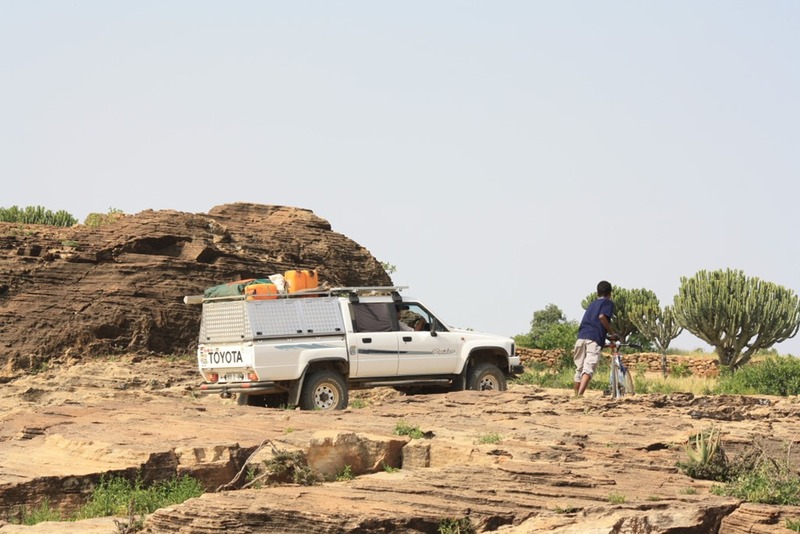 Road conditions in Sudan varied from fair to very good, except for the stretch between Abu Hamed and Wadi Halfa where there were NO road, just a railway line that had to be kept in sight while negotiating the deep sand and sometimes rocky bits of the Nubian Desert. 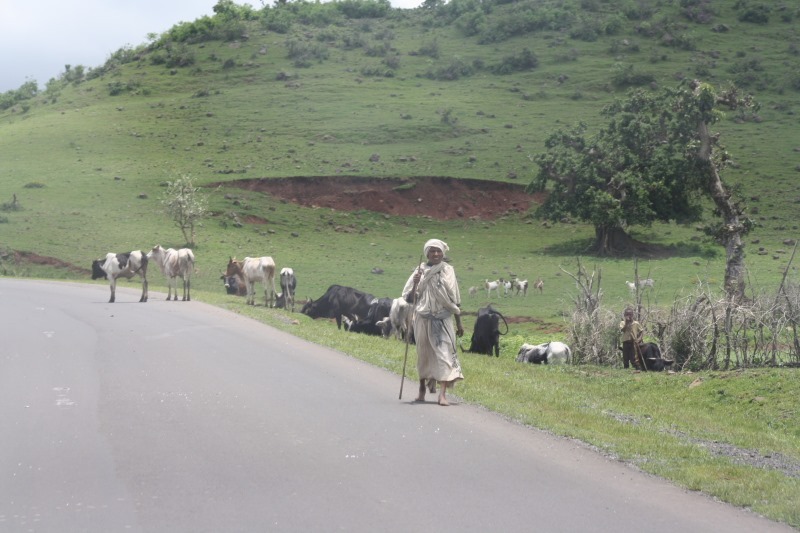 Ethiopia roads vary from not too bad to extremely bad and and driving conditions are very hard on vehicle, driver and navigator . 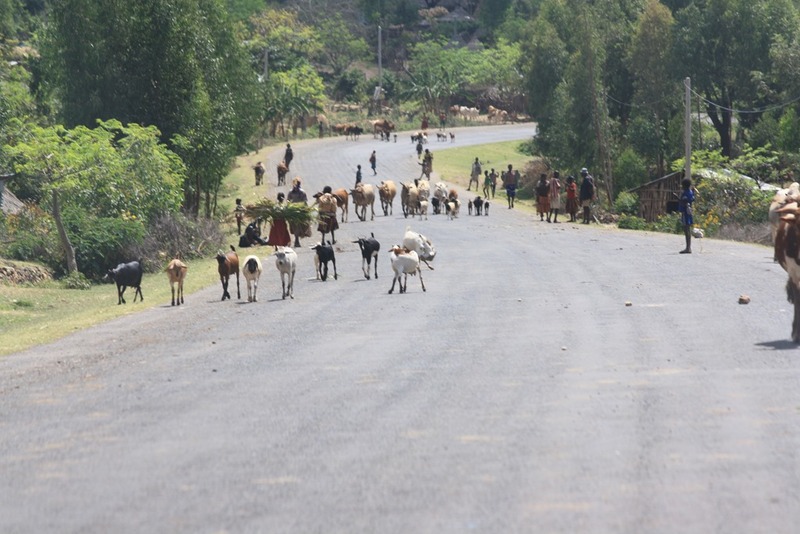 Pedestrians and animals claim the road for themselves and then animals are even fed on the road…..totally crazy. 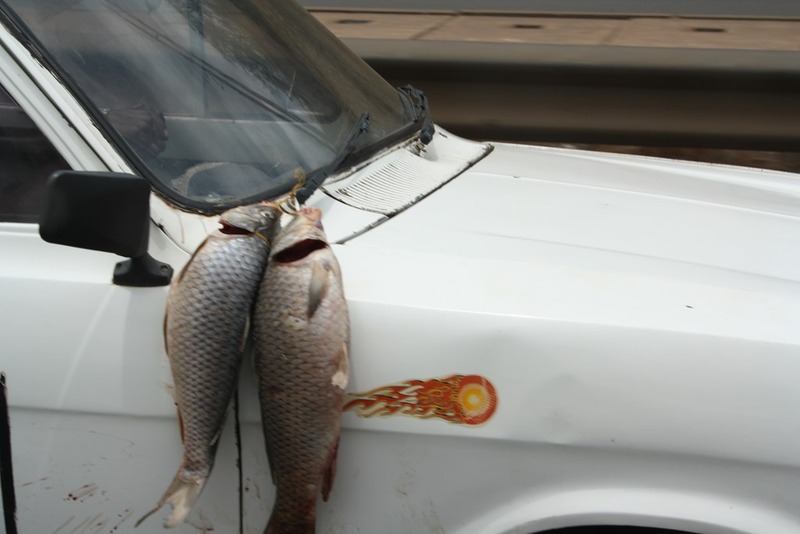 The exchange rate is 1.85 Ethiopian Birr for R1.00 and the petrol price is R10.30 per liter. ATM’s are available in the bigger towns, but US Dollar can be changed in most towns. There are petrol stations everywhere, but as in all the countries that we travelled, power cuts can cause problems. 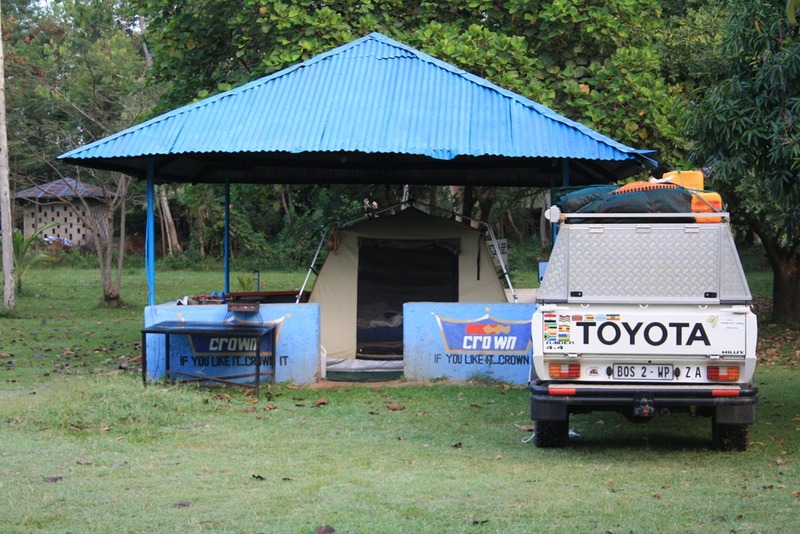 Very few petrol stations have generators, so you must drive in at every station to find one that is operational. 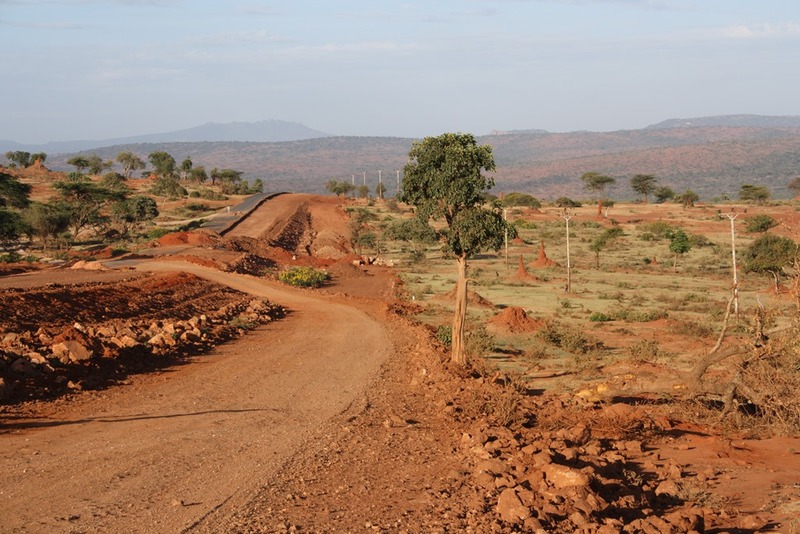 In Kenya the roads are fair to bad with lots of road works going on. 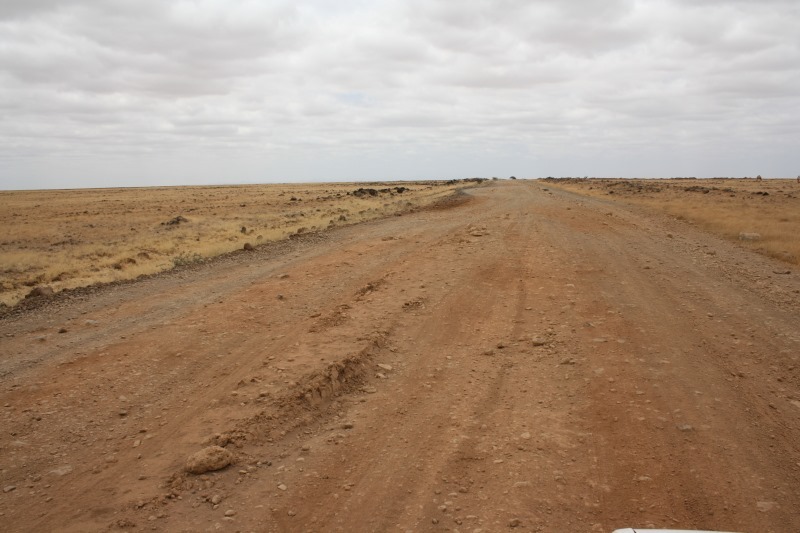 They are even busy working on the infamous Marsabit road and about 40 kilos are already tarred. 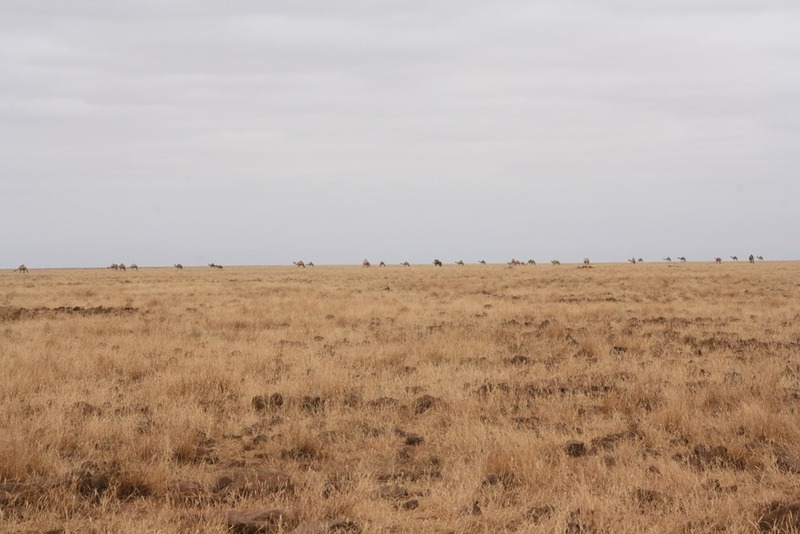 When one crosses the border into Kenya from Ethiopia, the people and animals disappear from the surface of the road and walk beside the road in the veld. 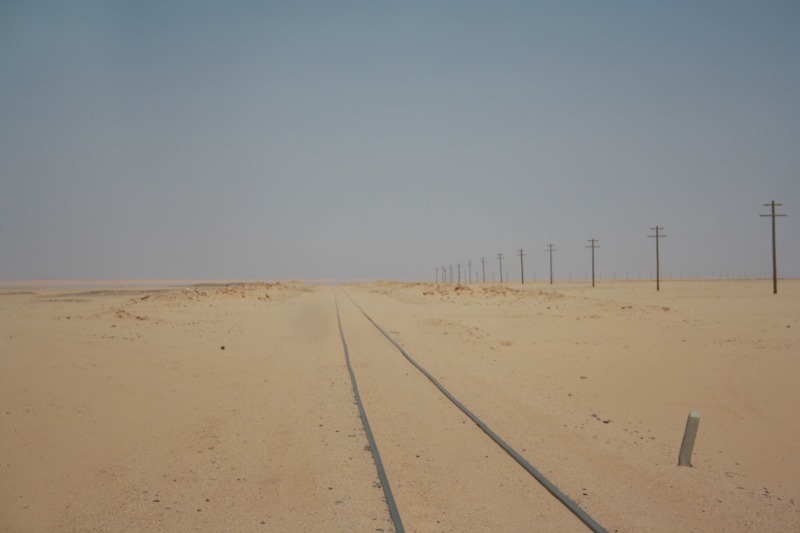 It is as if a border post separates two different worlds! The exchange rate is 8.6 Kenya Shilling for R1.00 and the petrol price is R13.25 per liter. The petrol stations situation is the same as previously mentioned and ATM’s are readily available at Banks and in Shopping Centers. 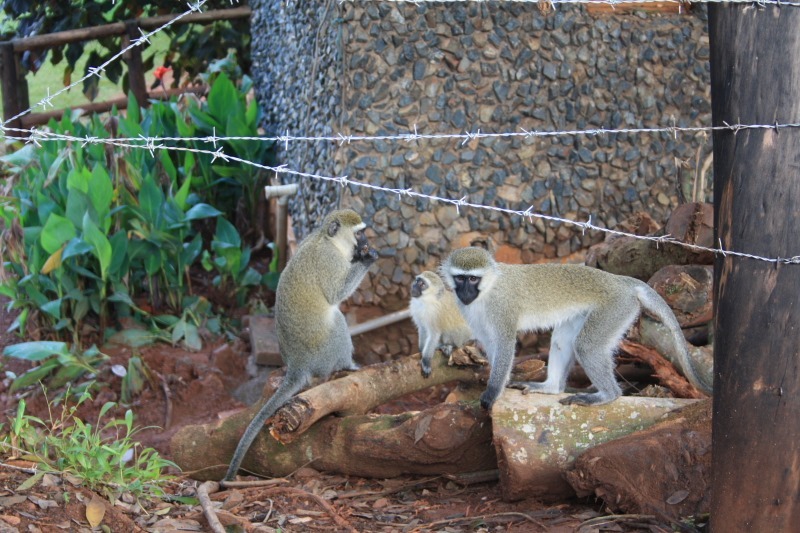 Uganda was really a very pleasant surprise to us. 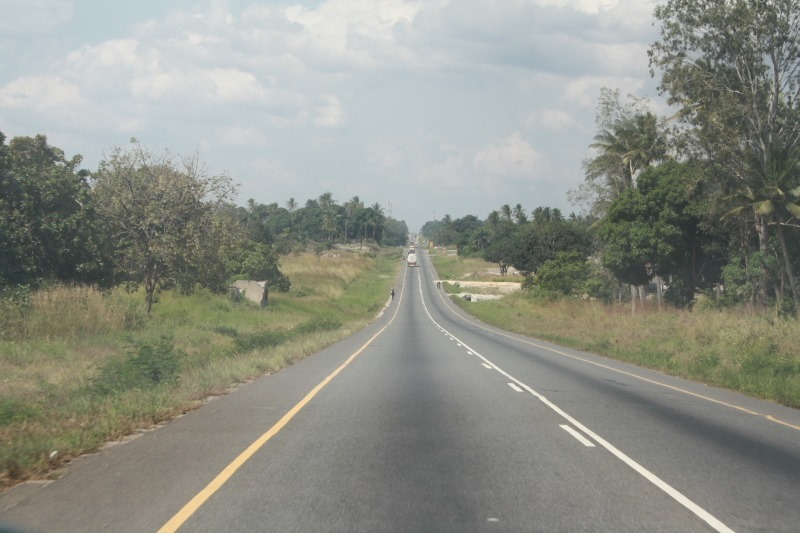 It is a very modern country and the road conditions are good although at times you must also dive and duck for huge potholes. The exchange rate is R1.00 for 250 Ugandan Shillings and the petrol price R14.60 per liter. All over Africa the petrol attendants wanted to put diesel in our vehicle and sometimes it took a lot of explaining and lots of different words for PETROL to convince them to fill the vehicle with petrol. The very sharp woman attendant in Jinja went and found a “PETROL” sticker witch she stuck to the body of the vehicle just above the petrol cap. I must say since then my problem disappeared . 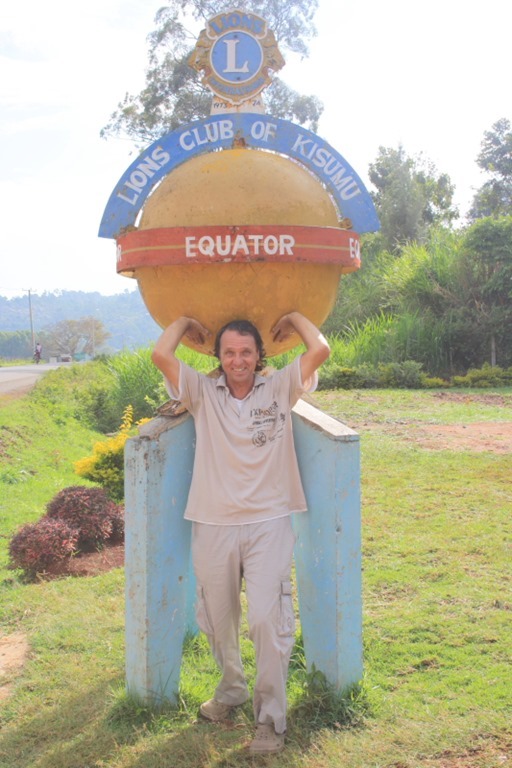 We travelled through Rwanda without drawing money nor putting in any petrol. 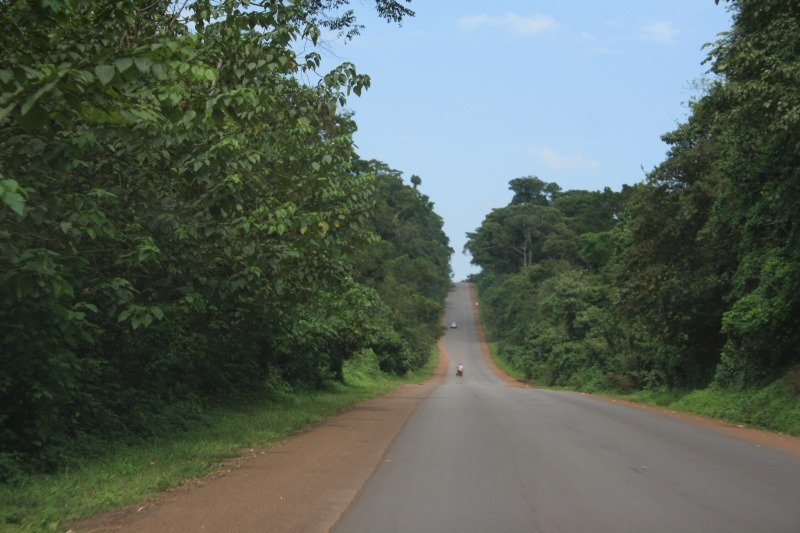 It is a very modern country with good roads and the traffic is not bad. 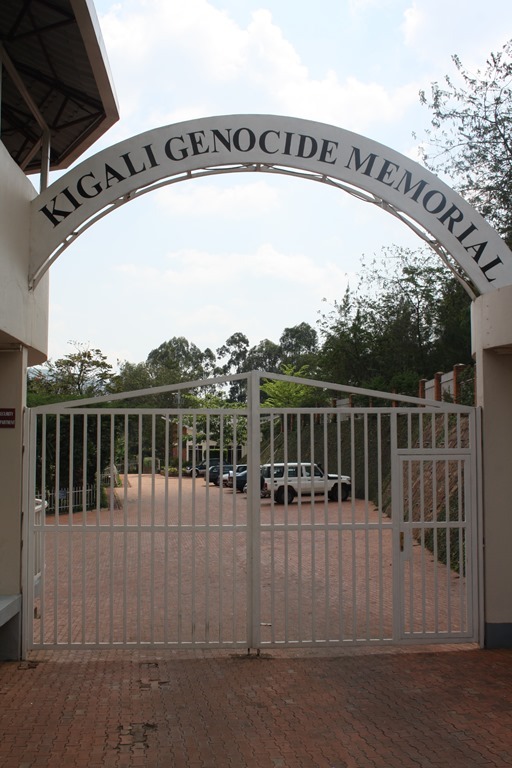 We felt very uncomfortable after visiting the Genocide Museum and were in and out of Rwanda within 24 hours. 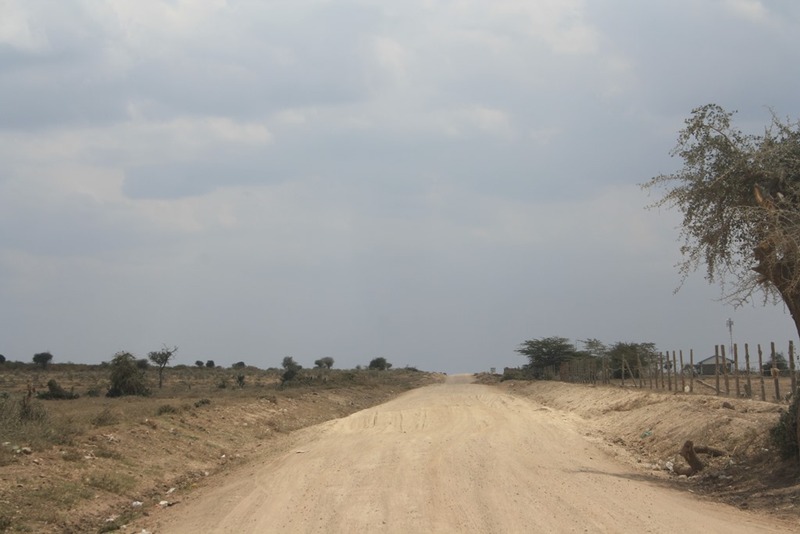 Tanzanian roads are mostly in a good to fair condition, except where there are road works and gravel roads. 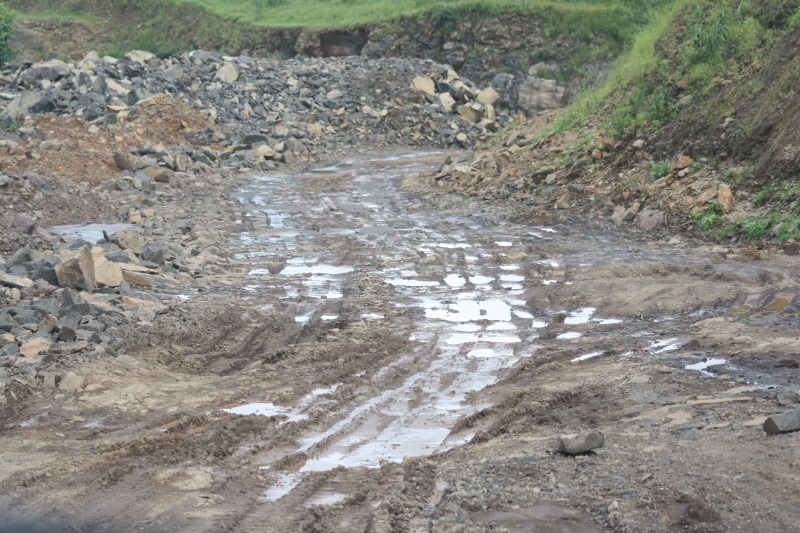 The detours at the road works as well as the gravel roads are not maintained and in a terrible condition. 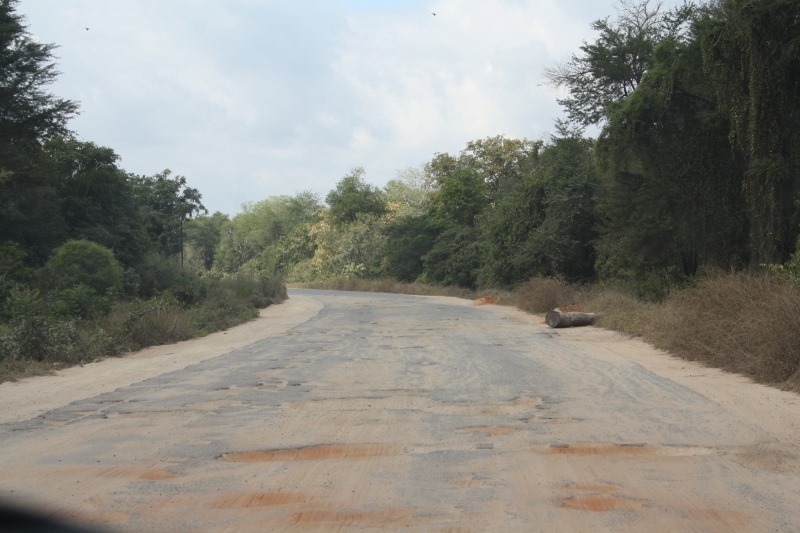 The Chinese are busy building bad tar roads all over Africa. 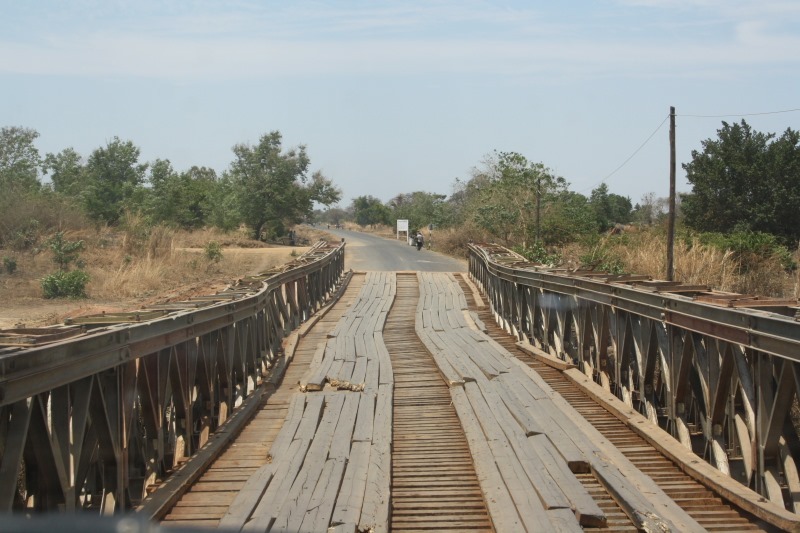 I just wonder how the African Governments think they are going to repay the money borrowed from the Chinese for the road construction . 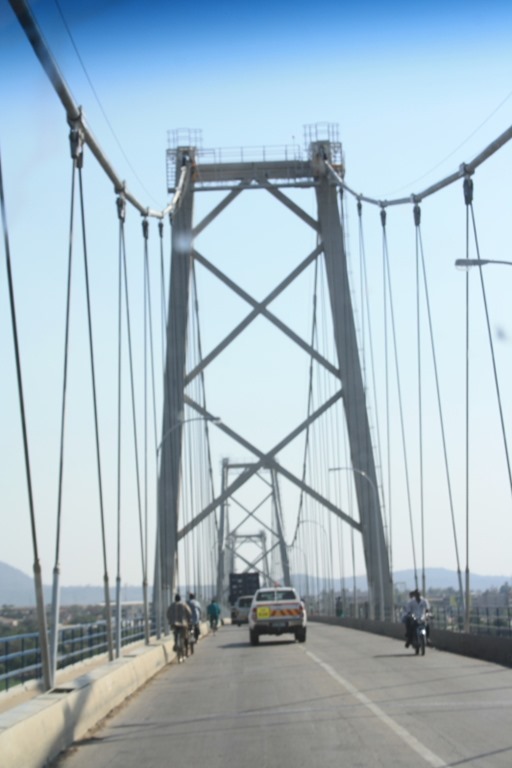 The exchange rate is 15.5 Tanzanian Shillings for R1.00 and the petrol price is R14.50 per liter. ATM’s are available and function very efficiently. 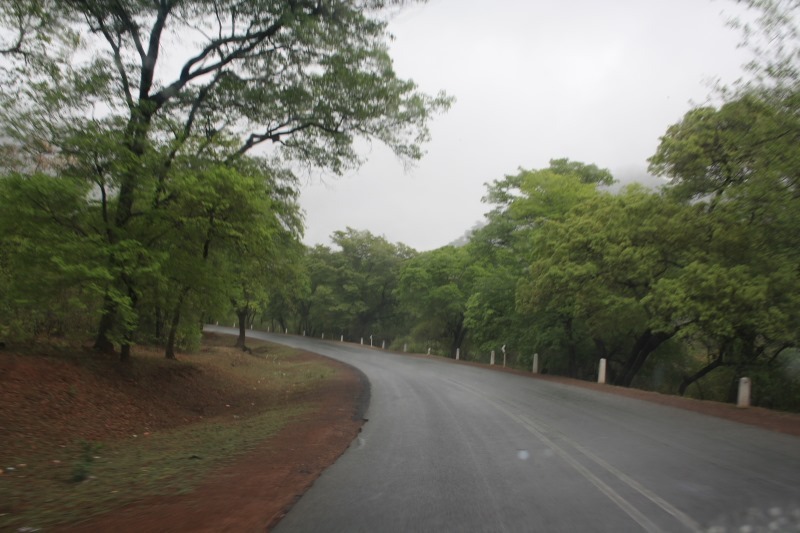 In Malawi the roads are much improved since we last visited the country in 1998. There are still parts that have potholes, but one can at least travel at a decent speed and avoid the potholes. 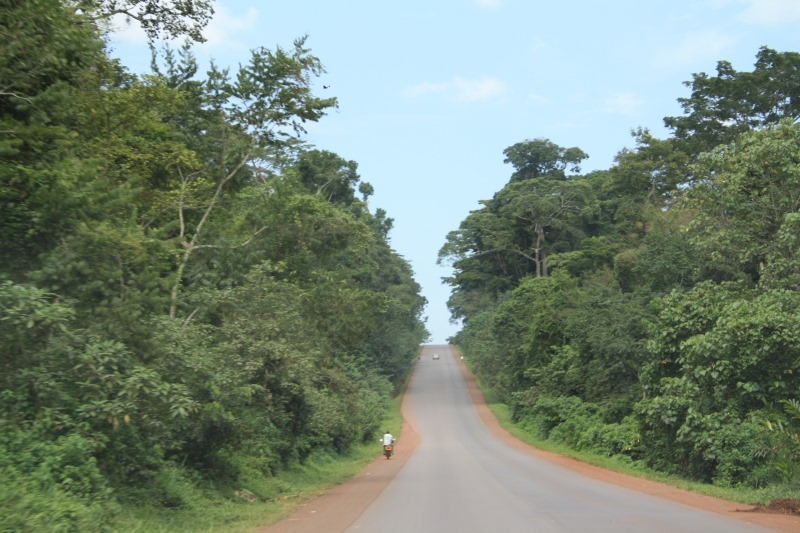 The one road that took us 3 hours to drive the 56km in 1998, is now a beautiful tar road. The exchange rate is 36 Kwacha for R1.00 and the petrol price is over R20.00 per liter! ATM’s are only available in the bigger towns. 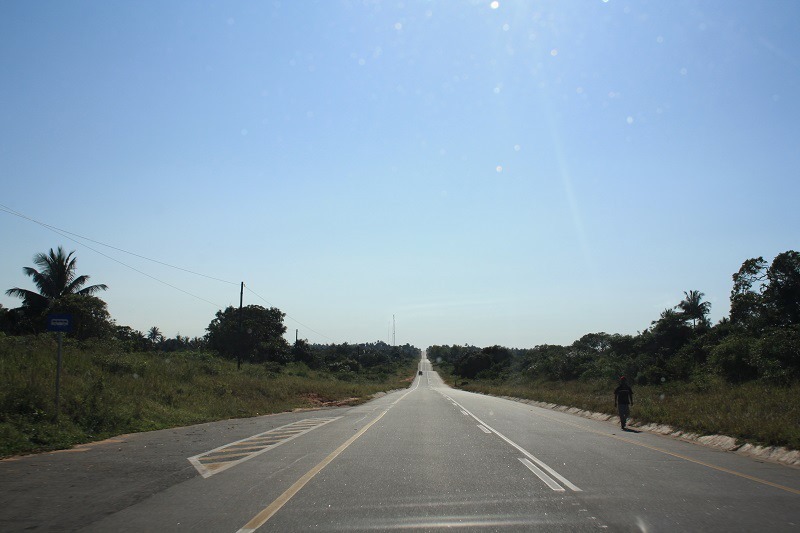 Mozambique’s roads vary from good to potholes held together by small pieces of tar! 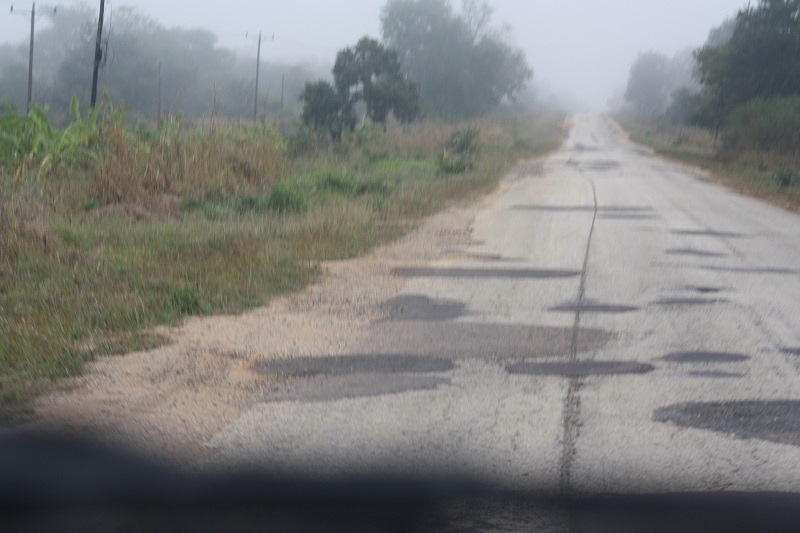 We experienced some of the worst potholed roads on our whole trip in Mozambique. Petrol is readily available and ATM’s where one can draw money, is in every bigger town. The exchange rate is about 3 Metical for R1.00. The petrol price is just under R17.00 per liter. 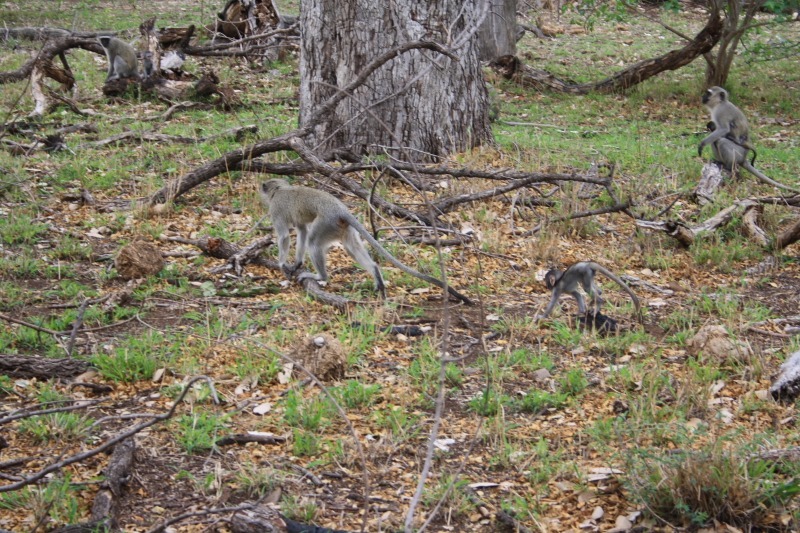 To summarise: The one huge disappointment for me on this trip was Tracks 4 Africa. They should change their name to Tracks 4 Southern Africa. The further north you go, the less one can rely on T4T for the correct info. 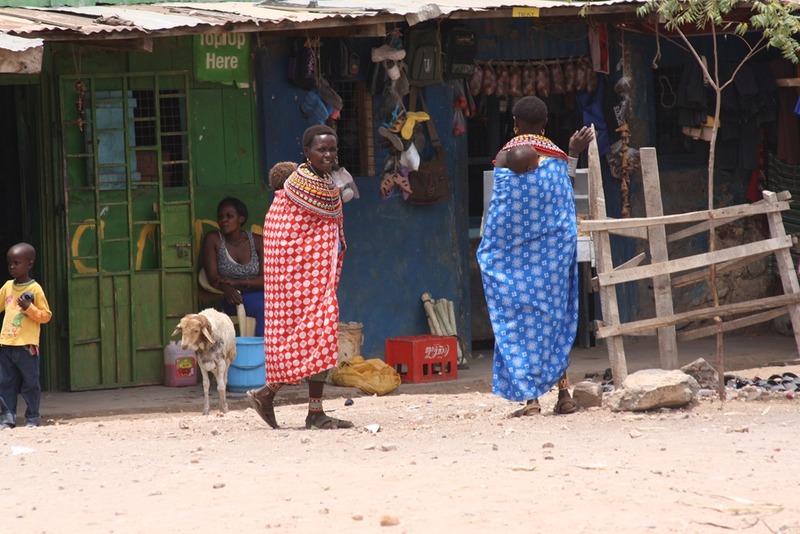 It lead us into back ally’s and slum areas when good direct roads were available. In Ethiopia it was a total disaster. It showed roads that did not exist, could not calculate distances, gave wrong info on road surfaces, etc., etc. Will definitely will have a talk with them. 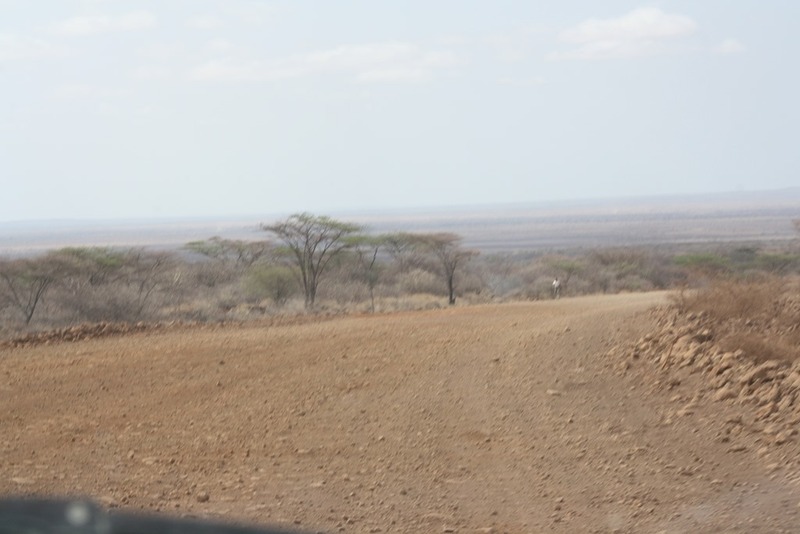 Personally, the worst road on our trip was the route along lake Turkana from Nanyuki in Kenya to Omorate in Ethiopia. The reasons are: The heavy rains……..Terrible road surfaces that very from rocky to fine powder dust to huge potholes……The fact that it carries on for four days without one kilometer of good road conditions……..The strong wind that blew the dust into the vehicle from behind, because of the fact that one can only travel at between 10 to 20 kilometers per hour. 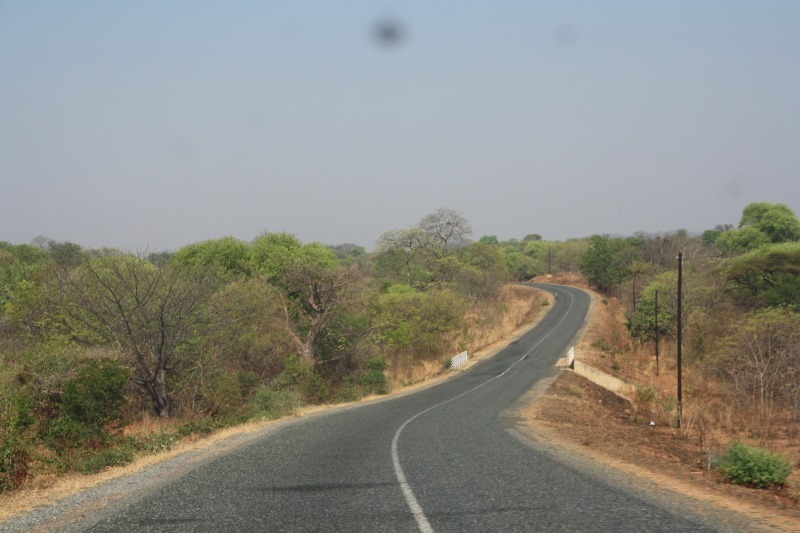 We decided that we don’t want to rush through Zambia and Zimbabwe. 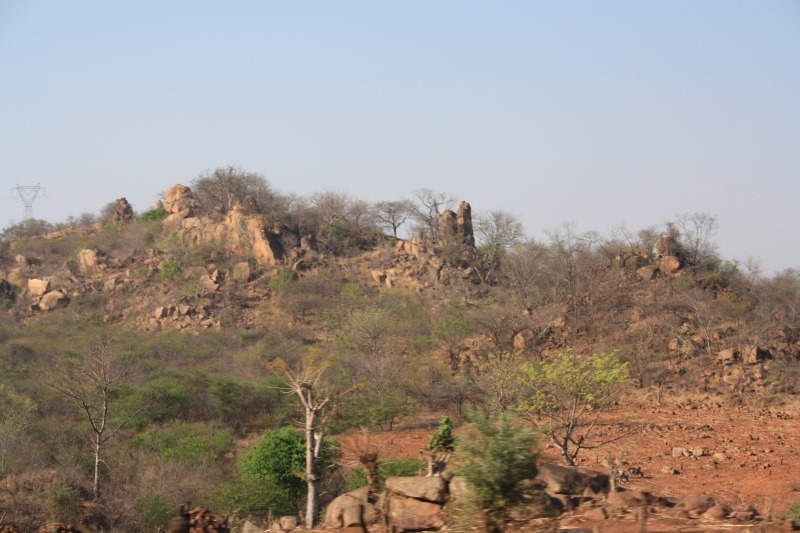 We wanted to be in Pretoria round about the 15th of November, so the decision was made to rather drive through the Tete Corridor and go to Cahora Basa for a few days rather than drive via Lilongwe to South Luangwa. 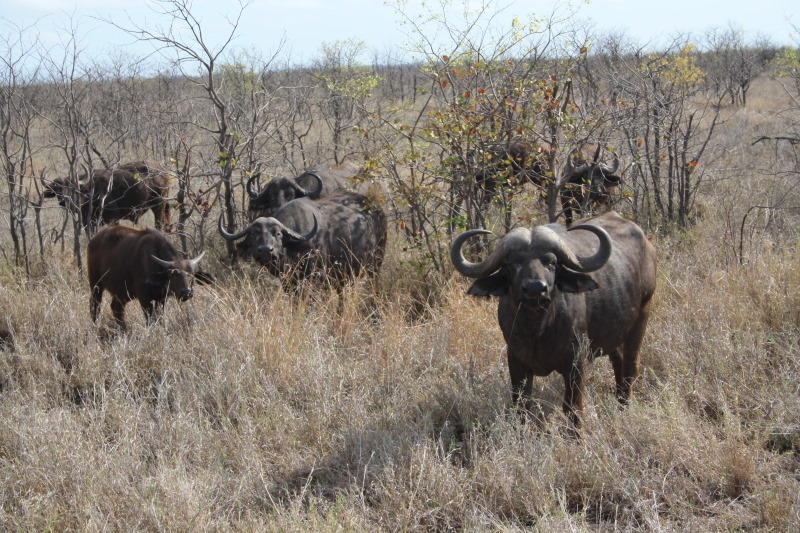 We will combine that part of our trip with the Namibia, Botswana, Caprivi, Zambia, Lake Tanganyika and back to Uganda trip that will be the second leg of our Go2Africa adventure. 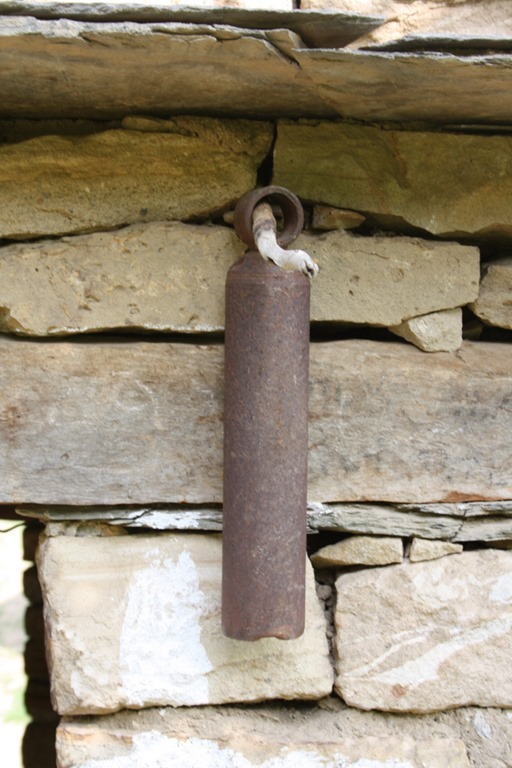 Actually the 3rd leg….., ArnizeGo2India will be the 2nd leg . 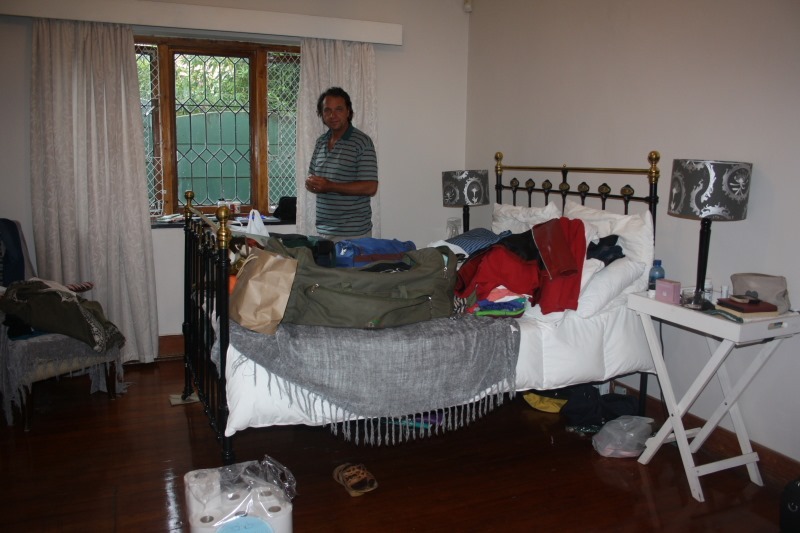 We discovered when packing up that our bed sheet that was with our washing, was missing. Arno went to look at the washing line and saw that it was on a shelf in the laundry which was locked. So, we were packed and ready to go at 5.30 but had to wait until 7.00 when the door could be opened for us. 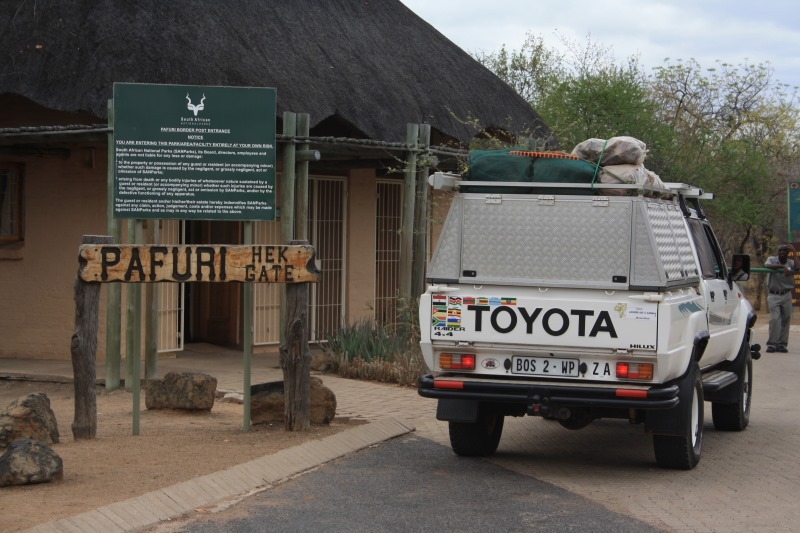 Luckily the South African party of 5 vehicles that came in the previous afternoon, were very interested in our truck and our trip and we passed the time talking to them. 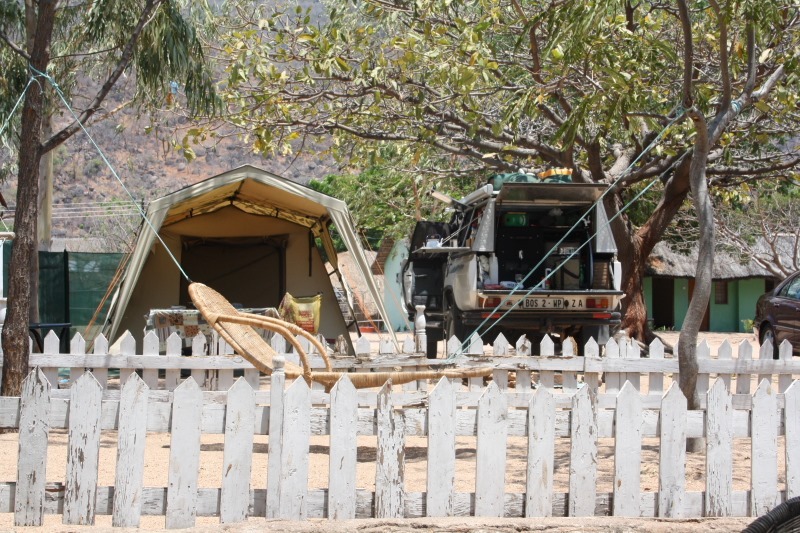 Eventually we were on the road and enjoyed driving again after the week of rest at Cape Maclear. Everything went quick and smooth at the Border post. It was a very very hot day. 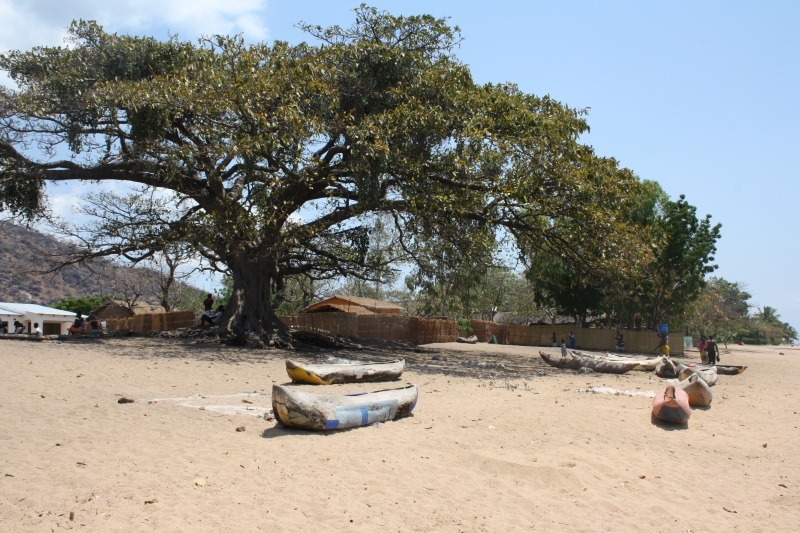 Tete is the hottest place in Mozambique and we experienced that for sure. 44 Degrees!! 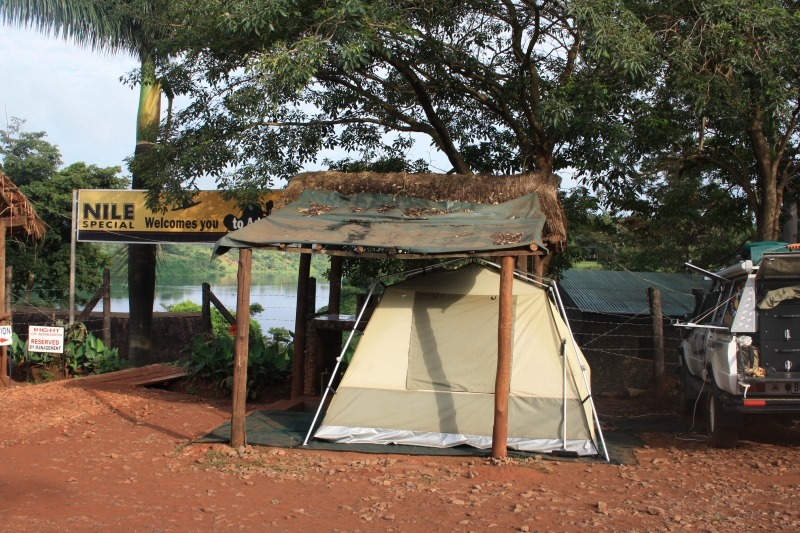 We crossed the mighty Zambezi and got a camping spot in the garden of the Misteriosa Lodge overlooking the river. 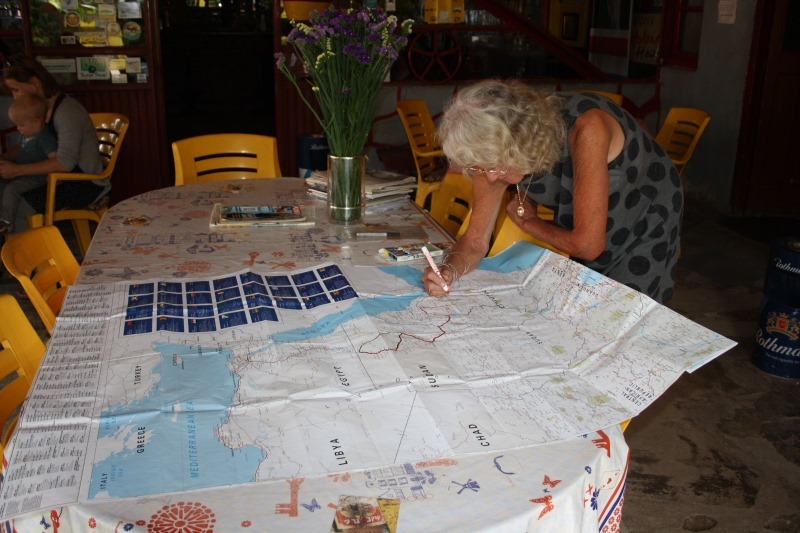 We had M2 and a delicious pizza for dinner and were ready to drive on to Cahora Basa the next day. 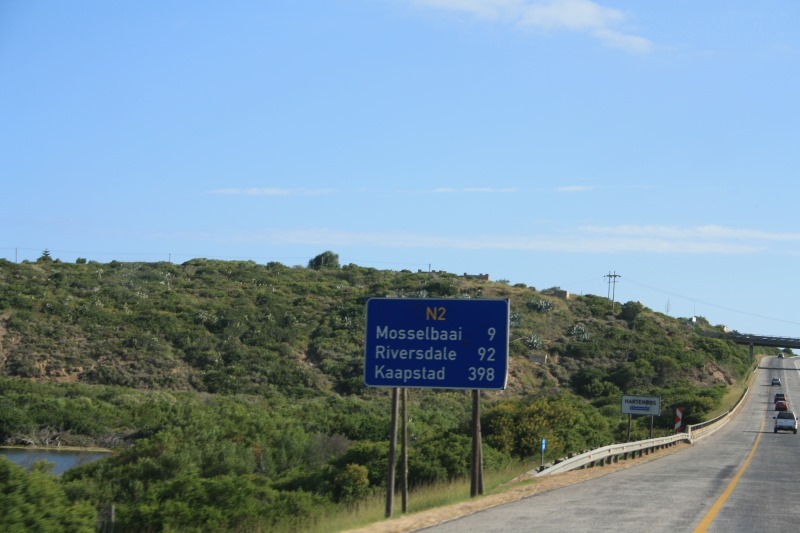 Driving south made it clear for us that it is time to move onwards….south! We couldn’t stop. 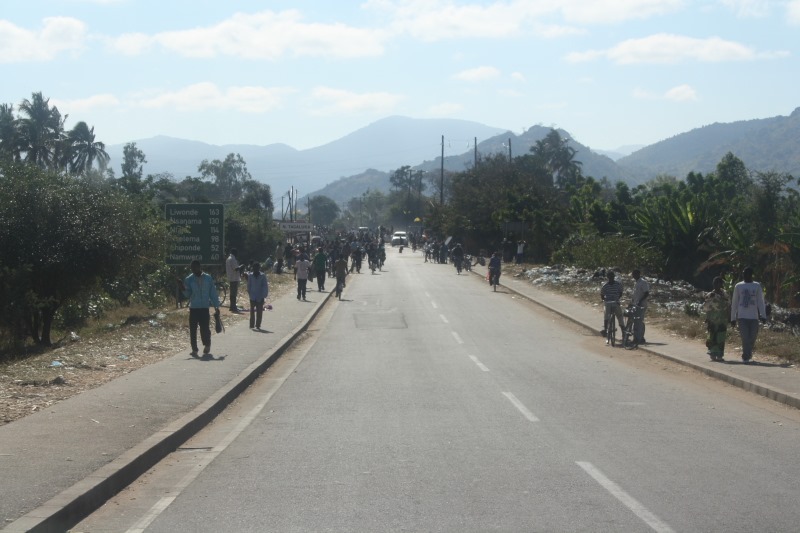 We were quite early at the Mozambique/Zimbabwe border. 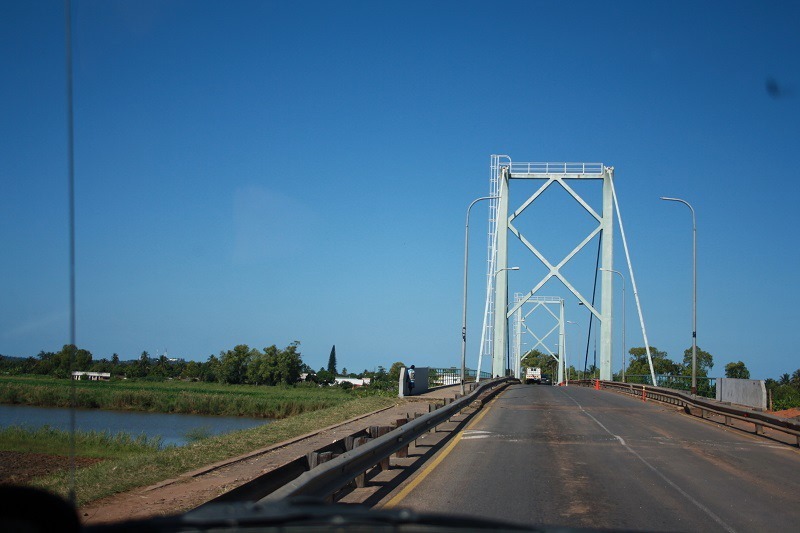 We went through so many Border posts and saw, heard and experienced crazy to utterly stupid things but it is still a mystery to me why the Mozambique Immigration officer chased me out of the office, NOT going to stamp me out because I could not give him an ADDRESS of where we are going to stay in HARARE, ZIMBABWE. What on earth does it matter to HIM where I am going to stay in another country. Well, we invented a name and viola, were stamped out of Mozambique. We had a little commotion on the Zimbabwe side when an European couple wanted to jump in front of the queue we were all standing in and the Zim guy with dreadlocks in front of me complained. An officer came to me asking if I was with a bus and that I must fall in at the back of the queue when a Zim lady came to my rescue biting of his head, telling that I stood in the queue all the time but THOSE people are trying to press in. 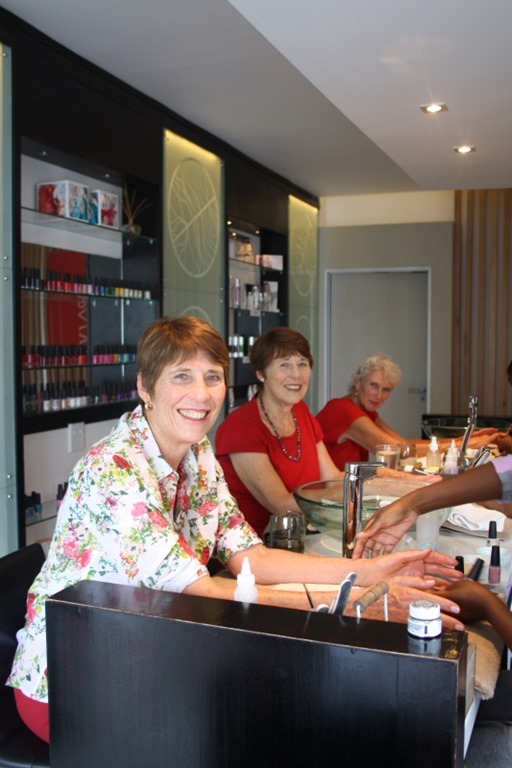 It was fantastic to see how skin colour vanished and everyone stood together for what is right. They obviously bribed the officer to get them in front and it really boomeranged on all of them. I had this warm feeling of being an African, belonging here! 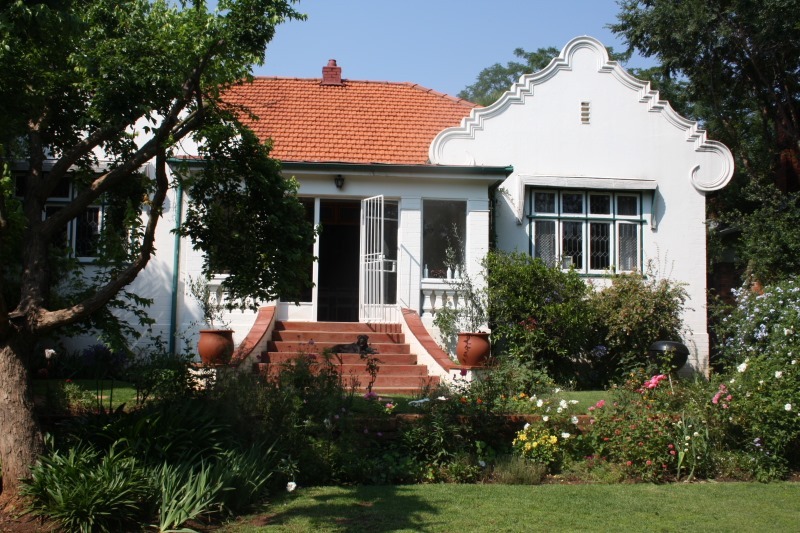 We stayed at “It’s a small world Backpackers Lodge in Harare which we can really recommend. It is quiet, clean and modern. They also have an art shop and we camped between the iron elephant and the iron chickens and ducks . 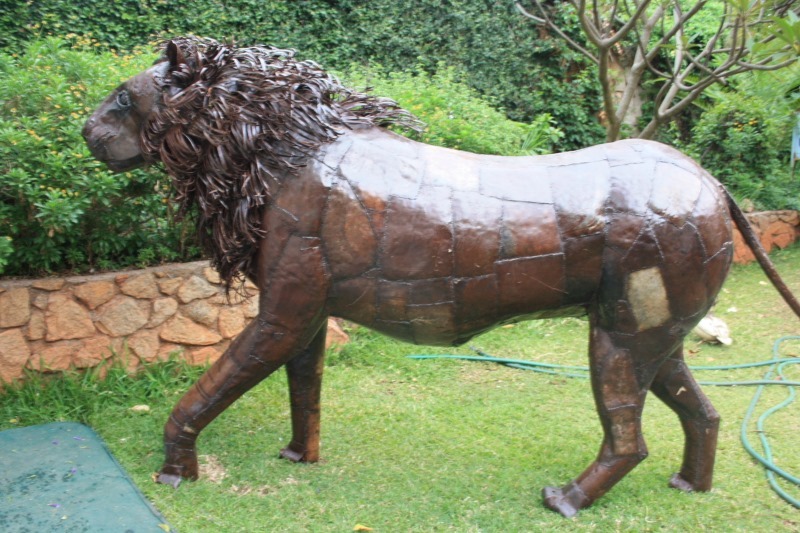 We had a HUGE shopping experience in Harare and even bought APPLES and BILTONG! 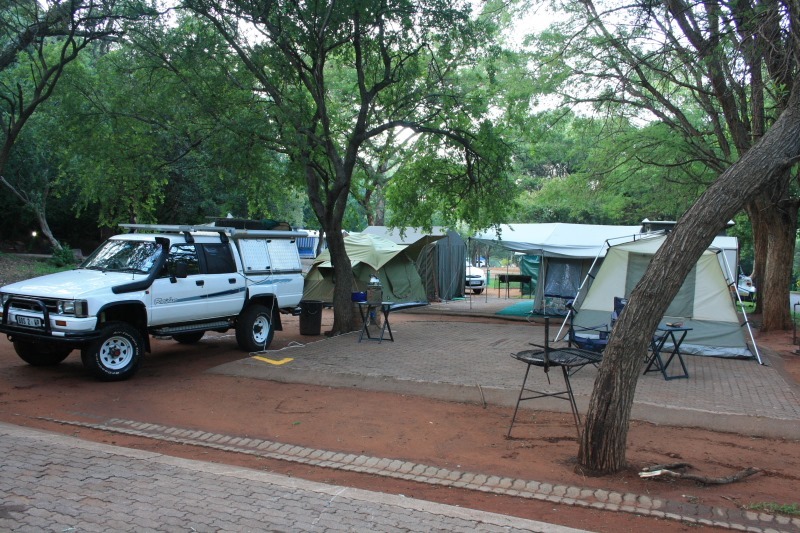 We were going to camp at the Bubi River’s, Lion and Elephant Lodge on route to Beit bridge but when we got there we saw that the campsite is next to the main road and that sleep will be impossible with all the trucks passing by. 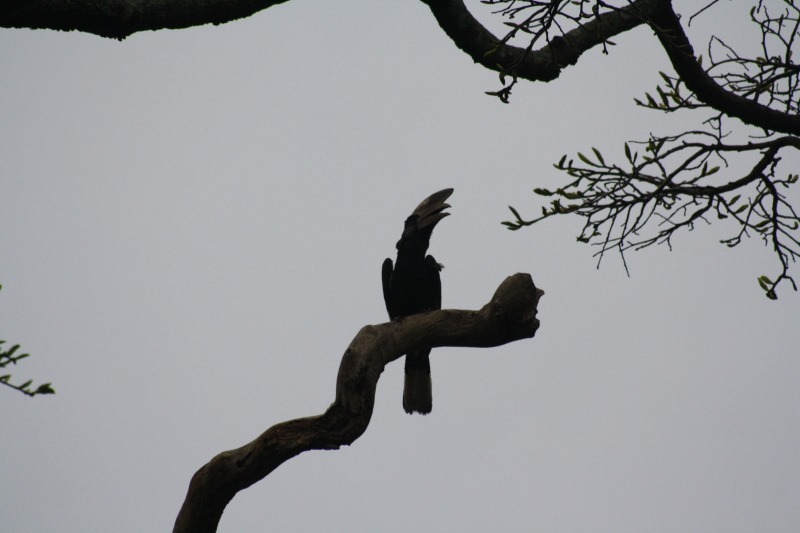 So….south we went!! By now we were far before our schedule and start wondering where next? 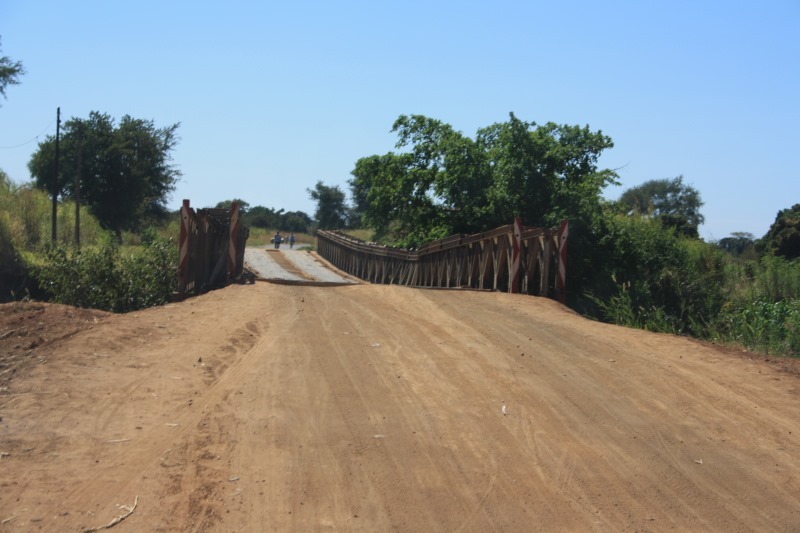 The Zimbabwean Border at Beit Bridge was quick and easy except for them sending you from one window to the next and back again after our Passports being stamped out, paying for crossing the bridge over the Limpopo etc.etc. 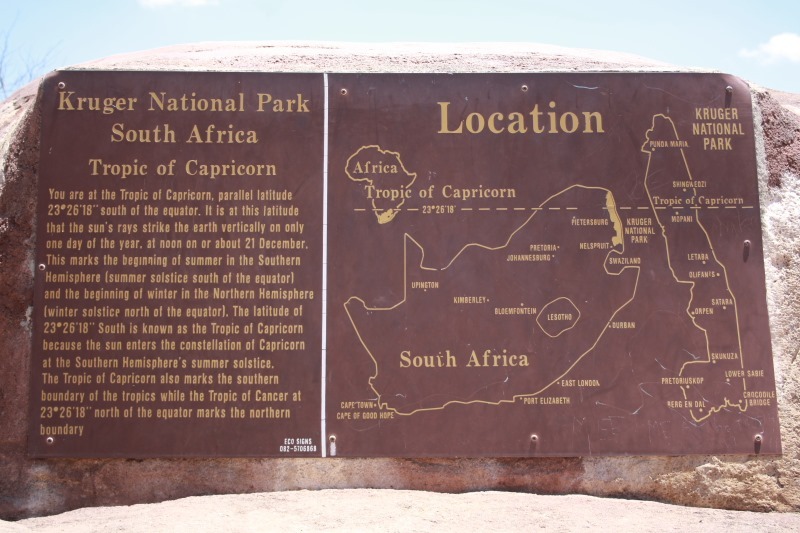 The South African side of the border was a bitter disappointment for us. It was quiet at the border post. We were part of about 6 people going to the RSA. There is a window marked for South African citizen’s coming back and the 2 of us stood there for about 10 minutes while officers were chatting to each other, walking up and down on the other side of the window. An officer waved us away with a “we’re not stamping here, stand over there”. We had to queue behind Zimbabweans that had to fill in numerous forms etc. After about 30 minutes we were stamped in and then had to wait another 30 – 40 minutes behind the Zimbabweans who had to fill in temporary import permits for their vehicles, waiting for the lady to stamp our Carnet de Passage. The other officer were just sitting around doing nothing. 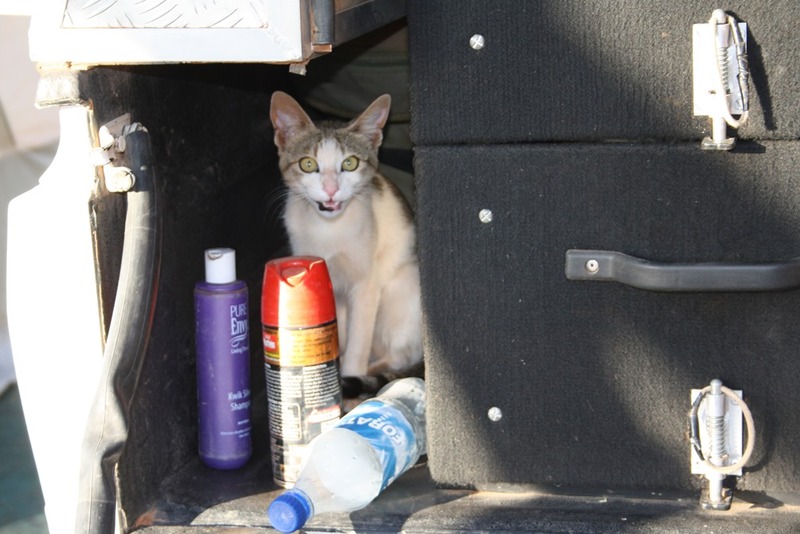 The officer (doing nothing for 30 minutes) finally came to the window and we asked if she could help us with the Carnet. Her answer was “O did she not help you? 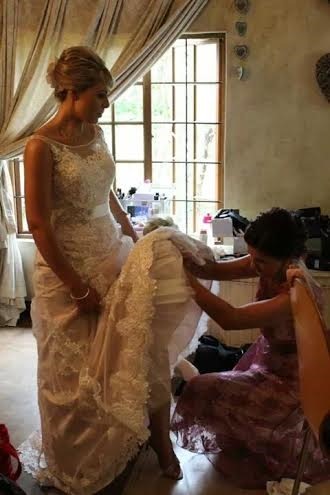 Duh…why shall we be standing here if she helped us?!! So she stamped our Carnet (took 5 seconds) and we were released in our homeland, the land of milk and honey, the good old RSA!! Eish!!! We decide to buy a few groceries (in Afrikaans and Rand ) for the cheapest prices ever (the last 7 months in any case). 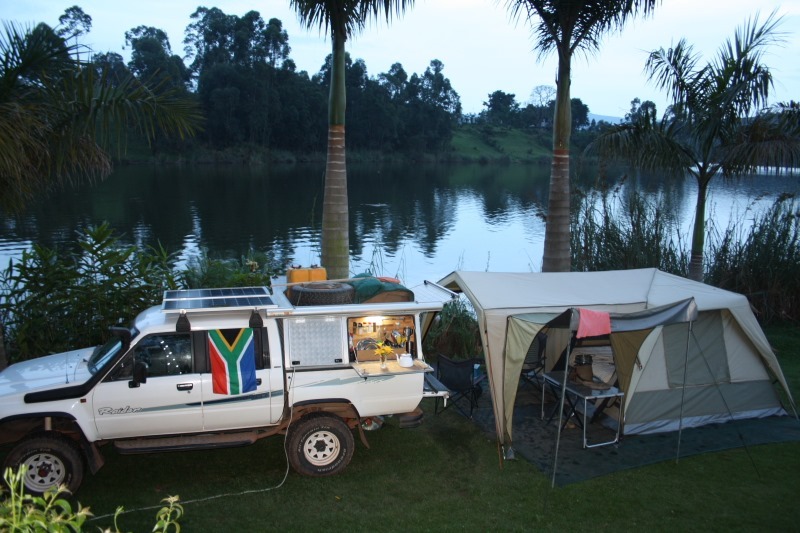 We went to Tshipise and camped there for 5 nights. We were sad but happy. 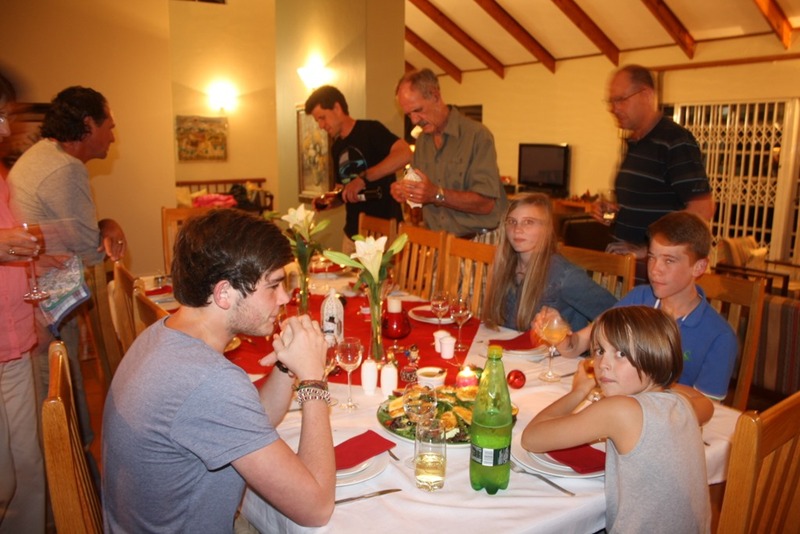 That sounds crazy but we were sad that the adventure part were over but it was glorious to be back in South Africa. But we were restless. We had to process our experience and that is not so easy. 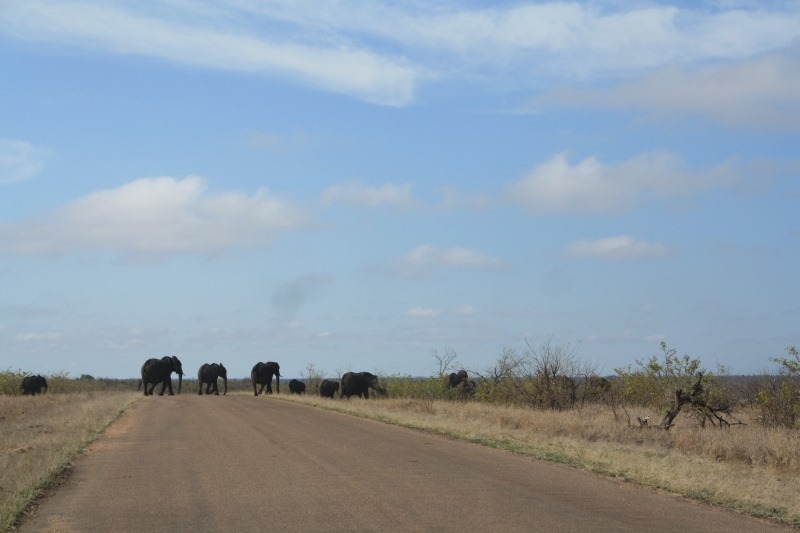 We decided that we need the Kruger National Park, so here we are. 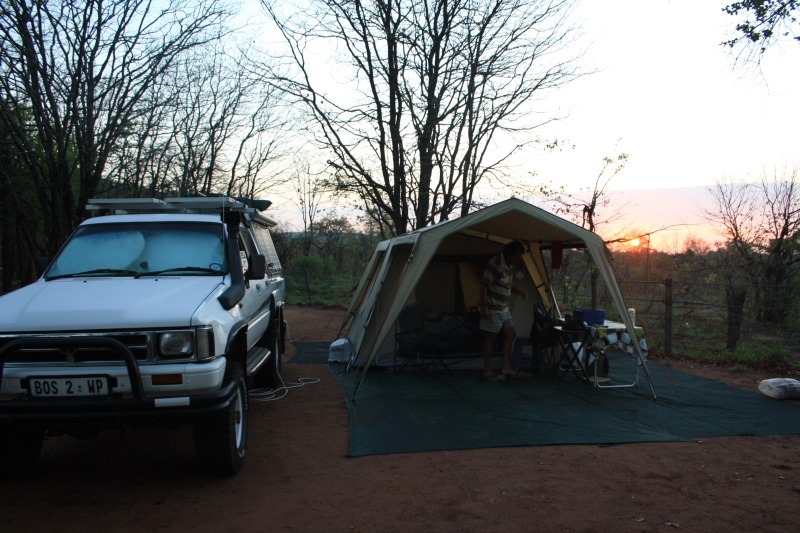 We came in at the Pafuri Gate, camped at Punda Maria, Tzendse (where an elephant visited our tent and broke down the tap next to the tent) and is now at Letaba camp. Our emotions are now finally under control. 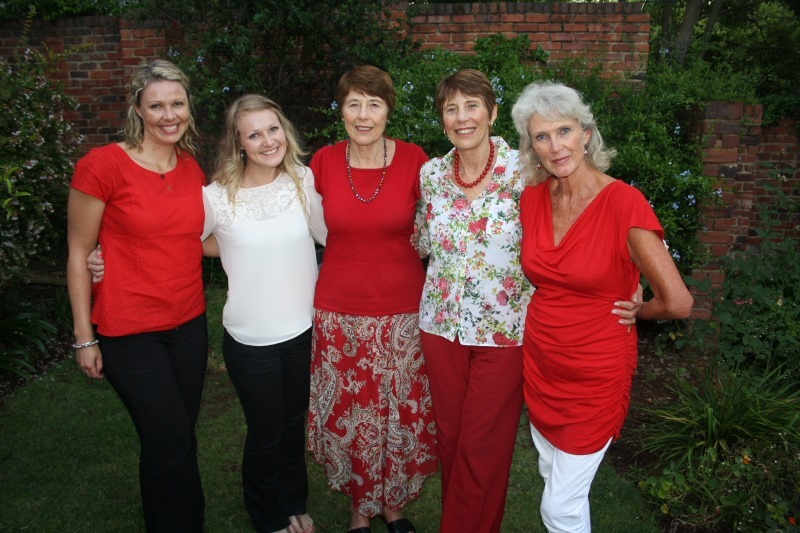 We are reminiscing about the trip and are looking forward to the next 2 months of travelling in our homeland before we continue our African circuit. 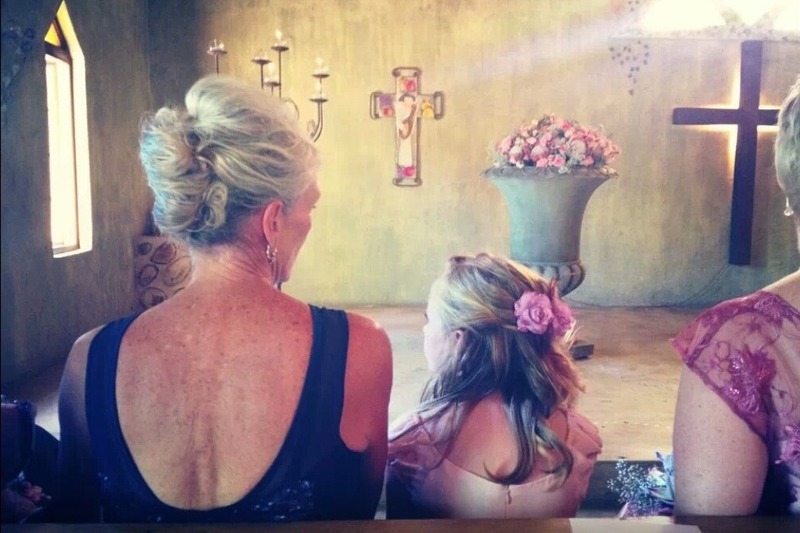 We will visit with children, family and friends, enjoy a wedding, Christmas with children and grandchildren, go home for a few days, just to begin the rest of the journey. The blog will go on. 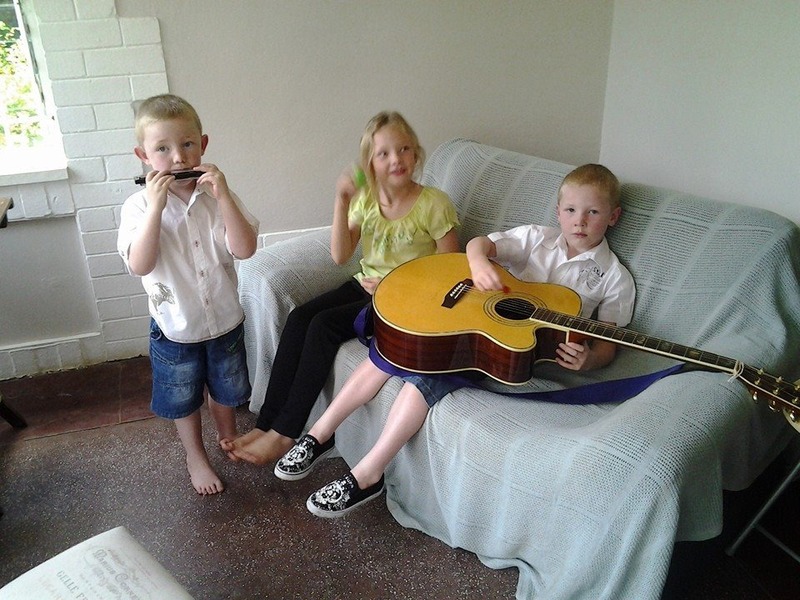 We will do a Postscript of the whole trip and will write about the pleasures of being part of the family circle again. Exciting times awaiting us. 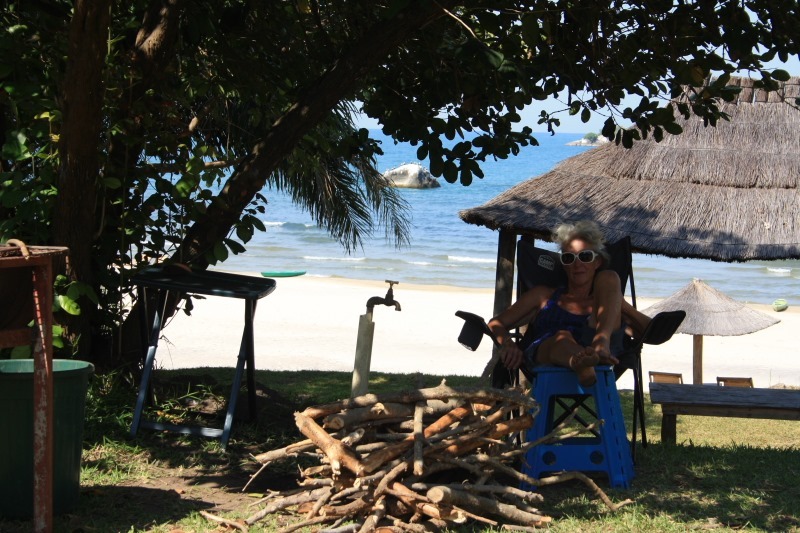 So here we are….back in Malawi. 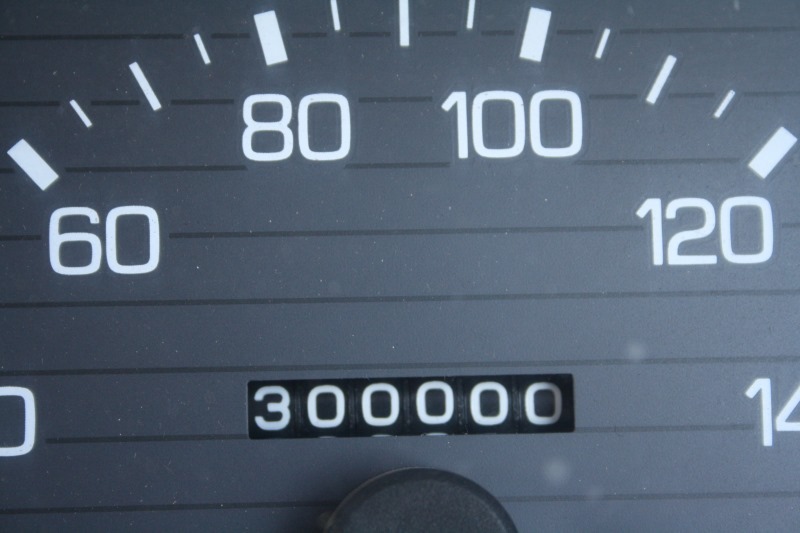 En route between Iringa and Mbeya, the Hilux’s odometer turned over to 300000km!!! 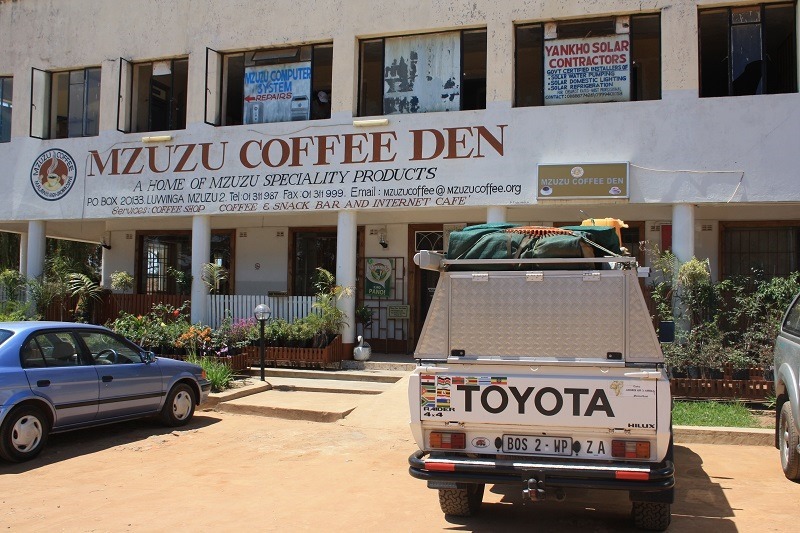 We had a small celebration with green tea and jam tarts in front of the truck, telling each other and the Hilux how a fantastic vehicle this is!! The border crossing was quick and easy on both sides. 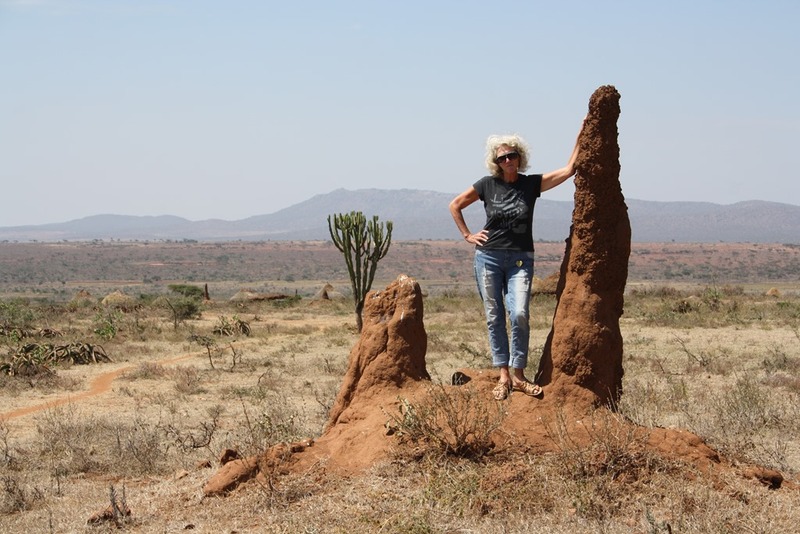 We camped at the Taj Motel Campsite where the ants moved in with us for the night! 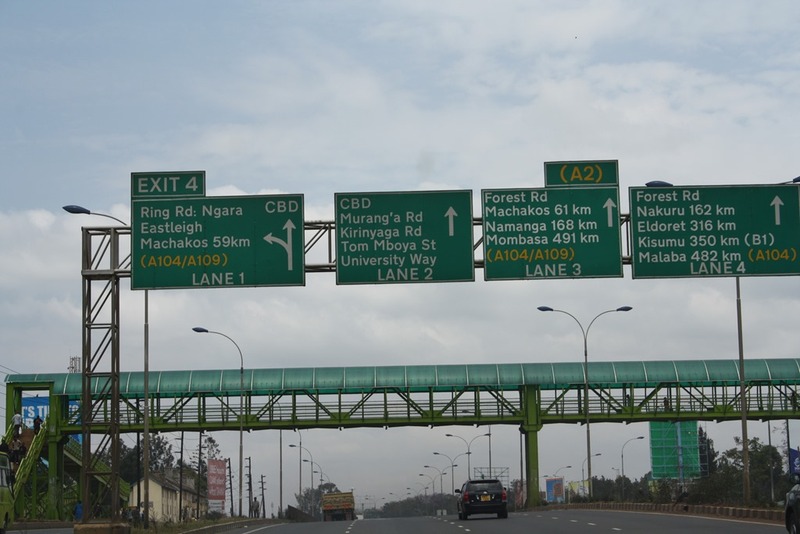 By now we are so used to Nairobi time that we naturally wakes at 4:00 in the morning and by six we hit the road. 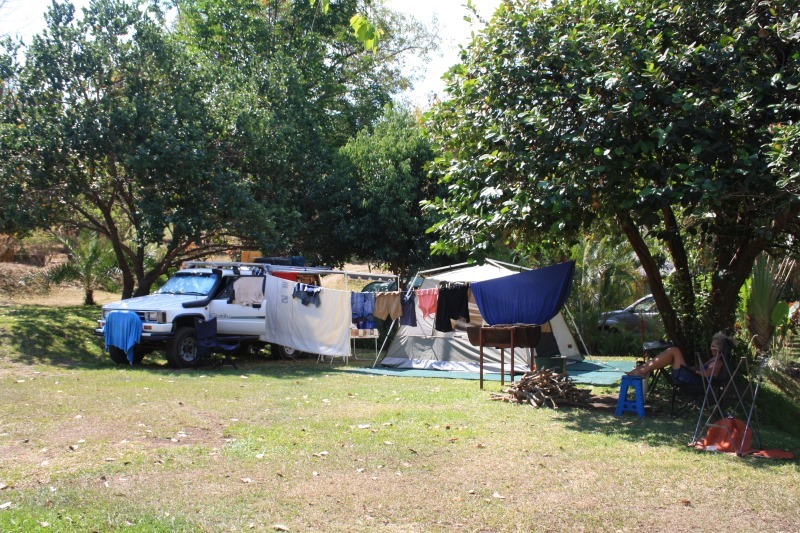 We camped at Hakuna Matata at Chilumba at the foot of Livingstonia for 2 nights. The owner is a South African guy by the name of Willie Louw. We could have a hot shower and there are actually mirrors in the ablution!!! 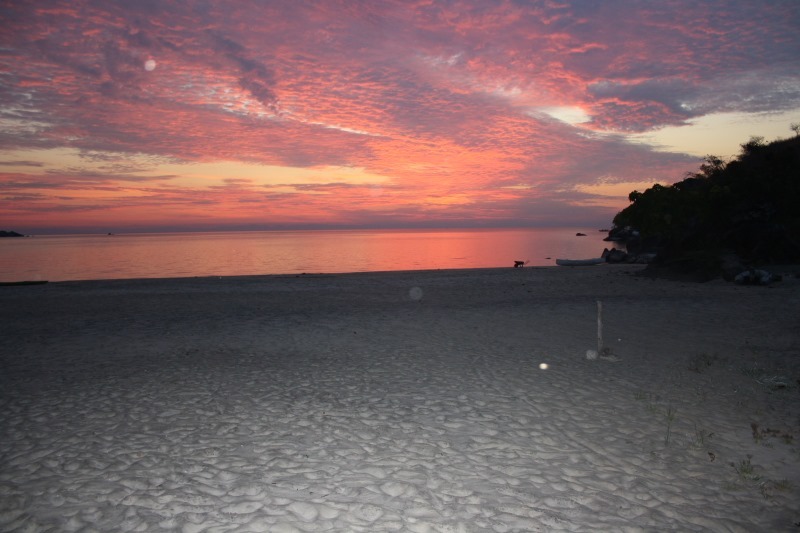 We thoroughly enjoyed walking on the beach, looking at the sunrise and we finally found the Southern Cross again! 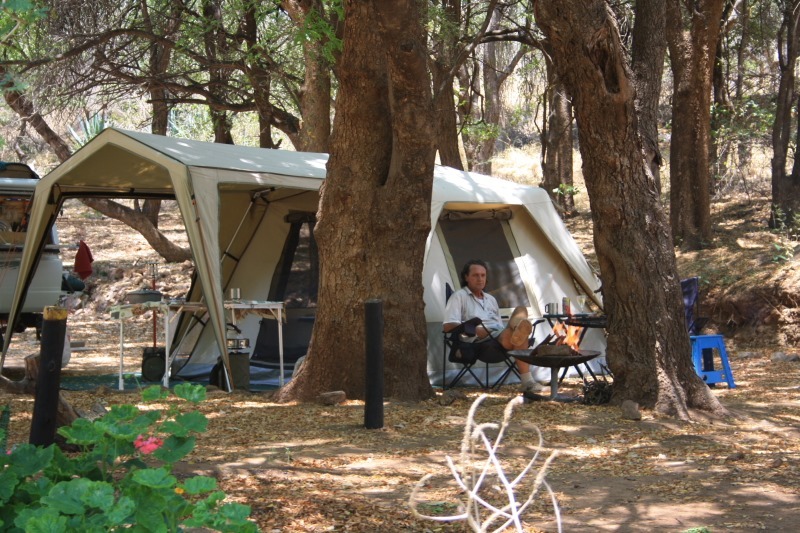 We could make a real wood fire, braai steak, make roosterkoek and RELAX! 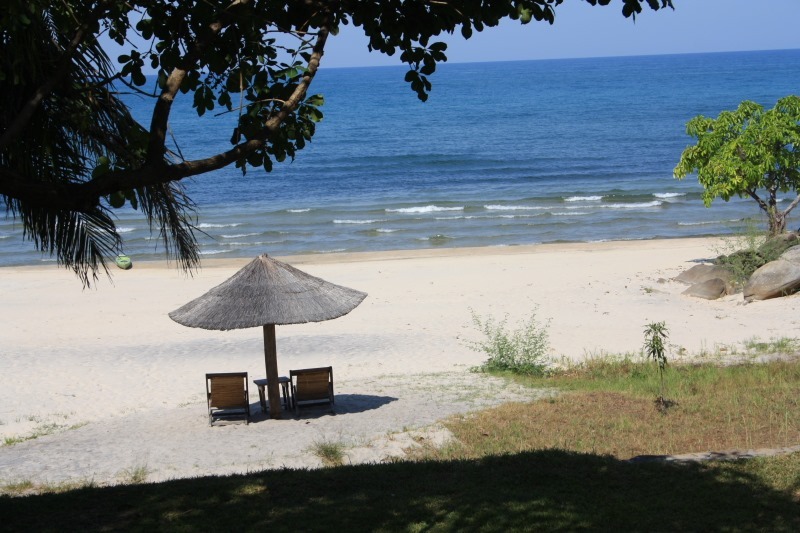 We updated the blog in the Coffee Shop in Mzuzu and moved on to Makuzi Beach where we stayed on our way up north. Again it was like a homecoming with Richard welcoming us. 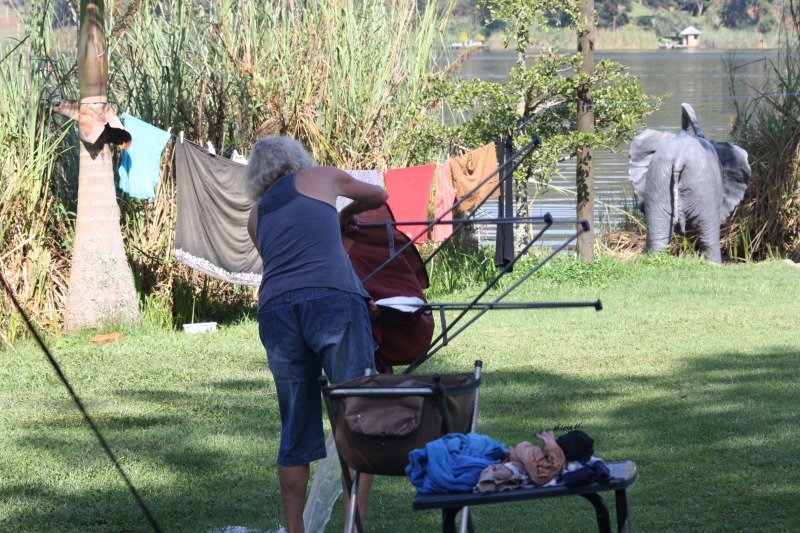 It turned out that it was a long weekend so we were part of a whole Afrikaans speaking colony of Lilongwe citizens and again a lot of local Dutch people. 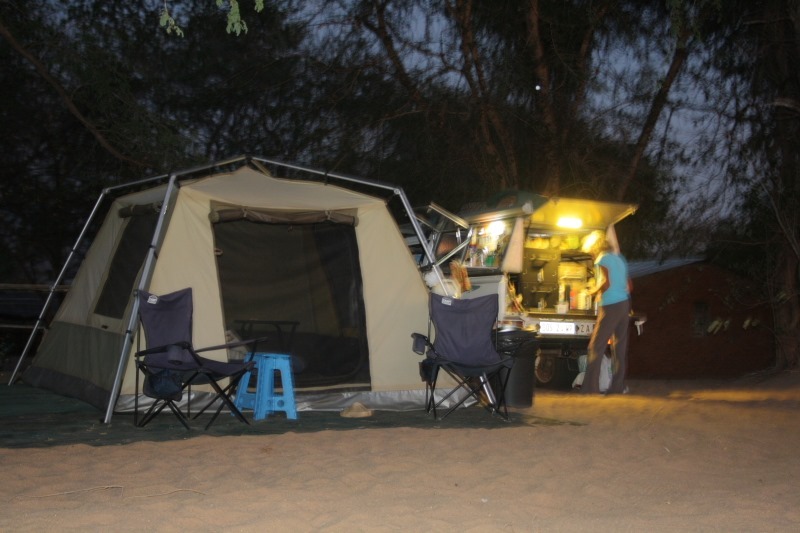 We stayed at Makuzi for 3 nights working our way down south slowly but surely. 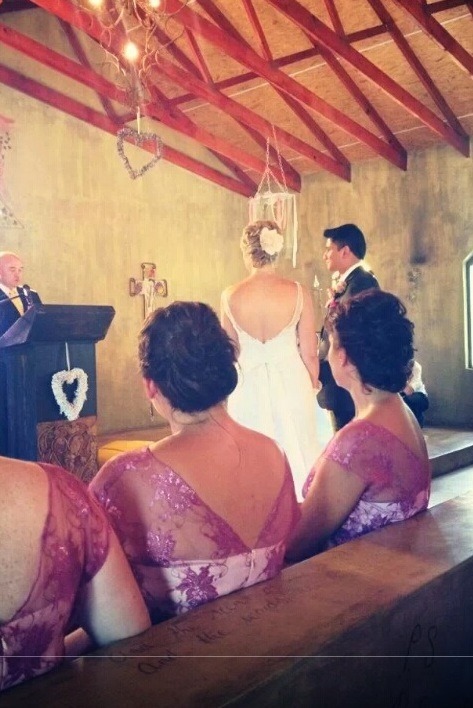 We have after all a wedding in Pretoria in December and wants to be there well in advance. 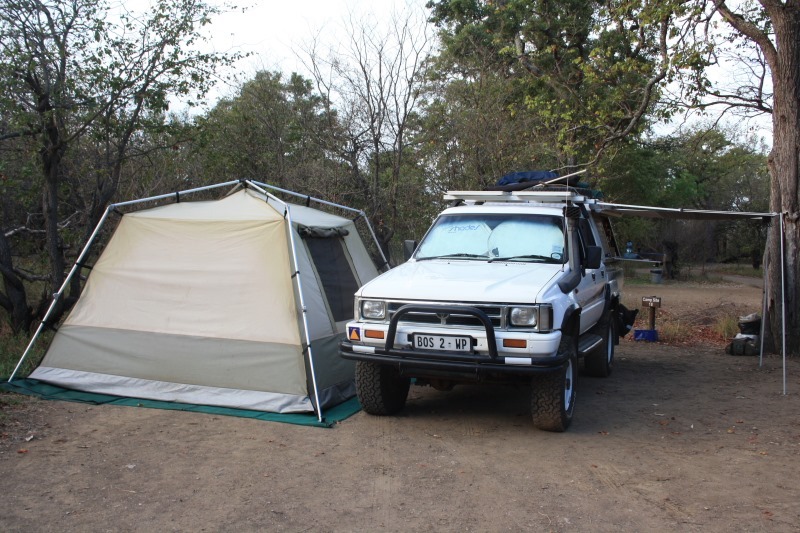 At this stage the plan is to go from Malawi to South Luangwa, Zambia and from there to Lake Kariba driving to South Africa and Pretoria through Zimbabwe. 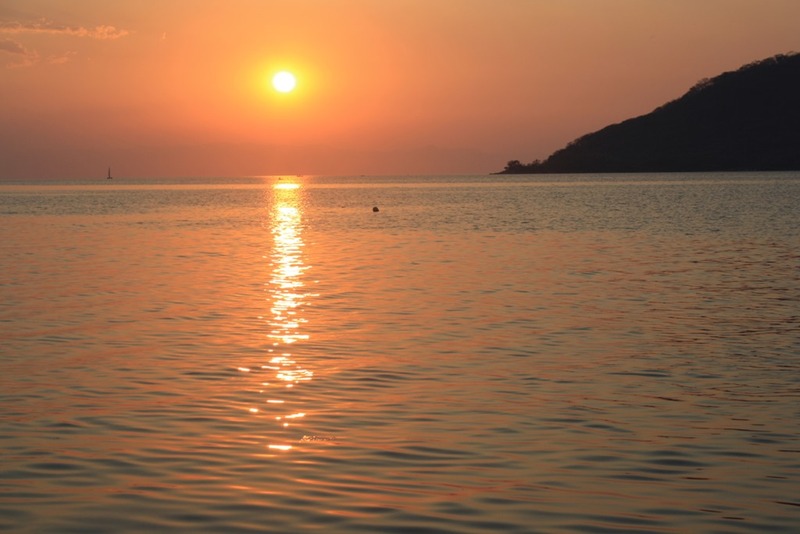 We are still enjoying the lake of stars though and the decision of which route we are taking home will be finalised at a later stage. 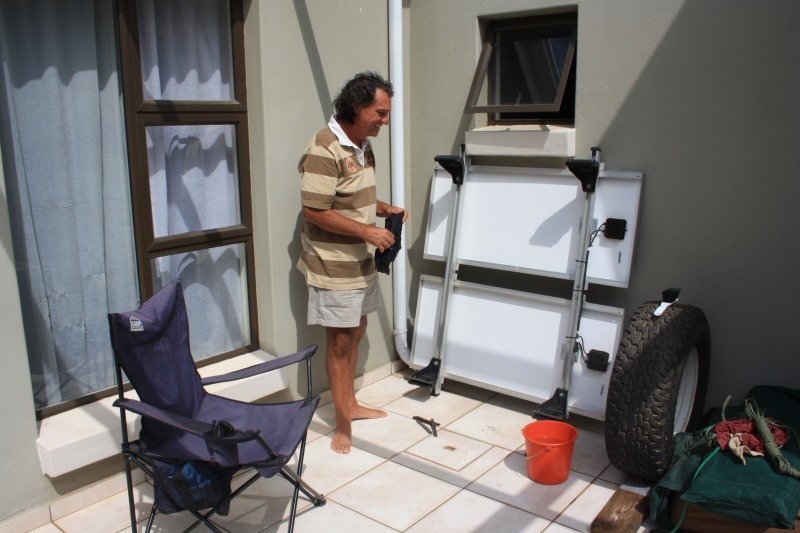 Washing our camping equipment after 3 months of rain and desert storms! 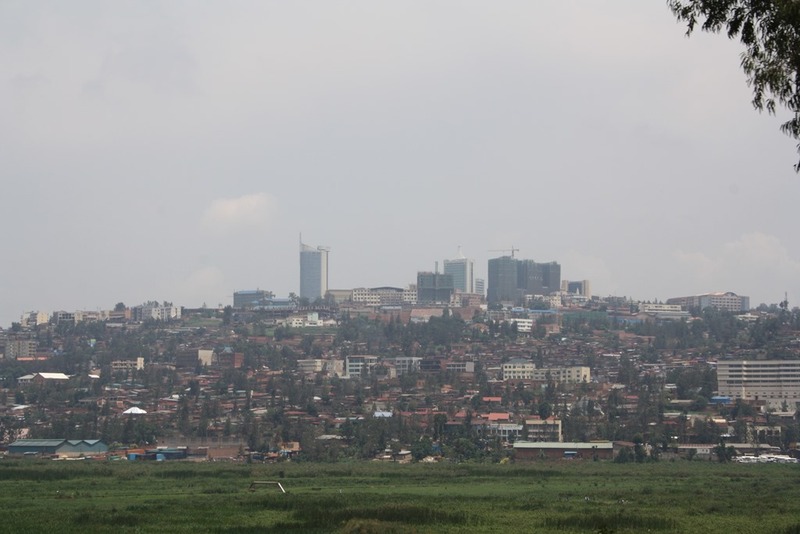 We left Kigali at 6 in the morning on the 1st of October. We were chasing the sun so decided to drive as far and as quick south as possible. 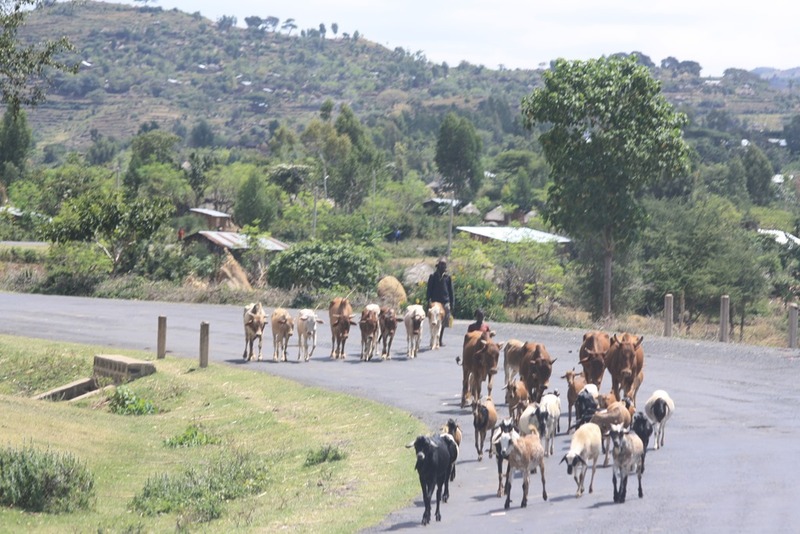 Our goal was The Old Farmhouse 50kl outside Iringa towards Mbeya. 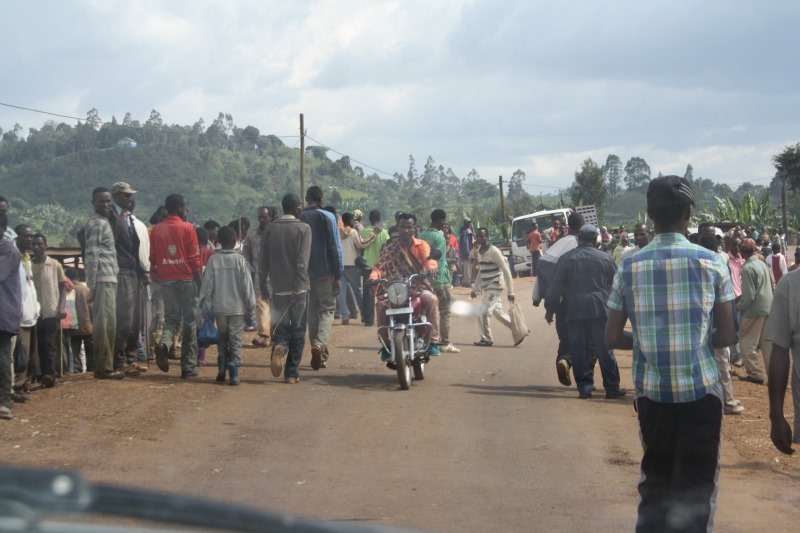 We again had an easy border crossing between Rwanda and Tanzania. We were heading to Kahama where we wanted to overnight. 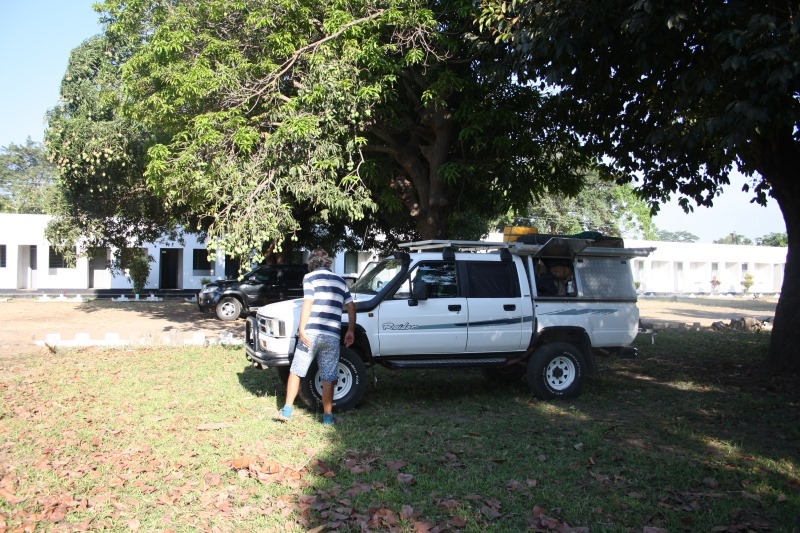 When arriving at Kahama we stopped in front of the Kahama Motel and guess what happened……? The heavens opened and the rain came down in torrents. Within seconds, NOT MINUTES, the street were flooded. The downpour became less after 20 minutes (we were sitting in the truck) We jumped out in front of the Motels porch getting soaked to the skin in 5 seconds!! There we stood looking at the truck, not able to get to our things. After half an hour of torrential rain it suddenly stopped and we could get our bags out of the truck. We ordered chicken and chips from the restaurant. 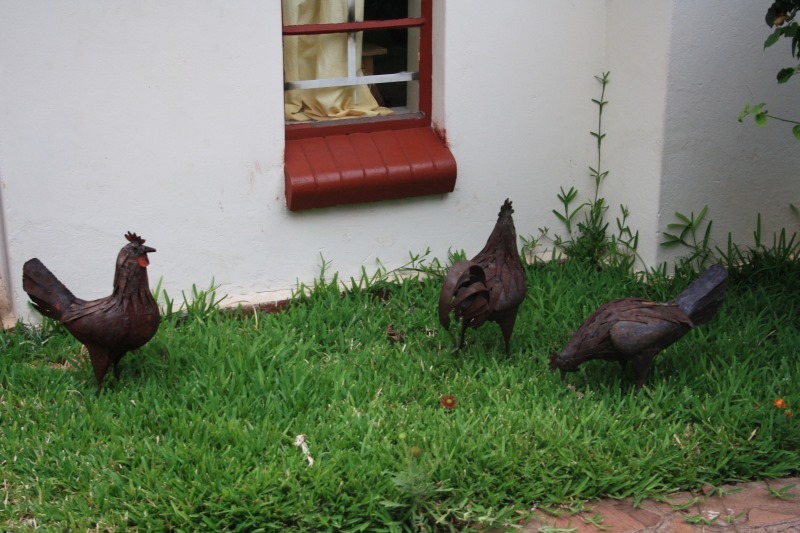 The chicken were one of those that were built for speed……. ! Arno enjoyed the chips though.The manager insisted that the price of the room includes breakfast although we told him we want to get away very early the next morning, but he insisted we wait for breakfast at 7. At seven the next morning we were ready to go and I asked a young man hanging around where we can get our breakfast. He took us to 2 chairs and a small table outside and told us to sit down. He brought a tray with 2 cups, a tin of coffee and a bowl of sugar. He then brought us each ONE minuscule samoosa….and that was breakfast . I must admit, it was a delicious samoosa. We thought it was hilarious. 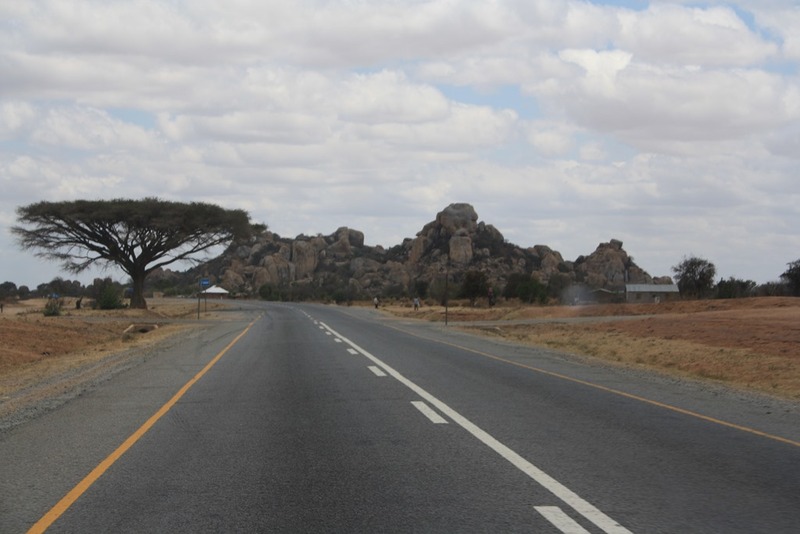 It was a long drive to Dodoma but because it is a newly tarred road, easy driving for the truck and driver. 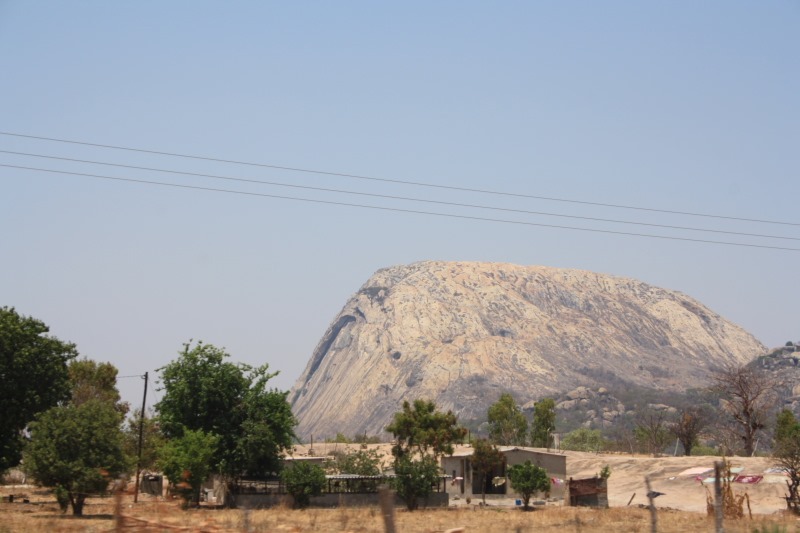 We stayed at the Ulanga Lodge opposite Toyota in Dodoma. 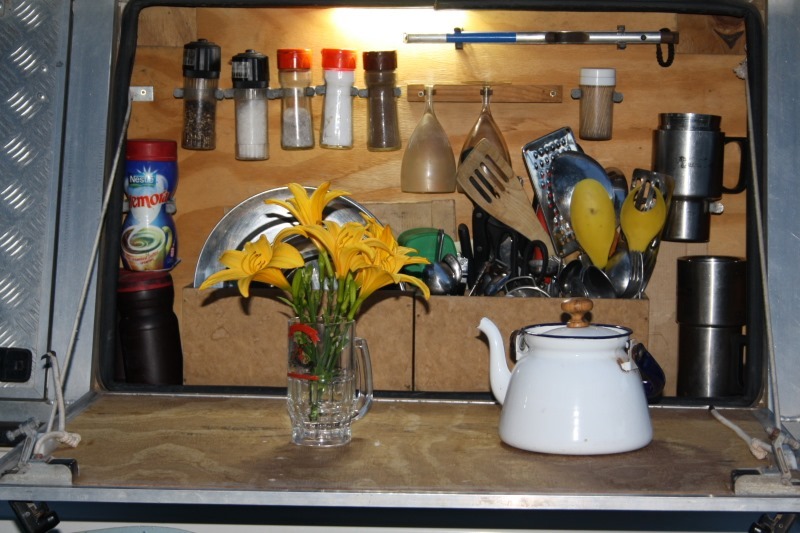 We took our chairs, sat next to our truck and I cooked for us. It was our first dry evening in we can’t remember how long. 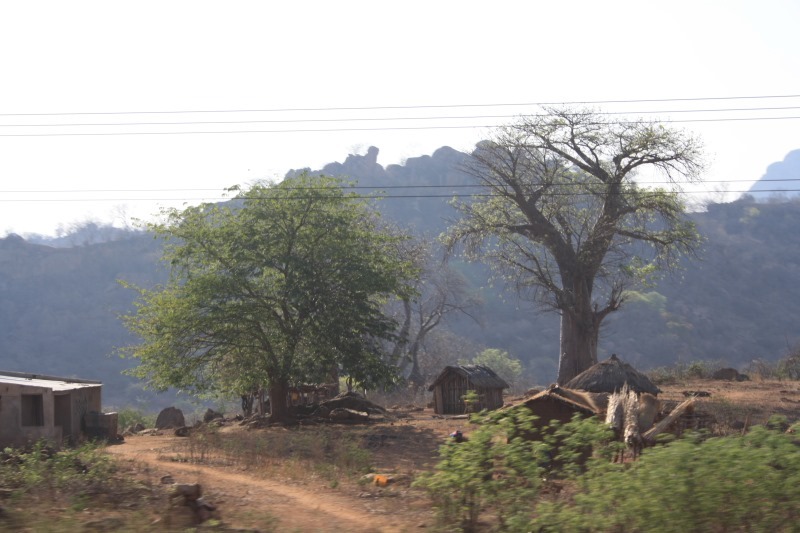 We left Dodoma at daybreak the next morning with the wonderful memory of how nice it was to stay at The Old Farmhouse on the farm. when driving north. 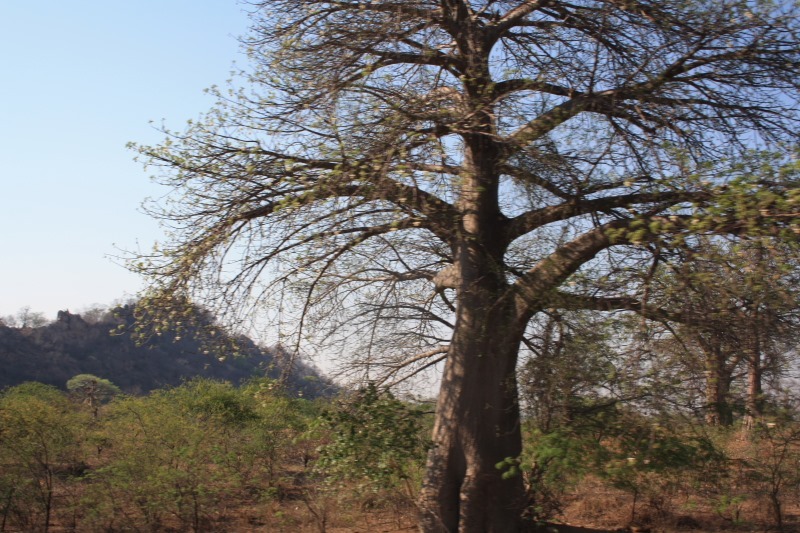 Dry, sunny, bushveld, typical Tanzania bush, francolin calling, birdcalls early in the morning, southern hemisphere stars like the southern cross……We could’nt wait to arrive there. 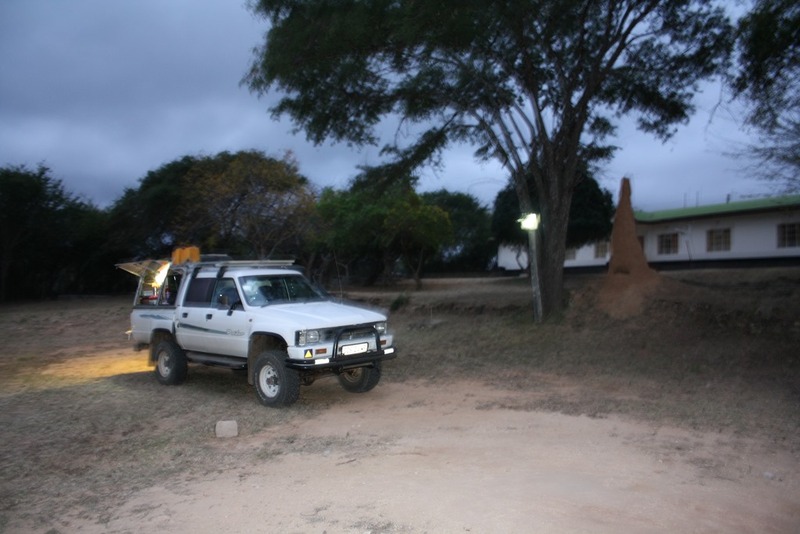 After drawing money and downloading emails in Iringa we arrived at our campsite. It was as good as remembered except that it was heavily overcast and COLD! Well, it seems that summer has not yet fully arrived here. 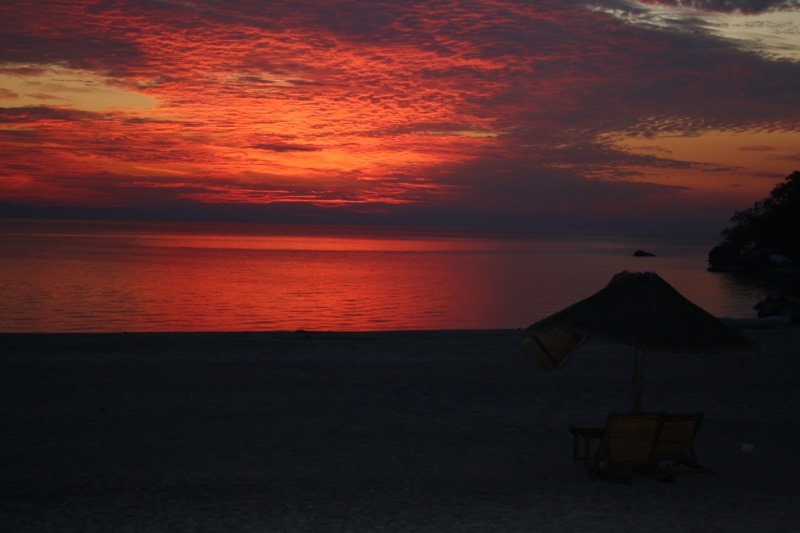 Nights are cold, mornings are very cold till the sun burnt away the clouds when it is very nice. We bought fresh veggies here, stocked up with fantastic T-bones, chops and in general have a wonderful stay here. 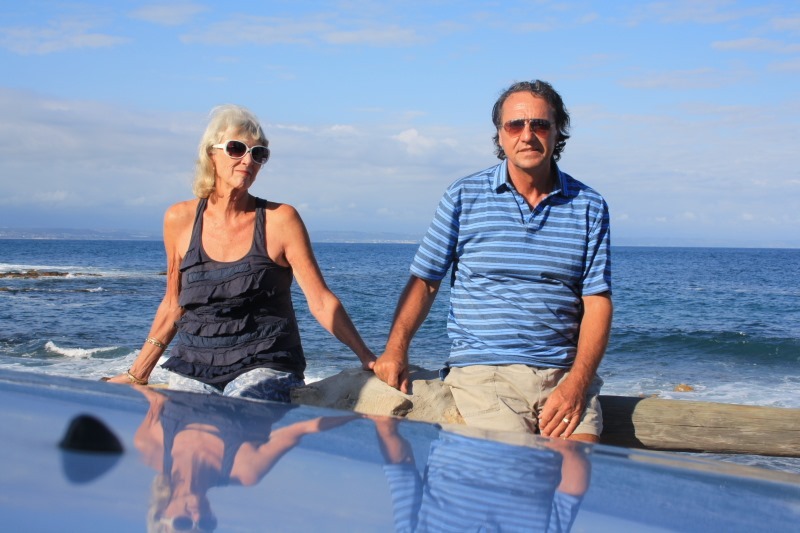 We bumped into Rui and Jean that contacted us via the blog shortly after we started our trip. They wanted to get some info from us because they planned a similar route. It was real fun meeting up with them. 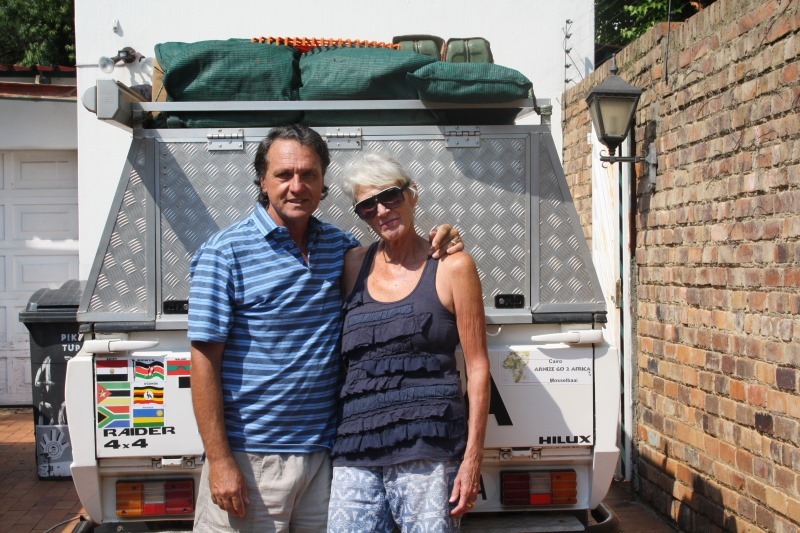 We also met Richard and Sophie Morgan who is heading north and camped in Malawi with our friends Chris and Julie, Bonita and her husband with the Cruiser named Hotel California who we met at Lake Victoria, who is heading to Malawi. This means that there was a huge exchange of info from north to south and from east to west! Rui and Jean just said goodbye, heading towards Dar es Salaam and Zanzibar, Richard and Sophie said goodbye an hour ago heading towards Bagamoyo and Panganie and we are getting ready to braai Later on we will fill up our water tank with fresh borehole water, start packing away most of our things and get ready to have an early start tomorrow trying to cross the Tanzania/ Malawi border fro the second time. 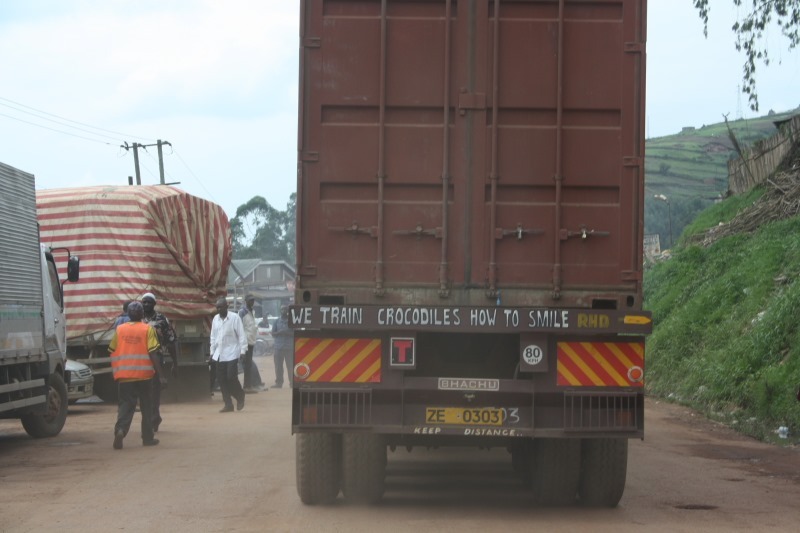 We had an easy border crossing between Uganda and Rwanda. 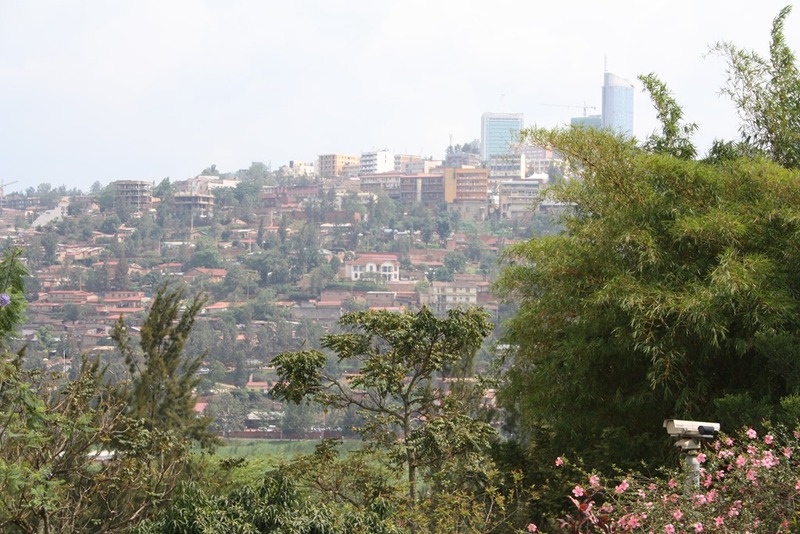 We drove the short distance from the border to Kigali.The city is spanning several ridges and valleys with flowering trees, winding boulevards and bustling streets. There are huge expensive houses build on the ridges overlooking the city and hillsides. 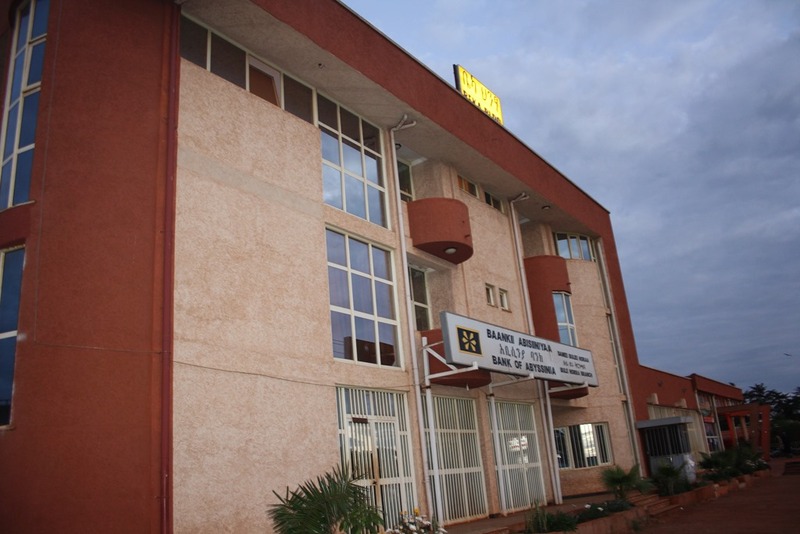 As everyone knows the terrible history of Rwanda’s occasional and systematic genocide with the most terrible one in 1994, we decided to go immediately to the Genocide Museum. It was to soften the experience, a sobering and sad experience to see and read and hear on audio video the testaments of those that survived the slaughter and see the bones of those that did not!The whole slaughter took place over 100 days of madness. Dead and decaying bodies littered the streets of Kigali. Dogs were shot en masse because they had developed a taste for human flesh. it is above one’s comprehension how one human can do this to another. 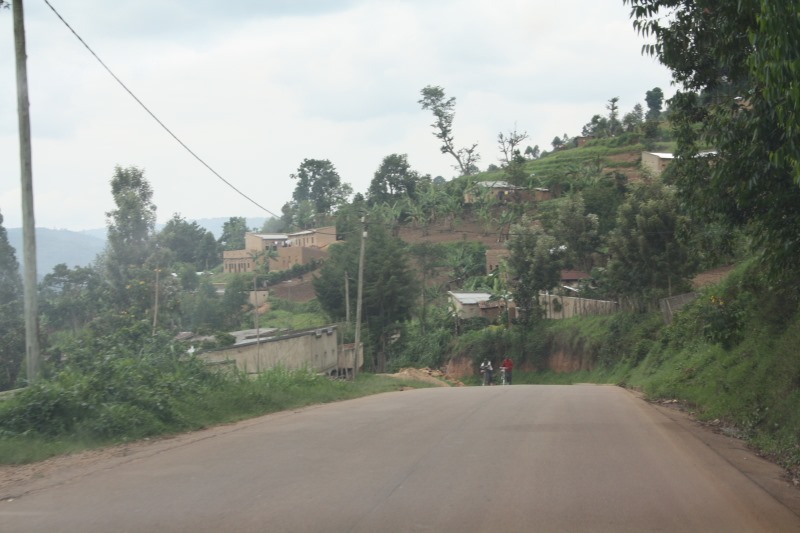 An estimated 800 000 Rwandans were killed mostly by the Interahamwe militias, gangs of youths armed with machetes, guns and other weapons supplied by officials.The radio kept updates of where and when a person were fleeing and the Hutu militants would chase to kill. One girl that lost her whole family told how they were chased and how they died and said at the end of the commentary that it was the government that killed them. This is very true….the government were the instigators. We were very upset after leaving the museum where there is a mass grave for 200 000 of the slaughtered people. 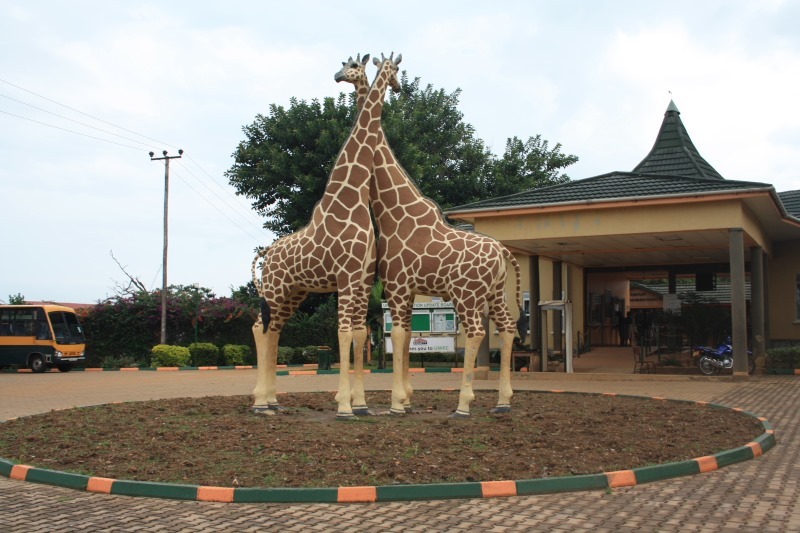 We did not feel very comfortable in Rwanda. We looked at the people, seeing lots of men and woman between 35 and 50 and could not help wondering how many of them helped to kill people 19 years ago. 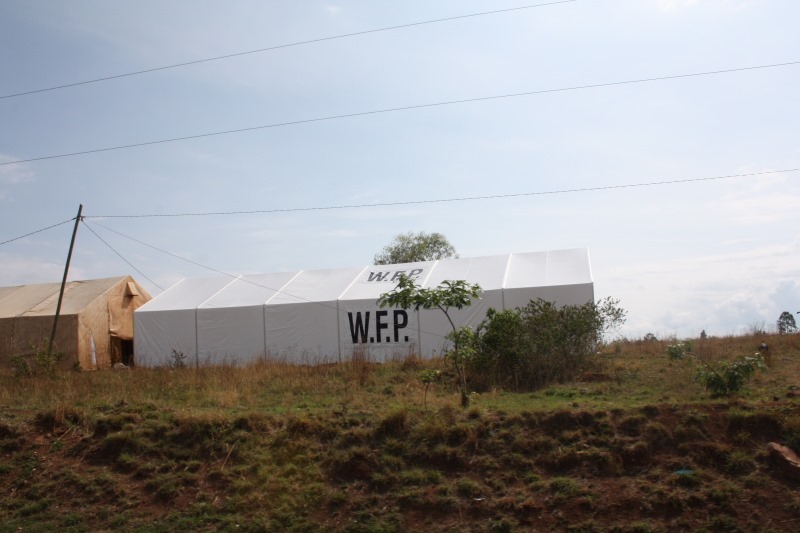 We camped at One Love Campsite and left Rwanda the next morning for Tanzania. 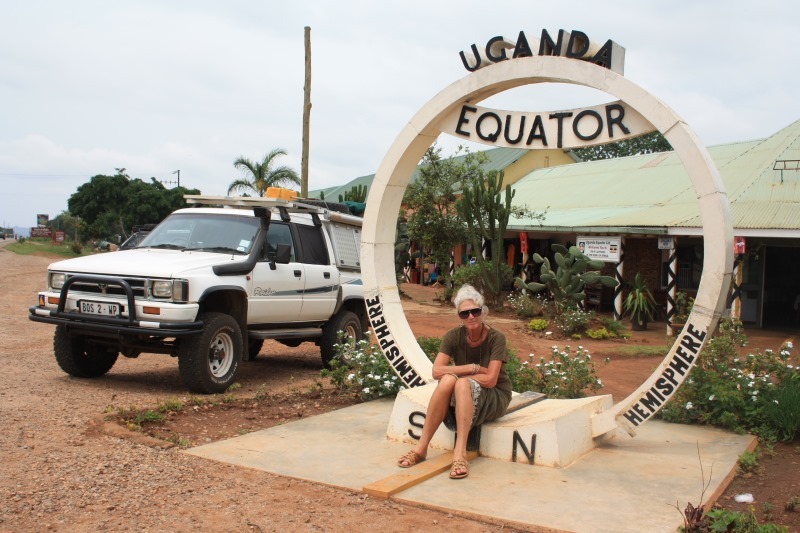 Going through the border between Kenya and Uganda was quick and easy although we had a nasty surprise…..the visa for Uganda cost $50 per person. 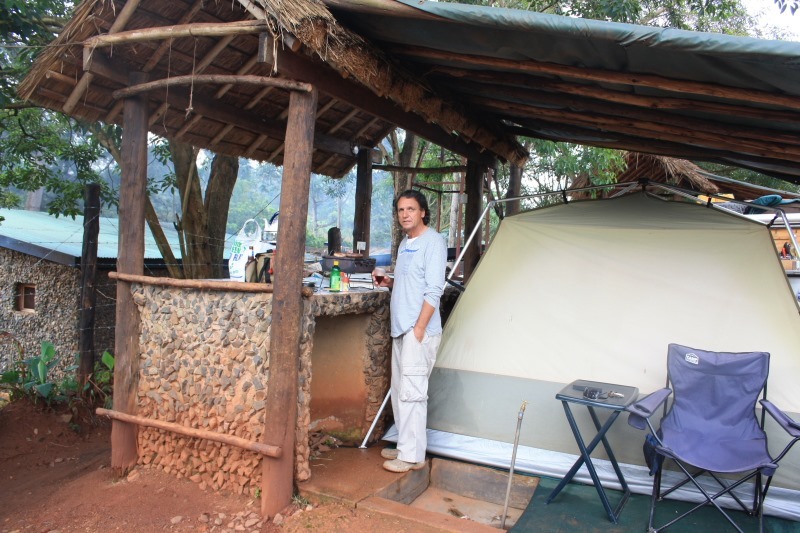 We stayed at Adrift, Jinja where they allowed us to pitch our tent under one of the kitchen canopy’s because of the possibility of rain. Adrift is better equipped for rooftop tent camping because the kitchen area for the campers and overland trucks are on the top terrace but the area where we were supposed to pitch our tent is on the lower terrace…..so we asked if we can rather pitch our tent on the upper terrace and under roof. 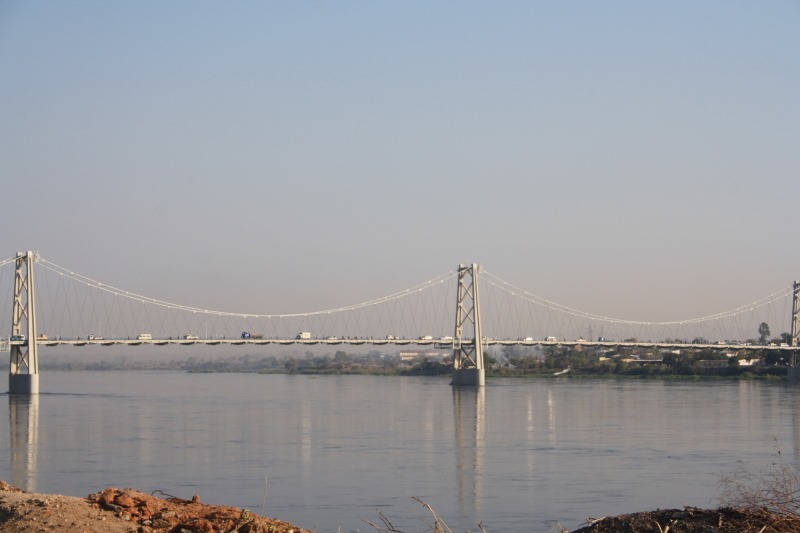 It is beautiful there and we appreciated the fact that we were again camping next to the Nile…this time the White Nile. 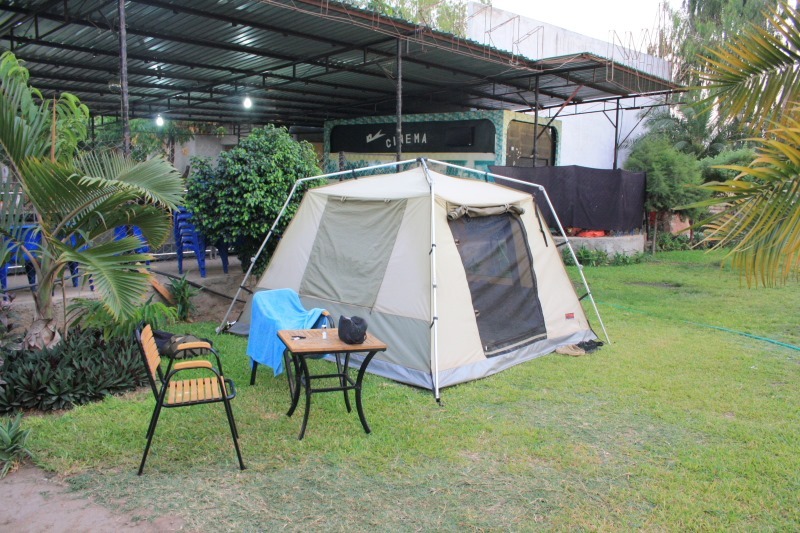 We saw at Bahir Dar, Ethiopia where the Blue Nile flows out of Laka Tana, we followed the Blue Nile for thousands of kilometers, saw the confluence of the Blue and White Nile in Khartoum, Sudan and now we were camping where the White Nile starts it 6000km journey!! 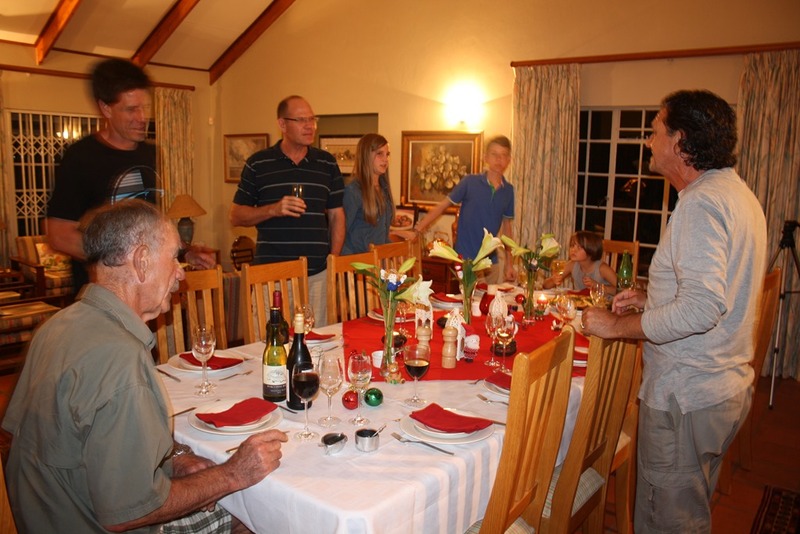 It was also Arno”s birthday on the 24th and we wanted to have a nice braai to celebrate the day. My birthday was in Malawi and since then we were wondering where his birthday will be. Luckily the day was very nice but that afternoon the rain came down again!! We were eventually forced by the torrential afternoon rains to move on. 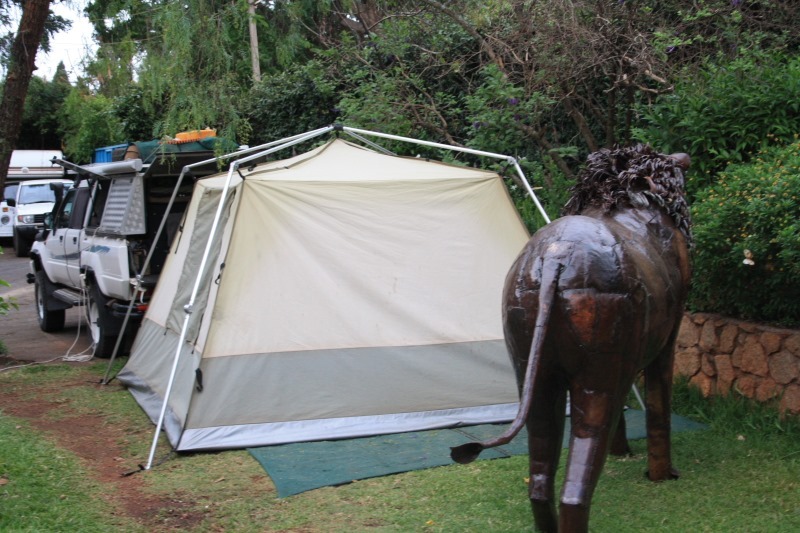 It was a good idea to camp under cover but even that could not keep us dry and clean. Everything was red with mud!! Rain comes quickly and comes down like a waterfall. 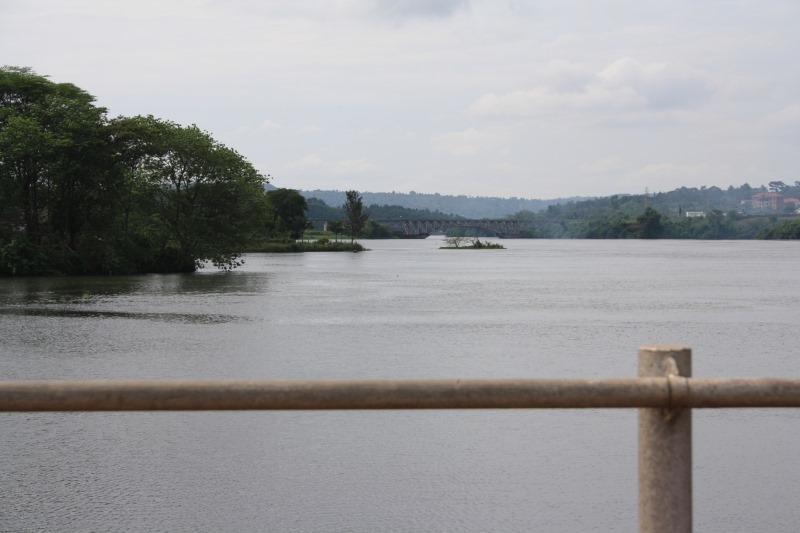 Uganda’s yearly rainfall is between 1.5 and 2.5 METERS. We wanted to stay longer but it was just to muddy. 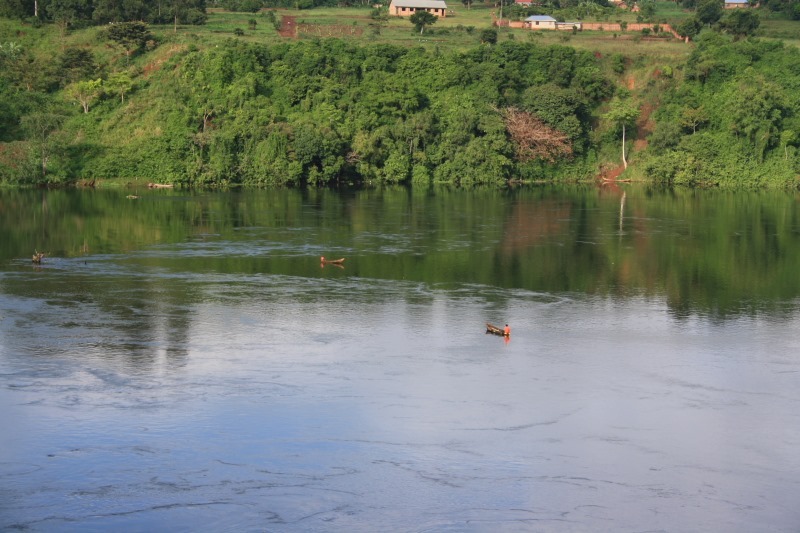 Jinja is also a favourite place for adrenalin junkies because the white water rafting starts from there as well as bungee jump. Suddenly we were surrounded again by Overland Trucks. 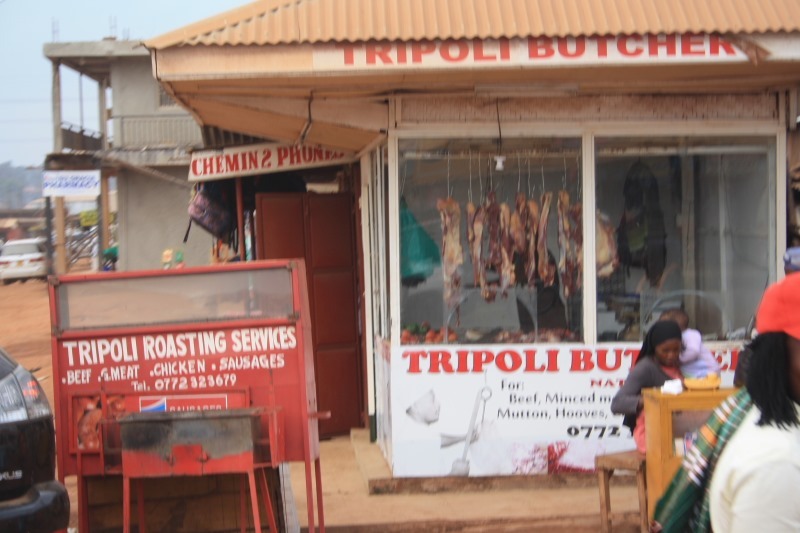 We moved on to Kampala. 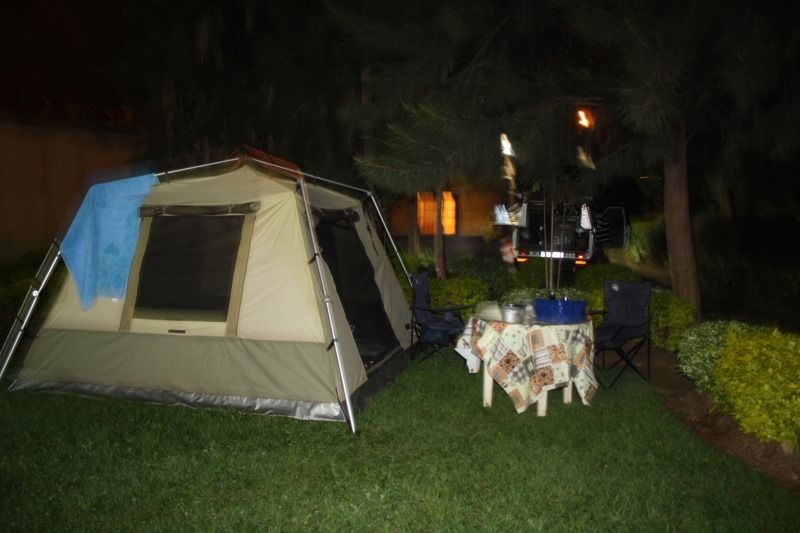 We camped at Zoo Camp in Entebbe next to Lake Victoria. 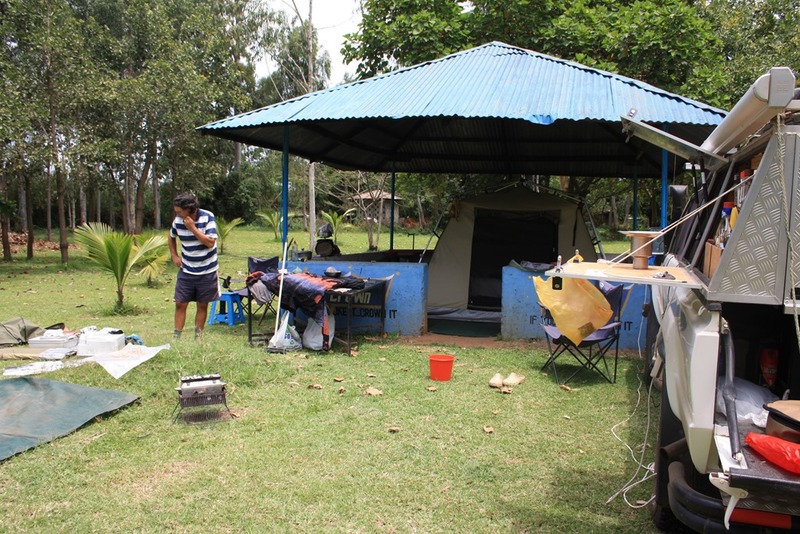 Very basic camp but with clean facilities. 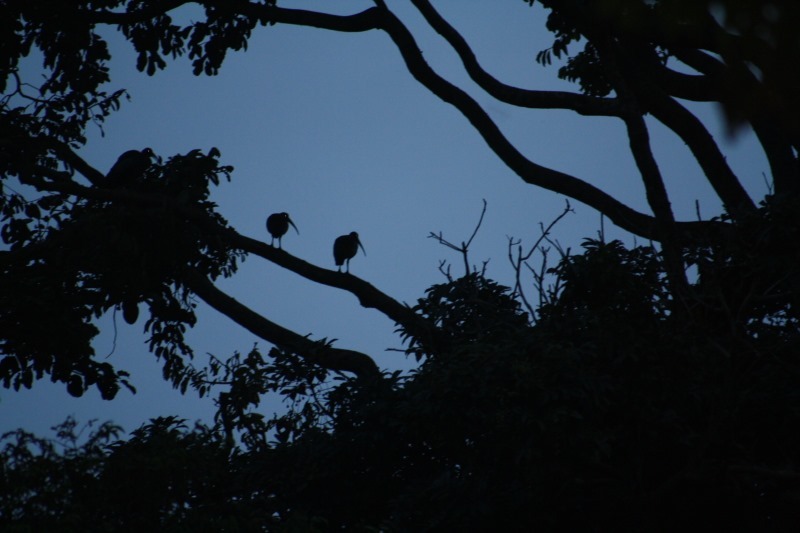 We saw the most magnificent birds, listened to fish eagles, heard our neighbours roar and laught (lions and hyenas) and thought it was real fun to camp in a zoo! Again we had torrential rain and had to hide in the tent while rivers of water were running past. Whatever were not yet red with clinging mud, were then red and muddy!! We had biltong and beer for supper Impossible to cook under those circumstances. 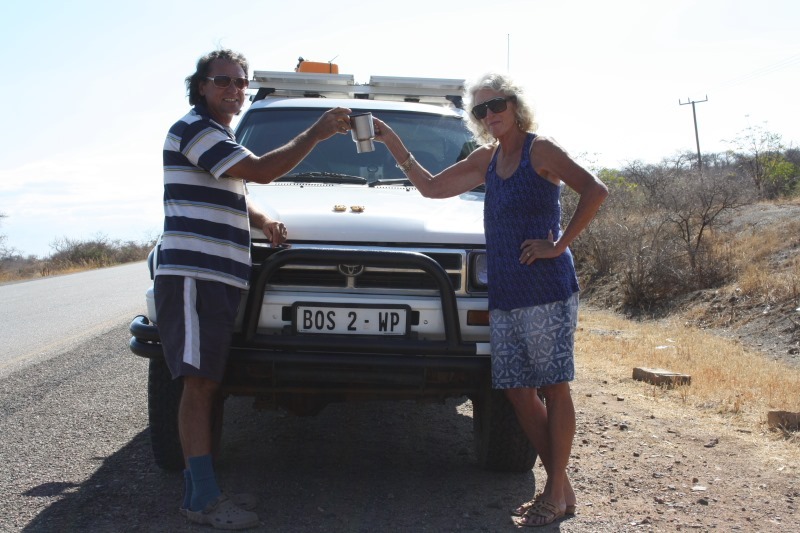 Yes, one can buy biltong (and beer) all over Africa if you really want! We bought biltong at Shoprite in Kampala for R200 kg. 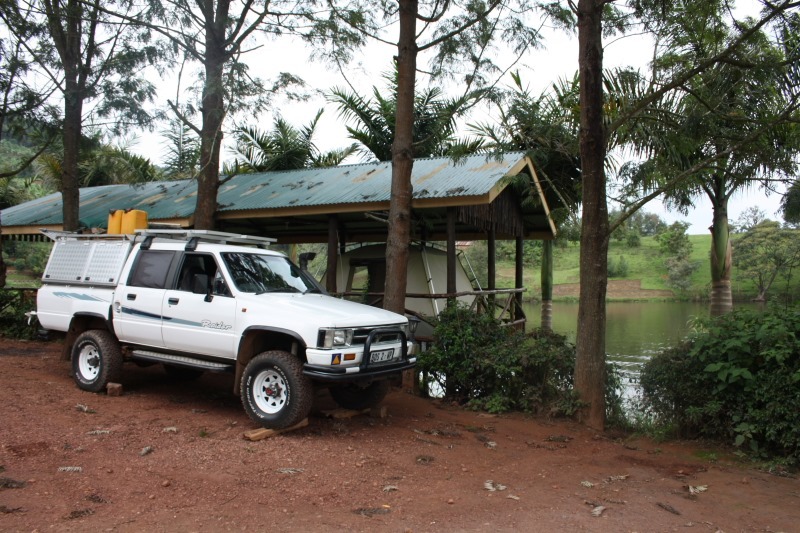 We decided to drive straight to Lake Bunyonyi after trying to camp at Mbarara at the Lake View Regency Hotel and Camping which T4A navigated us to. 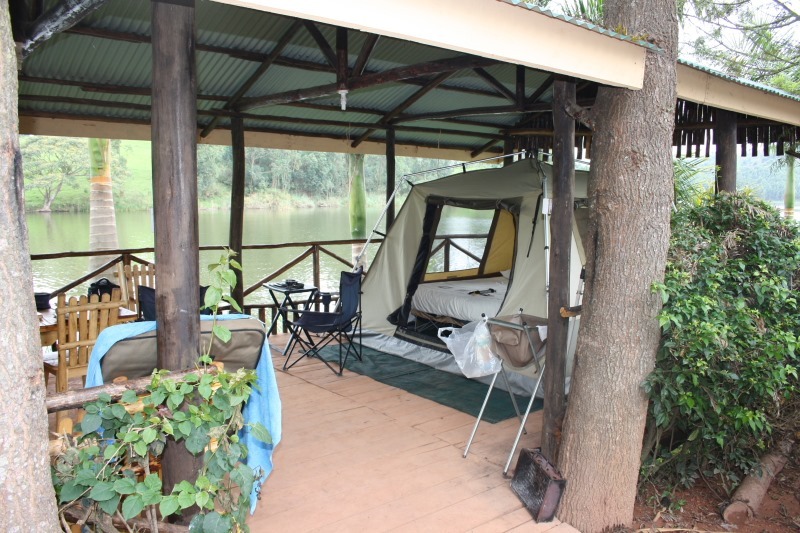 It is a real smart 5* Lodge but the camping is actually an open space without any facilities, no electricity, no nothing for $50 We camped at Lake Bunyonyi Overland Resort. 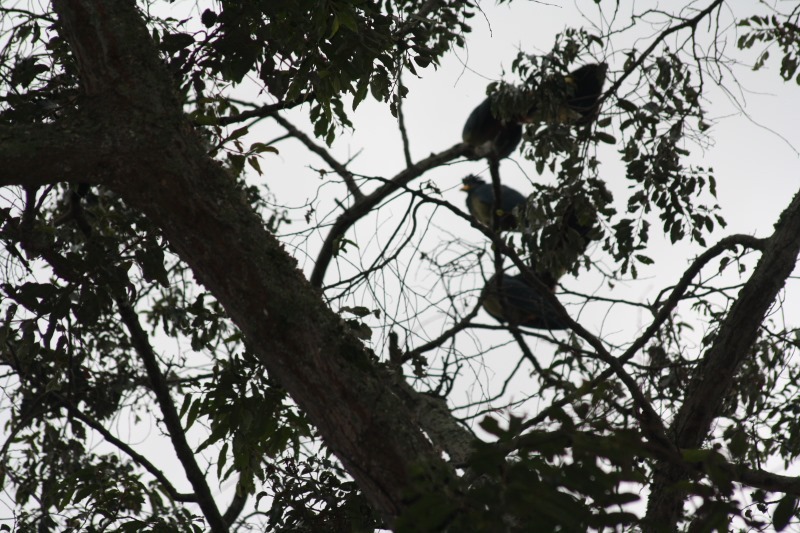 This is a very special destination and a must for anyone en route to Bwindi National Park. 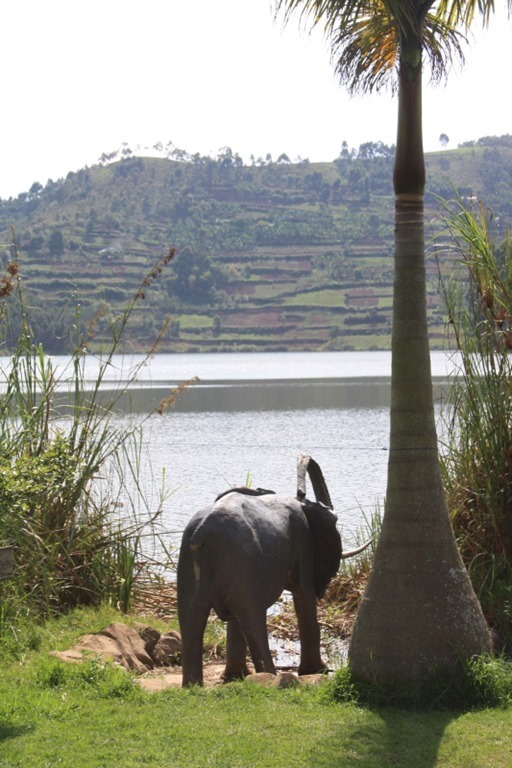 It is situated high on a hill near Kabale overlooking the lake and has the most fantastic facilities, including clean ablutions, hot water (if the electricity is up and running) and free wi-fi. 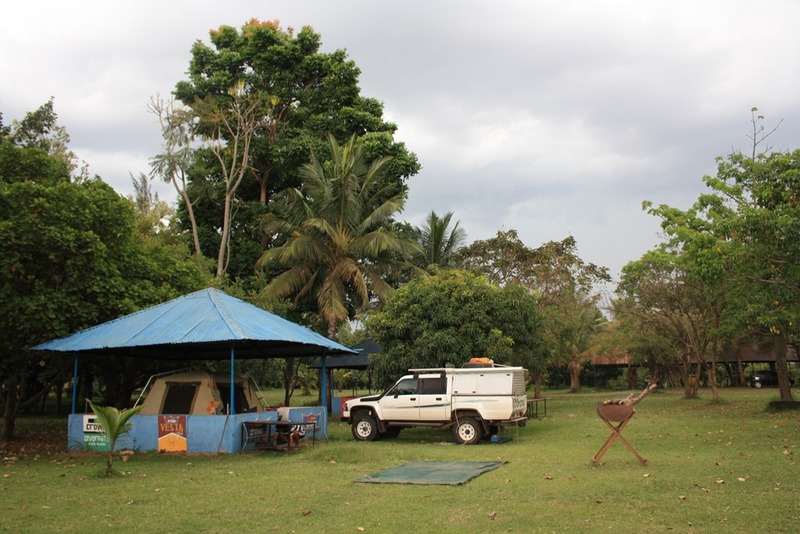 We camped on grass next to the lake but were flooded when the normal late afternoon downpour like a cloudburst started! 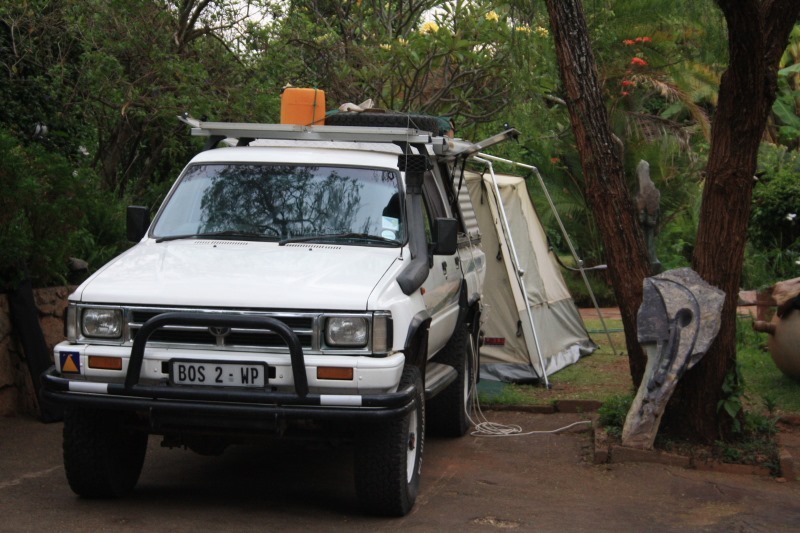 The Overlanders with their truck that used the banda as a hide, went to Rwanda the one morning and we asked permission to pitch our tent on the deck and under roof because we wanted to go to Bwindi early the next morning and would REALLY prefer to pack away dry equipment. 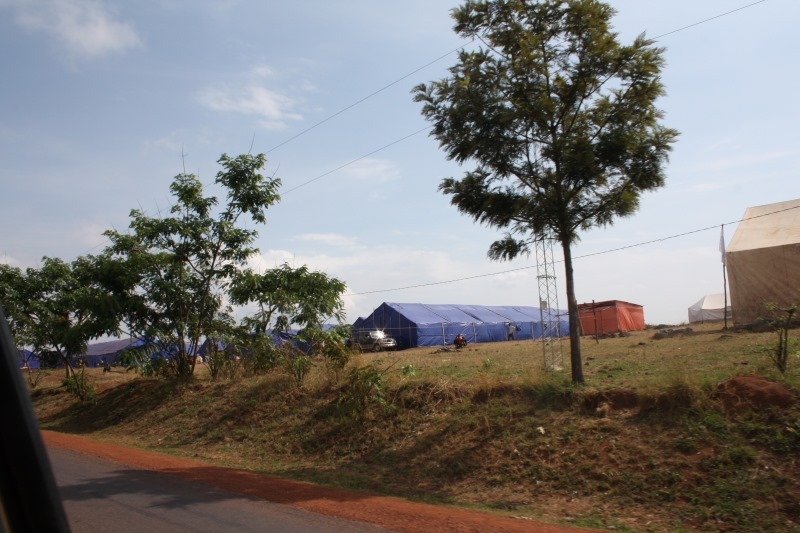 When moving the tent from the grass to the banda, we washed (tried to) all the accumulated thick red mud of the underside of the tent before taking it to the banda. 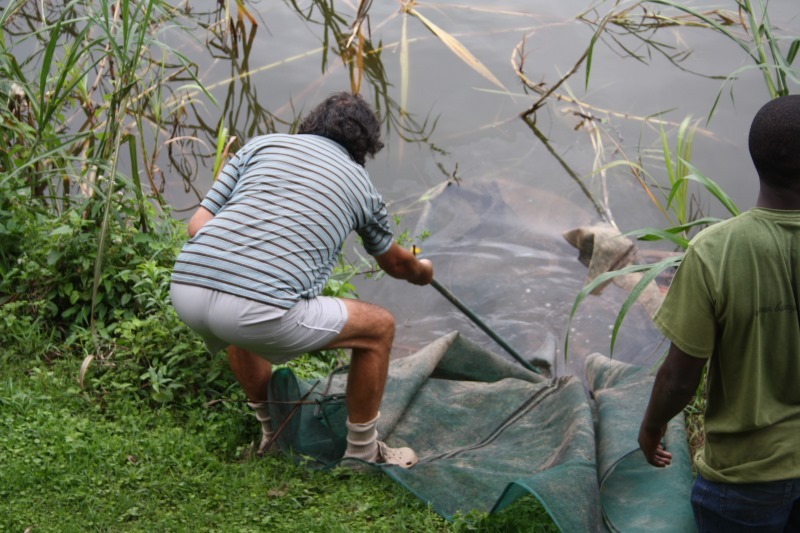 Arno also dumped the red muddy shade nets in the lake turning the lake to red but we had green shades again! 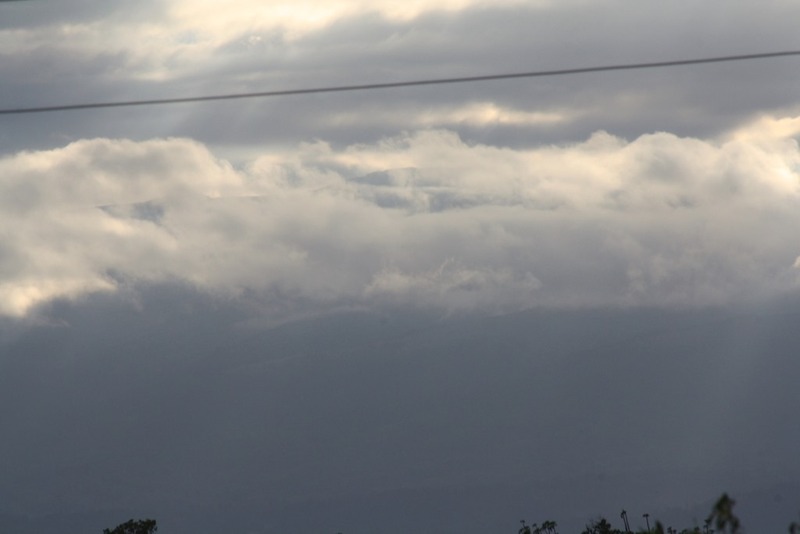 It started raining (pouring) again while we were sitting high and dry on our cosy veranda, clean and dry. 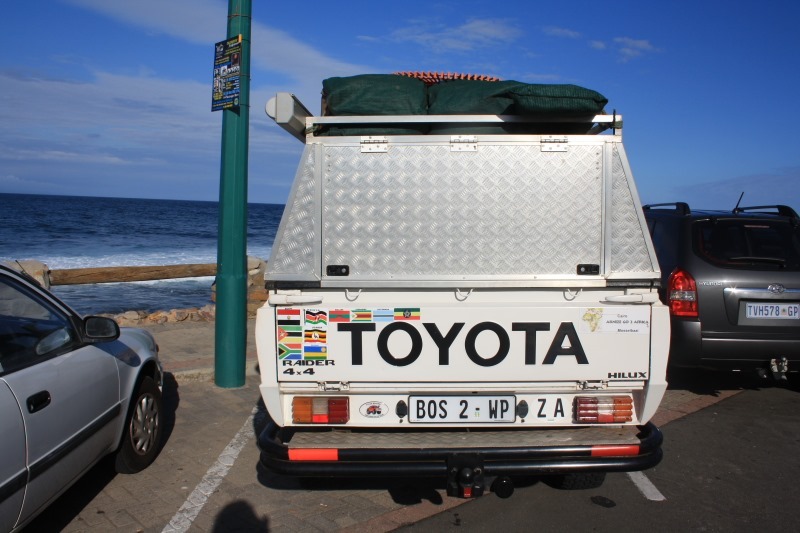 It was then that we decided it was time to turn the Hilux’s nose south to get away from torrential rain. Early the next morning we were of to Kigali in Rwanda. 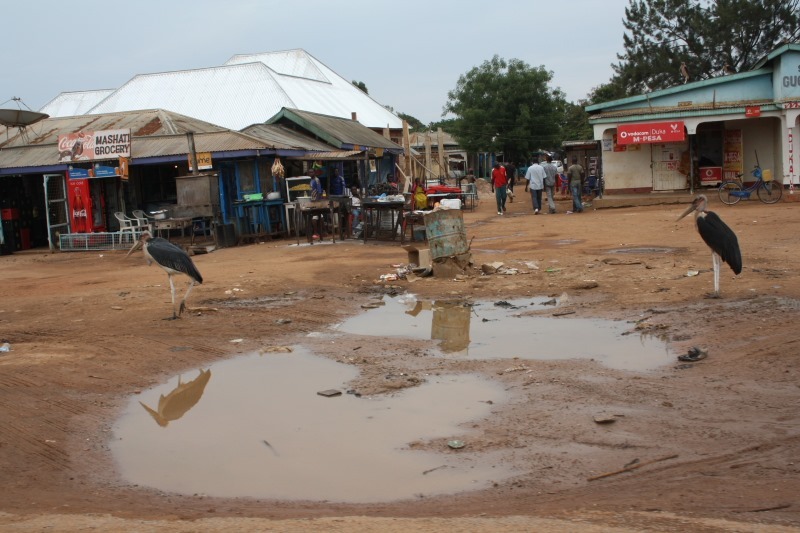 We will most definitely come back to Uganda for a longer period when it is dry season to do what we intended to do here! It is a fantastic country with very friendly and helpful people. It is also a beautiful country. Very much a destiny with beautiful scenery. 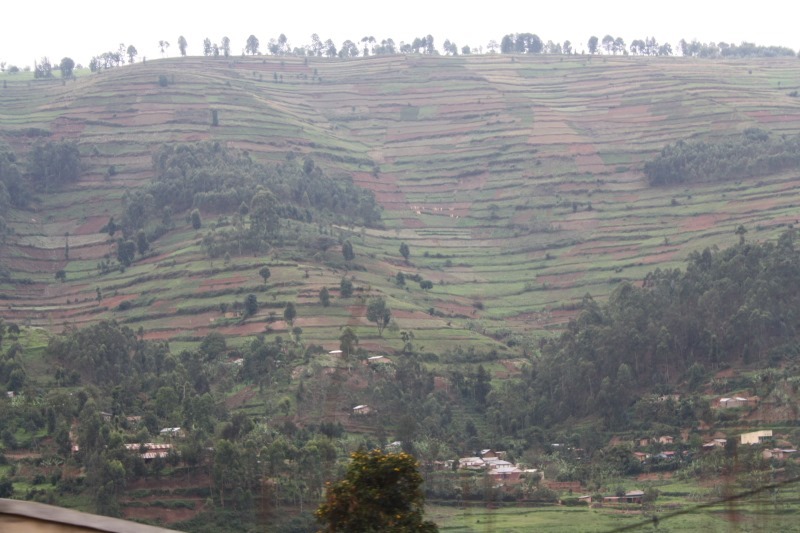 Looks similar to the Ethiopian highlands with green terraces of farmed land as far as one can see. Uganda is more western than what we thought and it is sad that the country is mostly known by us as the country of Idi Amin. 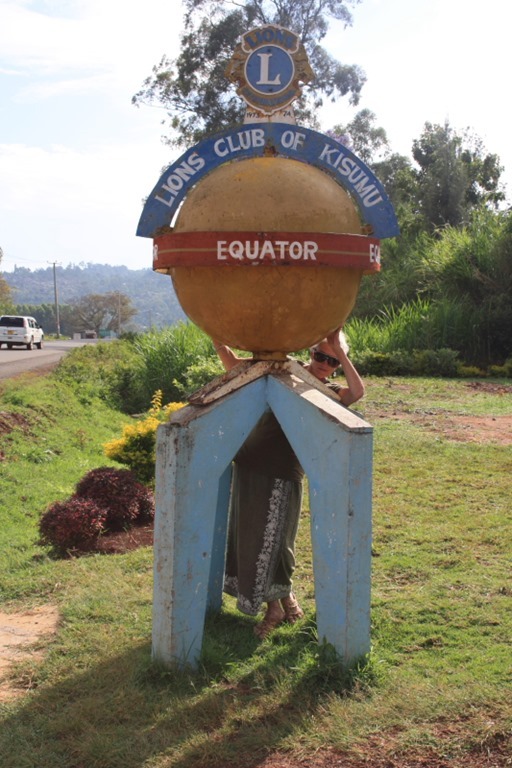 We have now crossed the Equator 4 times at three different places and countries! 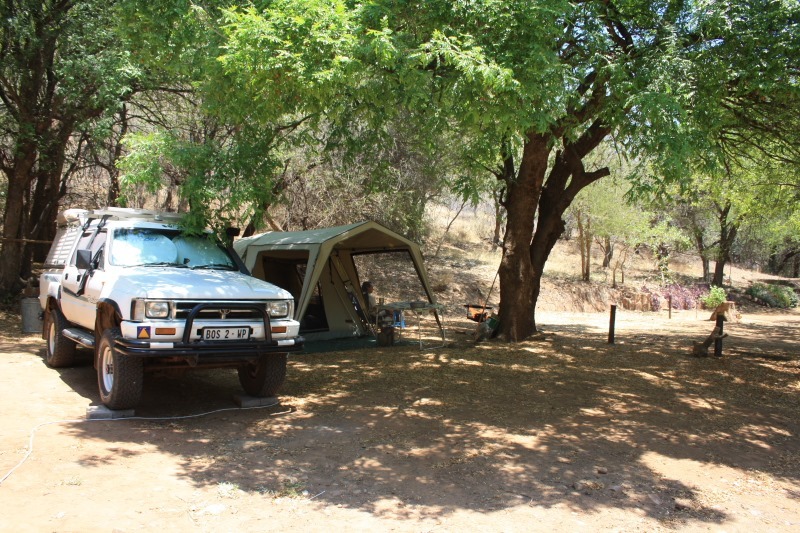 The lonely and only Hilux! 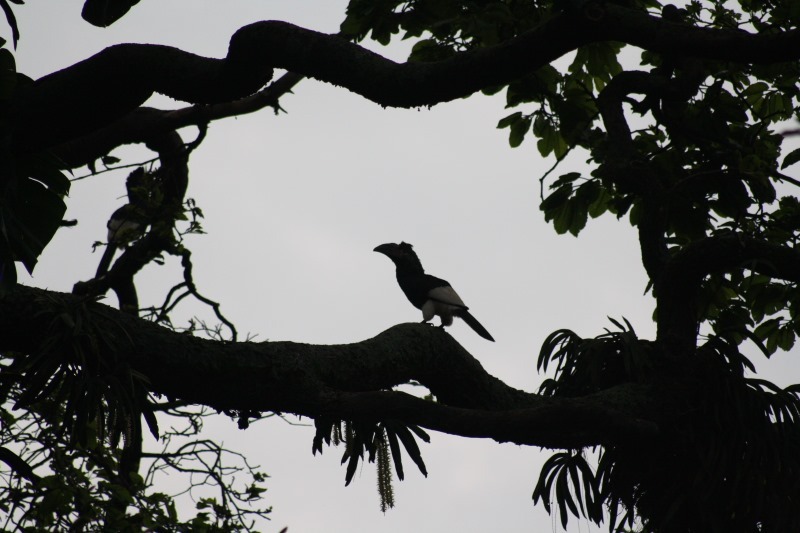 Not so strange and following and waking us all over Africa! 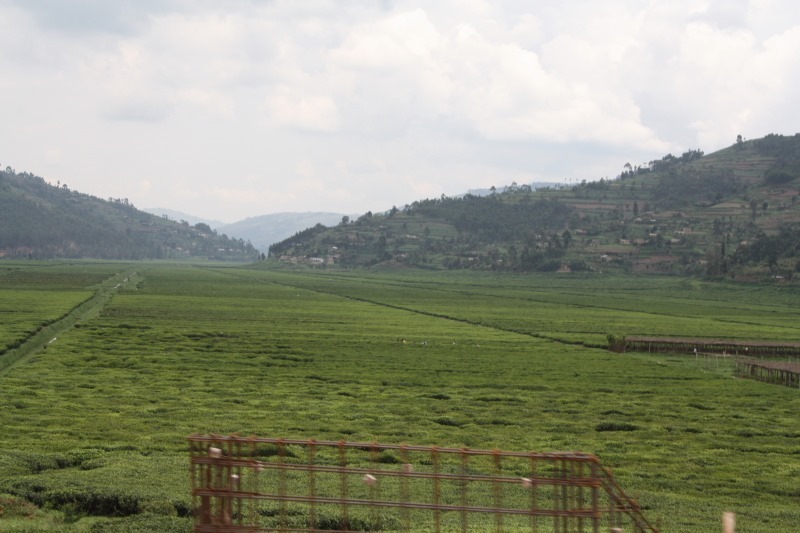 Uganda’s Highlands looks similar to Ethiopia’s. Farming on terraces. 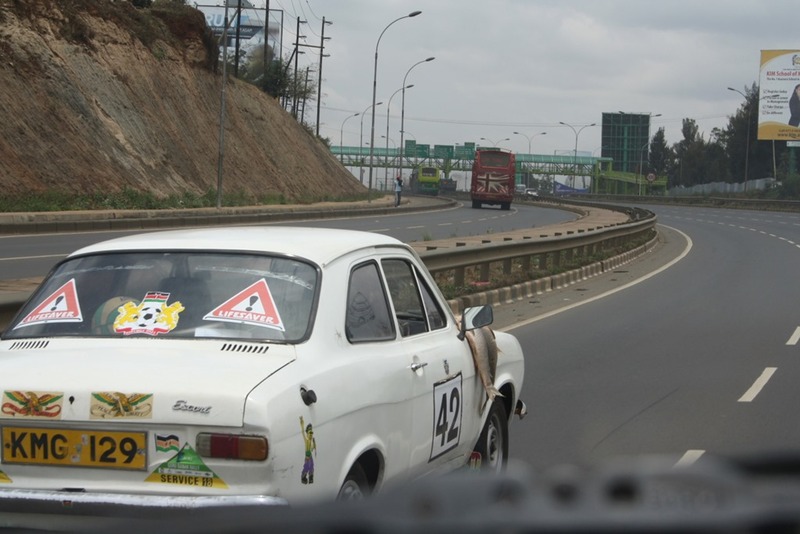 We started very early in the morning on Saturday 14th September, trying to dodge the Addis traffic. Although we went to bed around 10 we still had a noisy night with the party and did not slept too well. 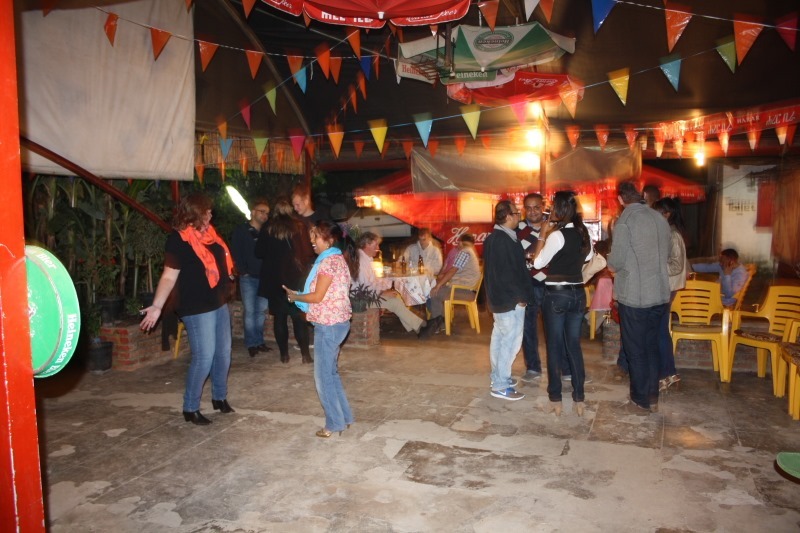 We think that there are more Dutchies in Addis Ababa than in Amsterdam! They are the real “flower people”. Growing and exporting flowers are a huge thing in Ethiopia and Kenya. 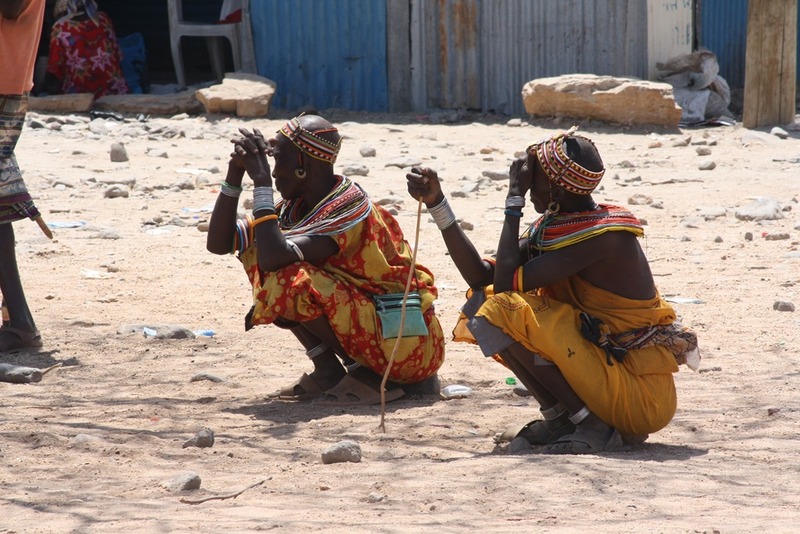 It was very amusing to see these people enjoying themselves but still keeping there own identity in Africa. The party went on till 4.30 in the morning and that was when we stood up for the start of our journey heading south. 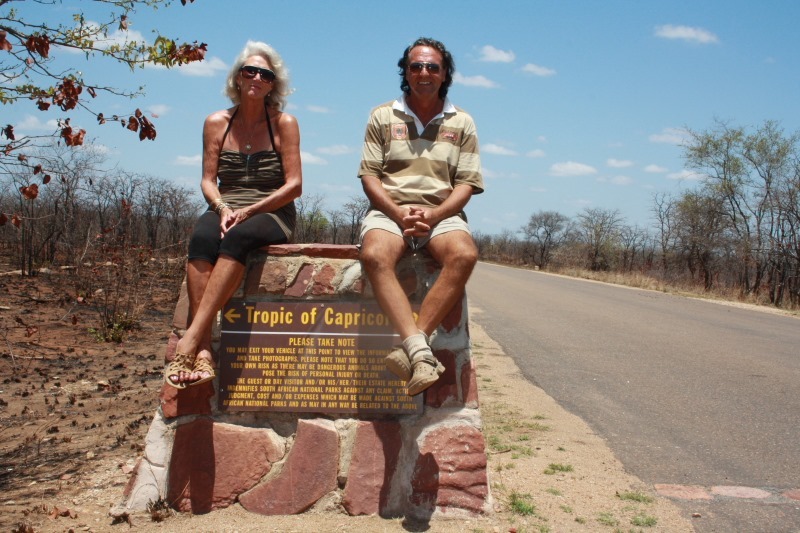 We were looking forward to get the infamous “worst and dangerous road in Africa” behind us. 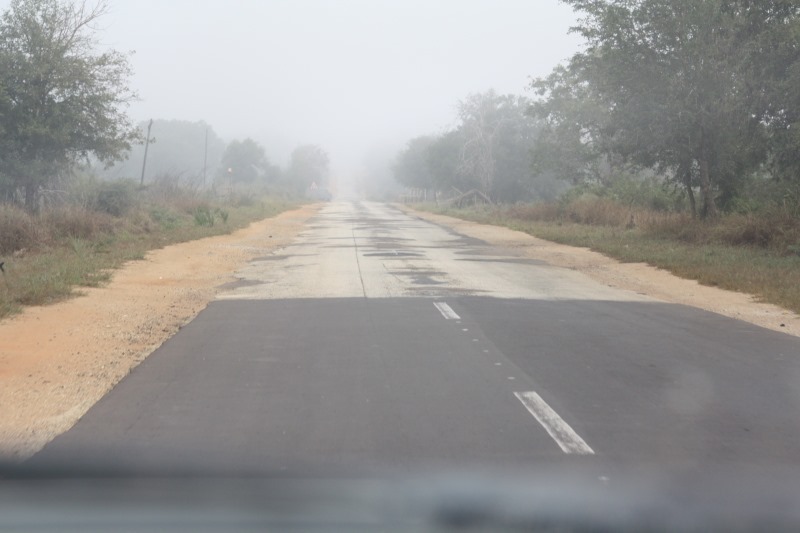 As usual the day had it’s surprises…after Awasa for the next 160km, the road became one of the worst potholed roads on our whole trip!! 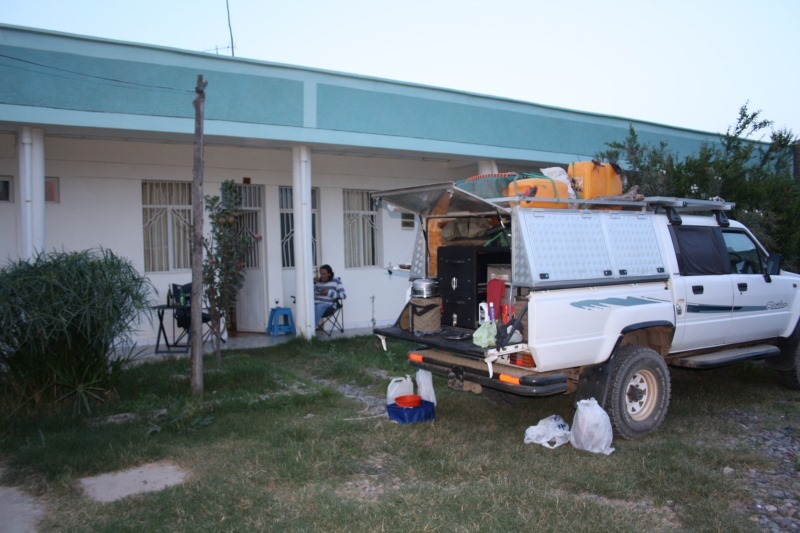 We thought we could reach Yabelo but only reached Ager Maryam where we stayed hopefully, for the last time in a hotel. 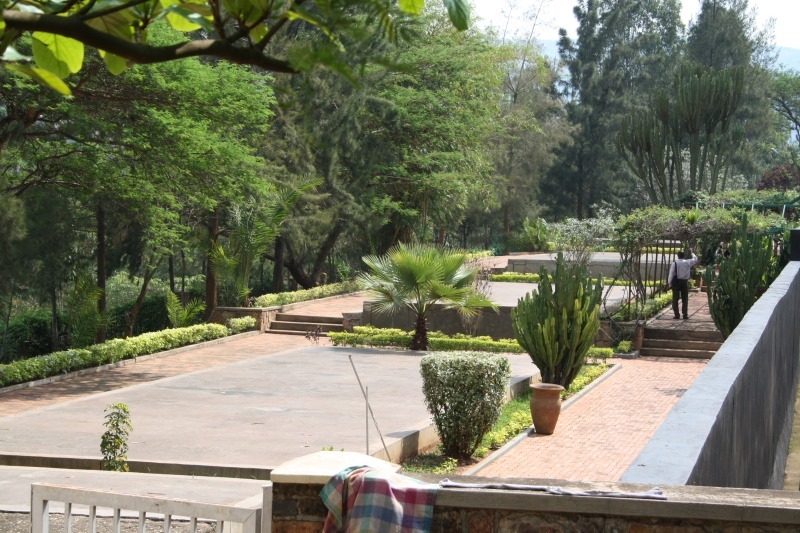 We stayed at the Bule Hora Hotel for 300Birr. I cooked us another mince dish with canned veggies in the room. 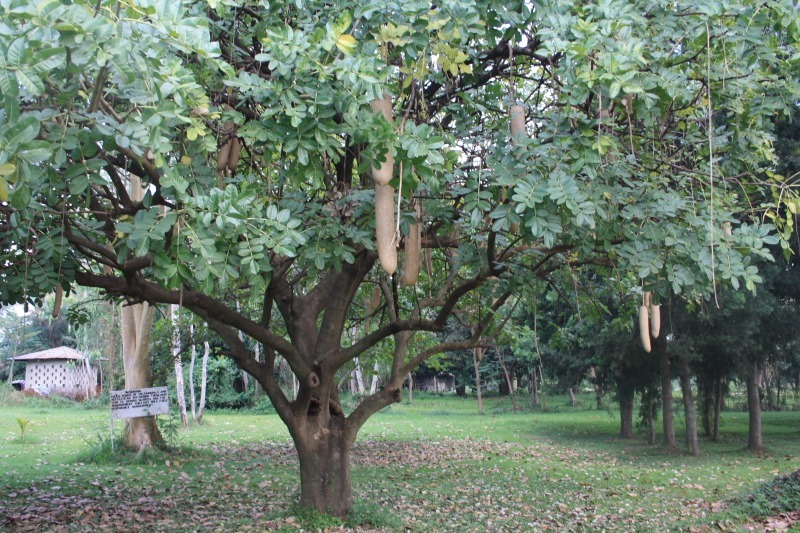 This became our staple food right through Ethiopia when we stayed in hotels. 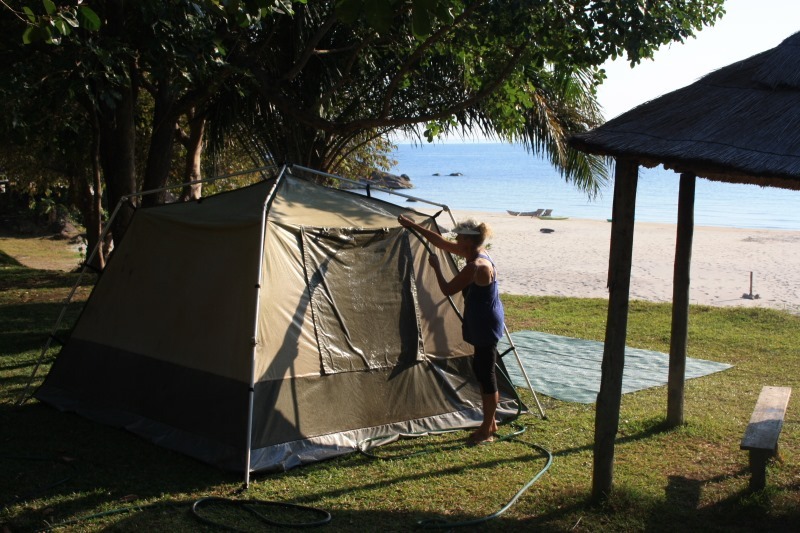 We enjoyed the nice clean room and bathroom knowing that from now on we are back to the terrible ablution facilities campsites offer campers! 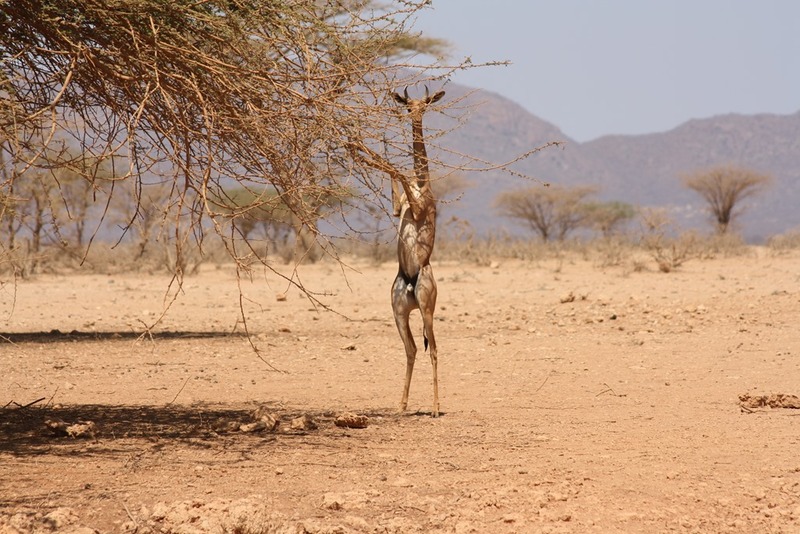 At six the next morning we were on the road again to reach Moyale and the border before lunch. 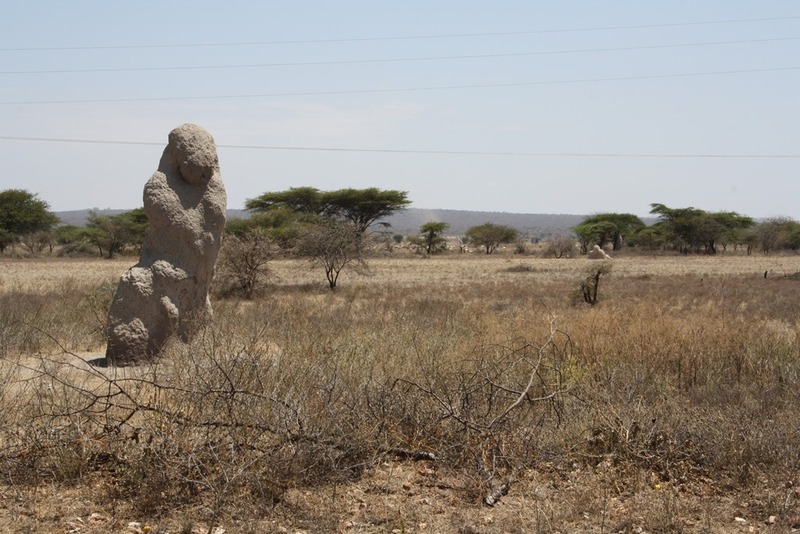 When we stopped in Moyale at the Ethiopian Immigration office it was a minute or 2 after 12:00 just to be told that the officer are leaving for lunch and will only be back at 15:00!!!! I sort of lost it there….it was as if Ethiopia would not let us loose. We bought fruit with our last 400Birr and sat outside in the heat swatting flies. 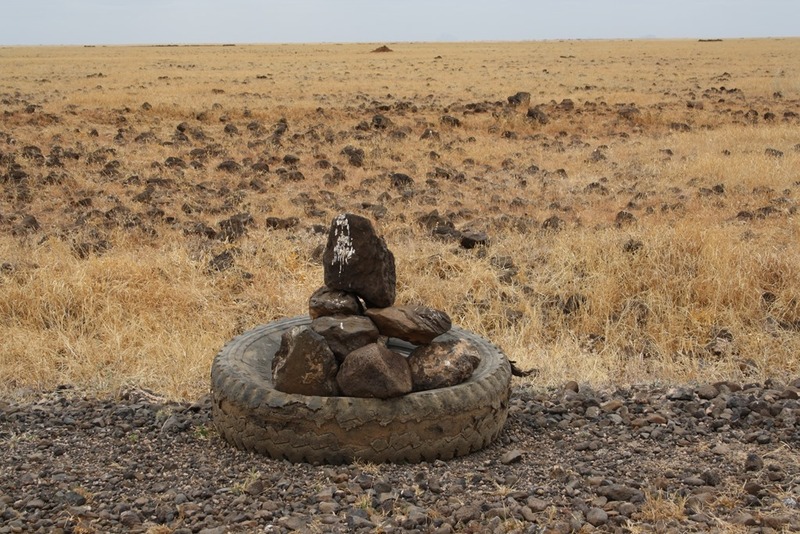 (It seems that is what we’ve done on most border posts in the northern hemisphere) . The Immigration officer arrived at 20 minutes before 3, very friendly stamped our passports and send us across the street to Customs….which was closed. The guard told us that we must come back tomorrow. 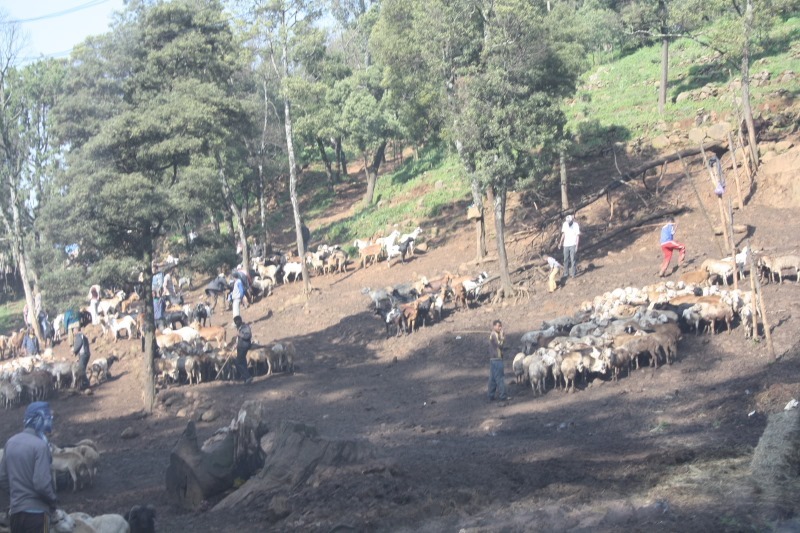 We said we can’t stay because we are already stamped out of Ethiopia. It was an up and down conversation getting nowhere. We went across the road to Immigration again where the guard there (the officer went home) told us that the guard at customs must phone the custom officer. Back to customs the guard asked how much we will pay overtime for the customs guy before he phones! Well to make a long story short, the customs official arrived a hour later, with Arno’s help stamped the Carnet out and we left. 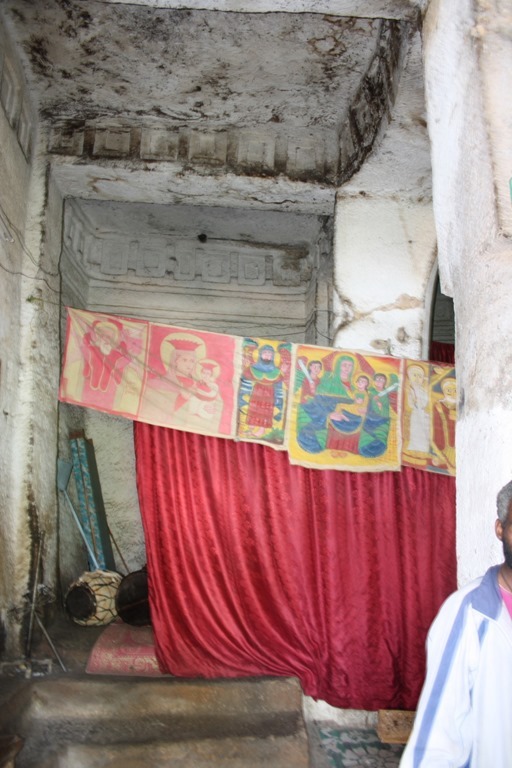 The guard though wanted money for his “help” so we gave him the 50Birr note that we wanted to keep. 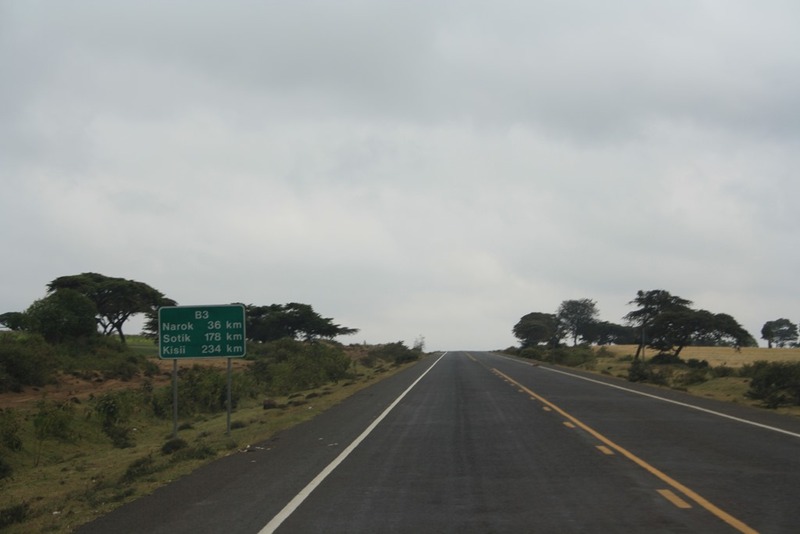 We were VERY glad to cross the border into Kenya where it took exactly 10 minutes to be stamped in both us and the Carnet. 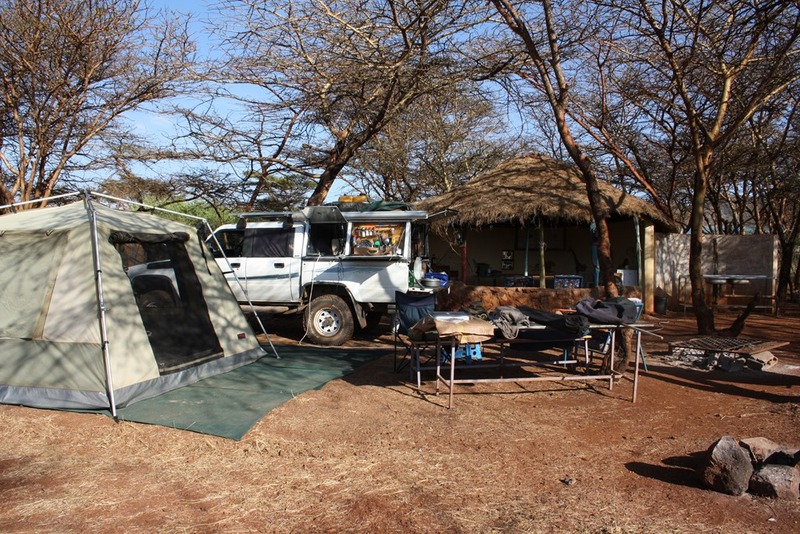 We camped at the Kenya Wild Life camp for 15USD per person and could not use the very bad facilities but were so glad to be back in Kenya that nothing mattered AND we could pitch our tent again! 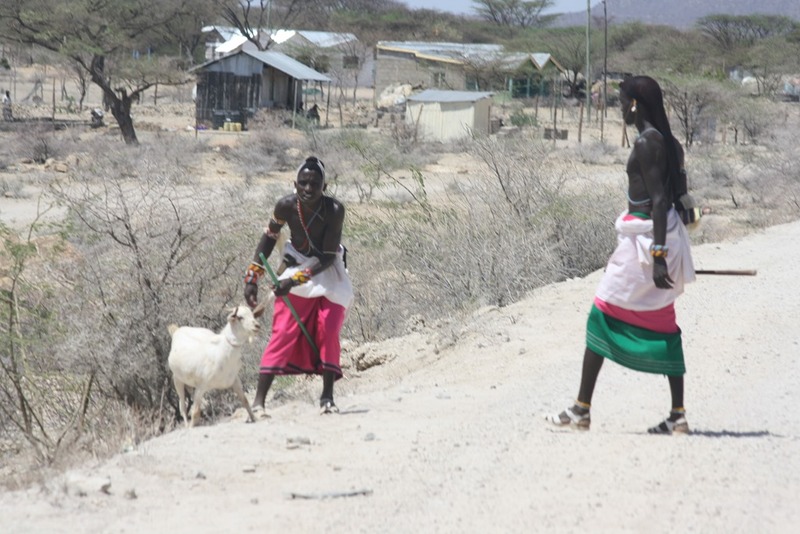 The lady in charge came to tell us that there is a tribal war going on since the previous week and we must first clear it with the Police if we can drive through to Marsabit. 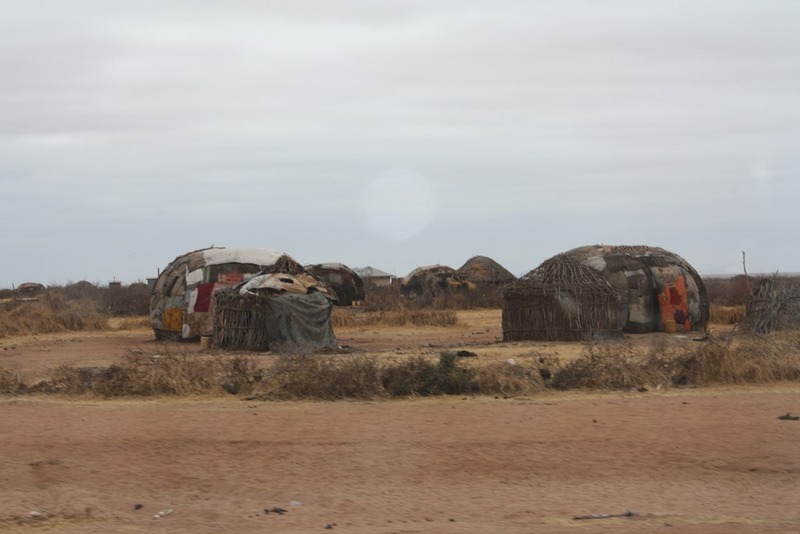 Apparently they started shooting it’s other in Moyale and as she told us “people are dying”! 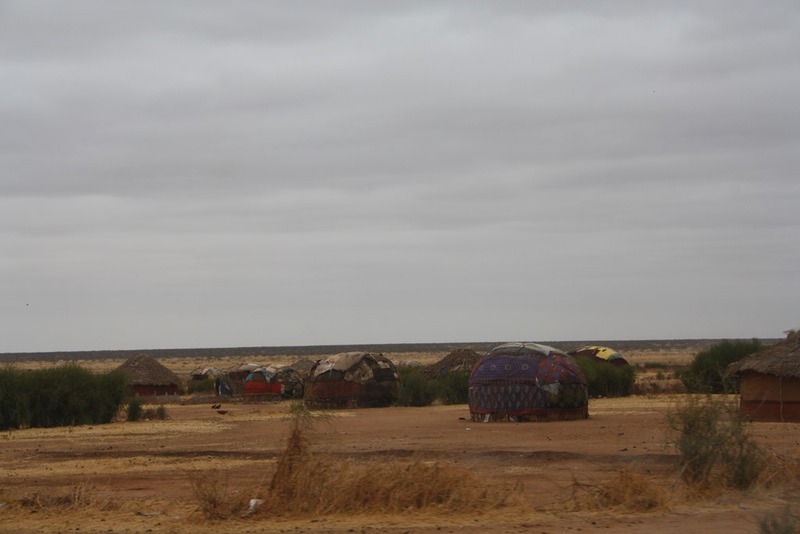 When driving out of Moyale the next morning we were stopped just outside town by the Police who told us that there is Police on the road and that we will be safe. It is a tribal war and no-one will bother us. We saw lots of armed Police and armed men on the road. 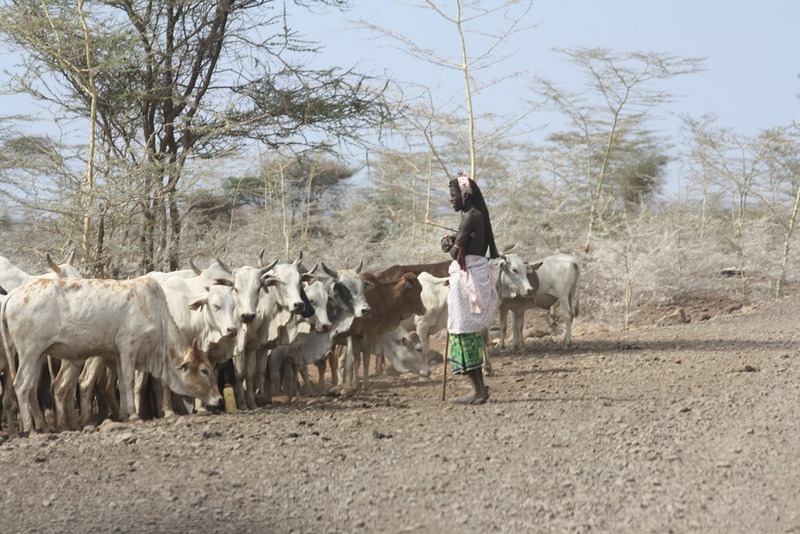 It took us 8 hours to do the 250km to Marsabit. 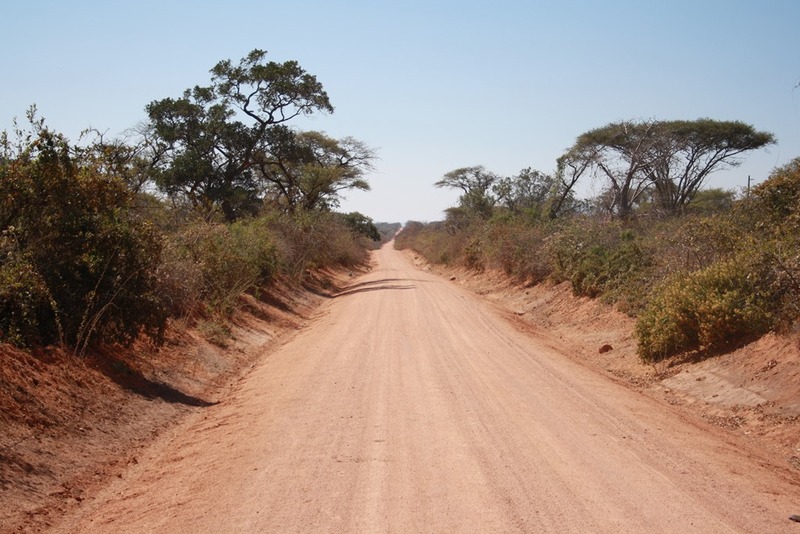 It is a rocky corrugated road that makes the whole truck shudder. It was bad but not the worst we had driven on on our trip. 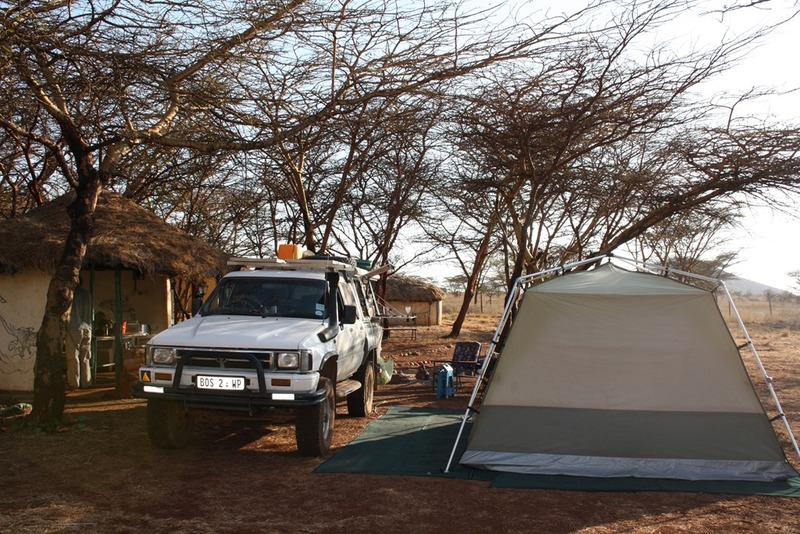 We camped in Marsabit at Camp Henry with very nice ablution facilities costing 300KS per person. 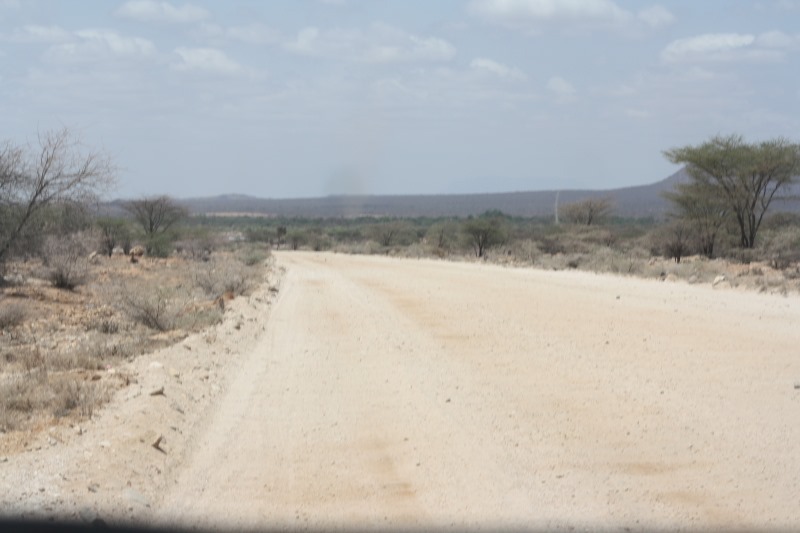 The road from Marsabit to Isiolo took us 5 hours. 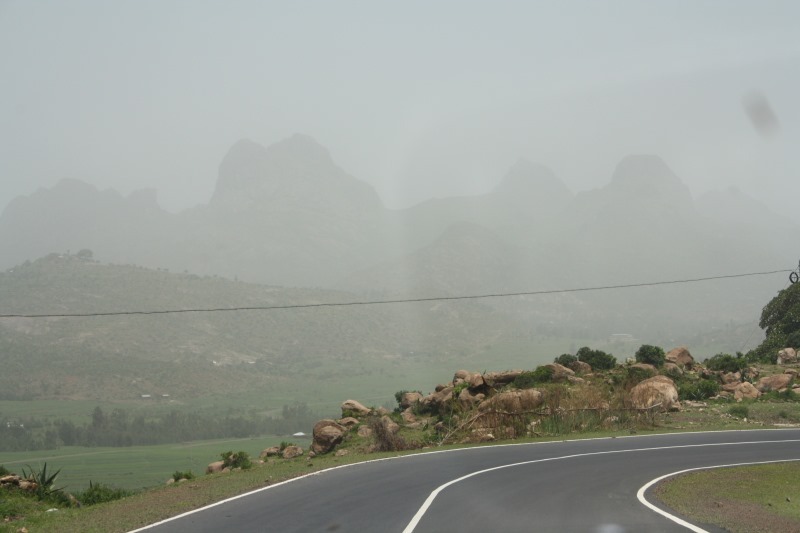 The road condition alternate between very bad corrugated rock and very soft red “fes-fes” powdery dust. All in all, the road that we were most afraid of was at the end not so overpoweringly bad as predicted. 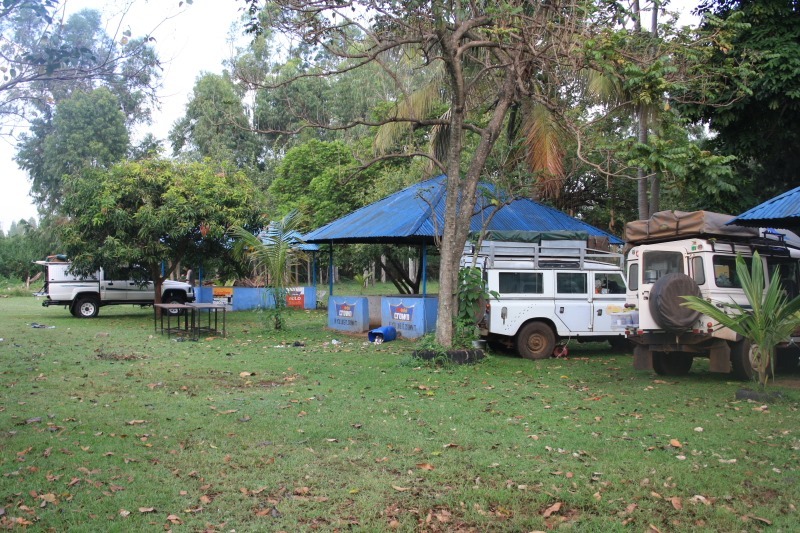 Because it was still early we drove on to Nanyuki, bought ourselves “Boerewors” at Nakumat in Nanyuki, camped at Naro Moro River Camp (15USD p.p.) 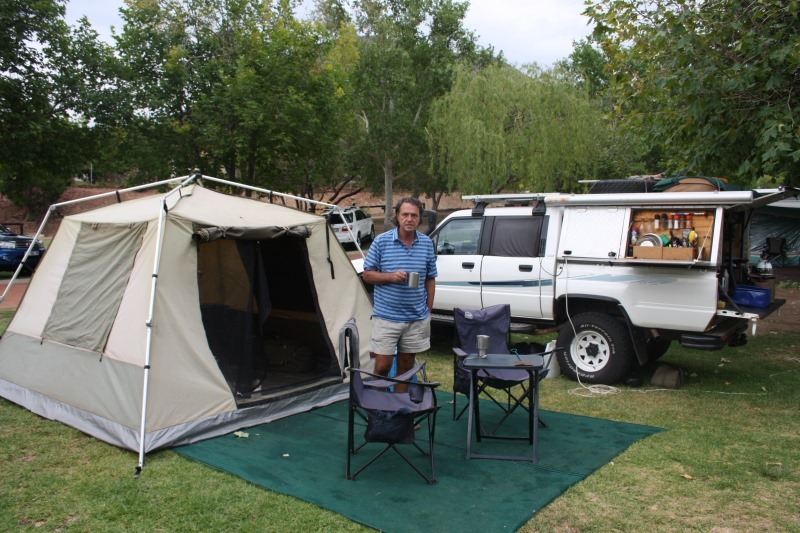 pitching our tent in the kitchen because it started raining again, braaied our wors and enjoyed being where we were. 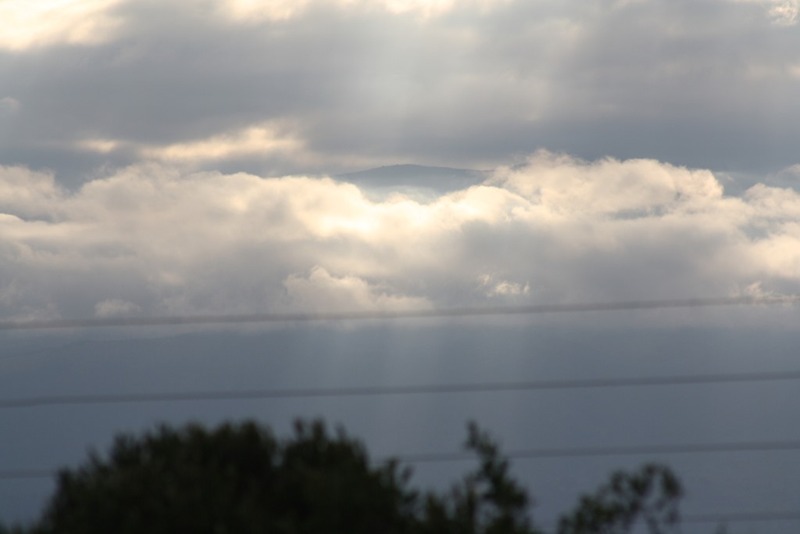 The next morning we could actually see a little bit of Mt Kenya which made us happy. When we went north we couldn’t even see that there is a mountain. 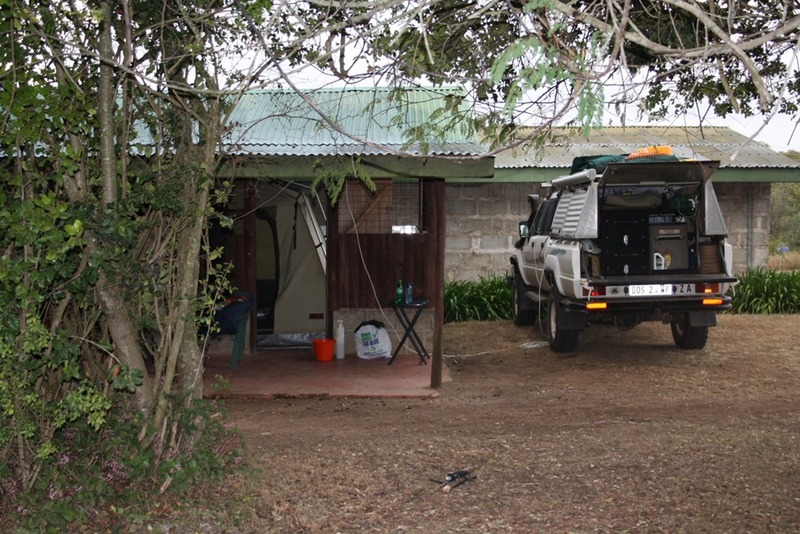 From Nanyuki it was a short drive to Nairobi and Wildebeest Lodge where we camped previously. We stayed for 2 days, washing the truck, doing laundry, shopping and relaxing. 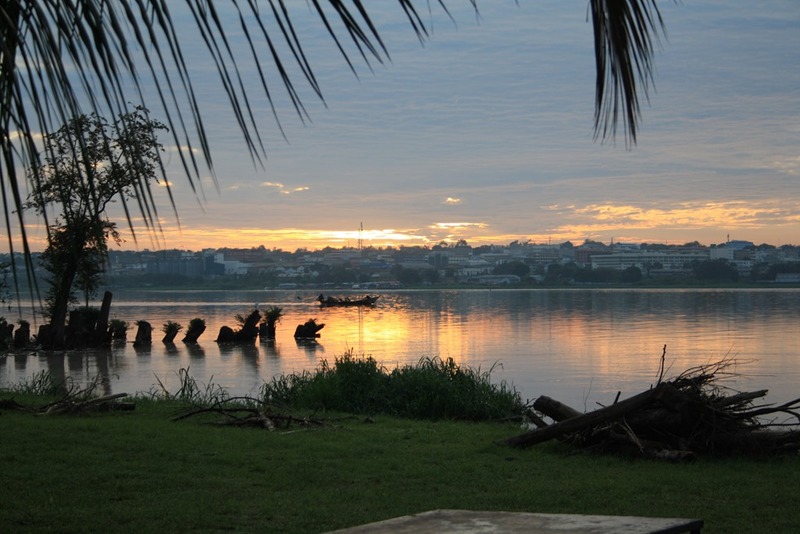 We thought to stay until Saturday but wanted to get out of cities into the bush again, so very early Friday morning we were off on our next adventure…Lake Victoria and Uganda!! 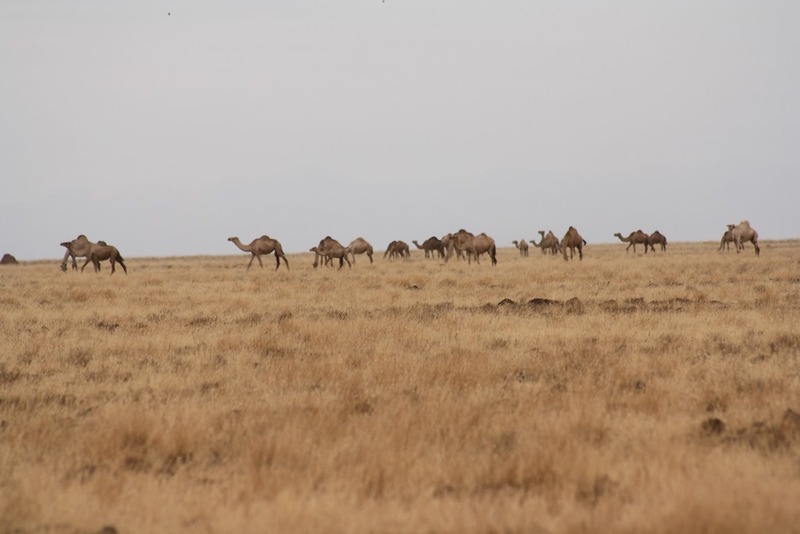 Now we are very glad that we decided to leave Nairobi Friday because on Saturday the shootings happened at the West Gate Mall and “people died” as the lady said in Moyale…….! 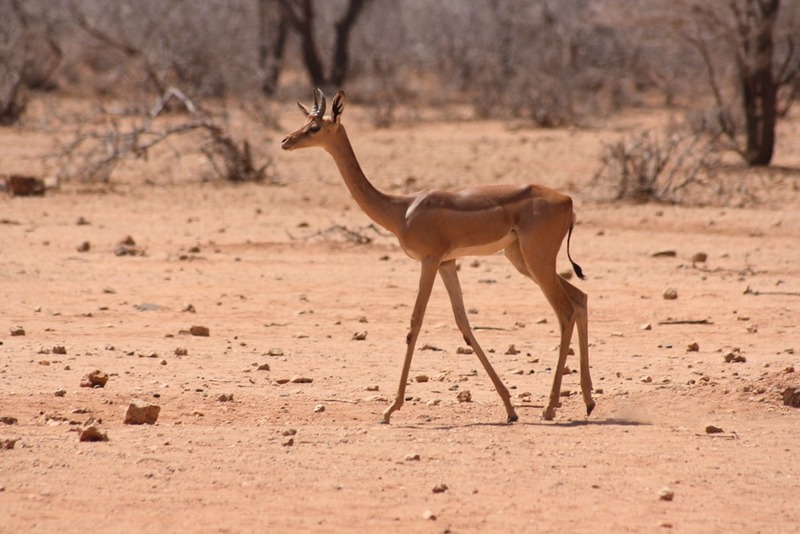 Africa is not for sissies! 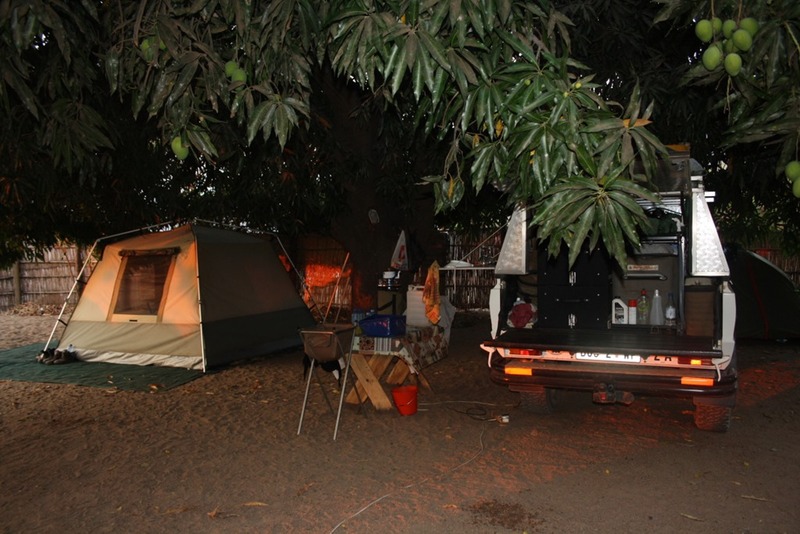 We are at Kisumu Bay Beach Camp ( 500KS p.p.) 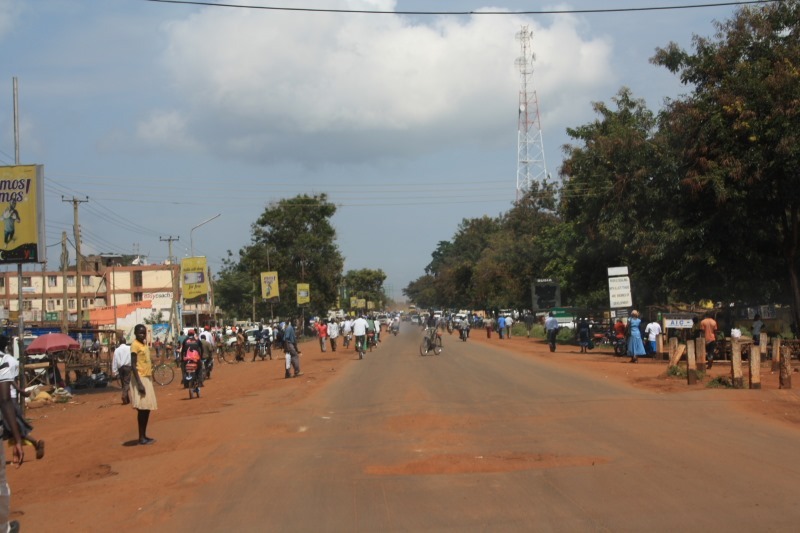 and will be leaving for Jinja in Uganda tomorrow. 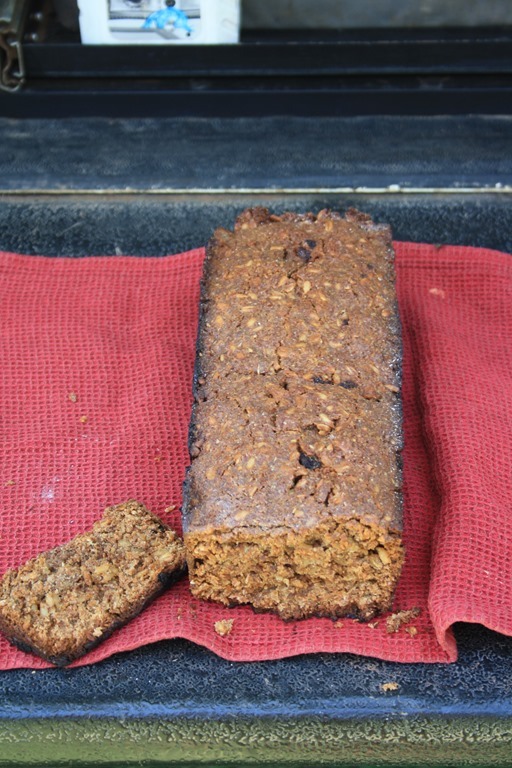 We baked rusks, done washing and are enjoying being in the tropics, listening to the fish eagles, saw beautiful parrots, trying to dodge mosquitos but are on track again planning and looking forward to the southbound trip! 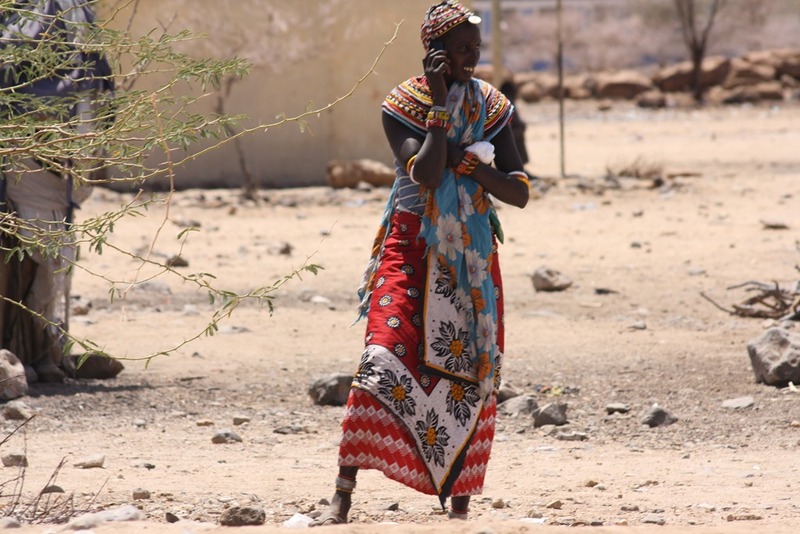 Cell phones all over Africa!! 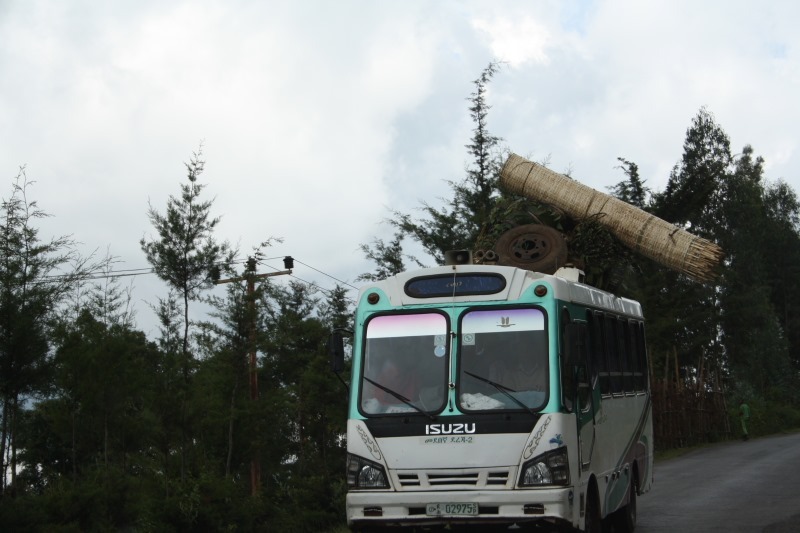 It took us 4 days, 3 sleepovers and 22 hours of driving to do the 1000km from Axum to Addis. 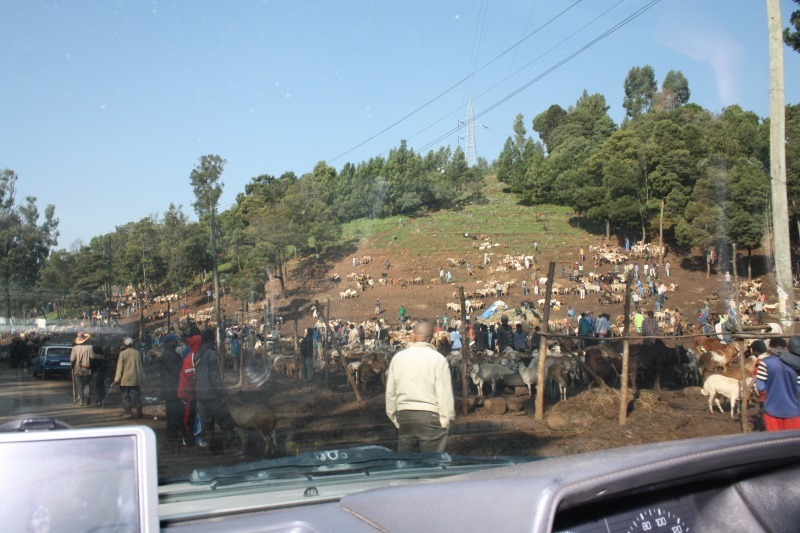 We came to a huge roadblock of lorries at the cattle market when entering the city and also passed the sheep market on our way to Wim’s. When we stopped at Wim’s Holland House, we were greeted like long lost family. We were very tired and just sat down to enjoy their fantastic Pizza, Ethiopian red wine and St George Draft. 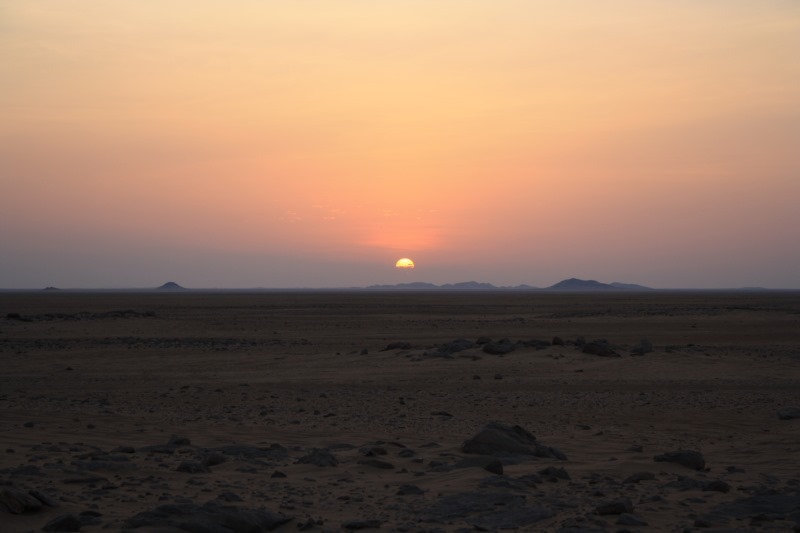 We drove exactly 6000km from Addis to the Egyptian border at Wadi Halfa and back in 26 days. 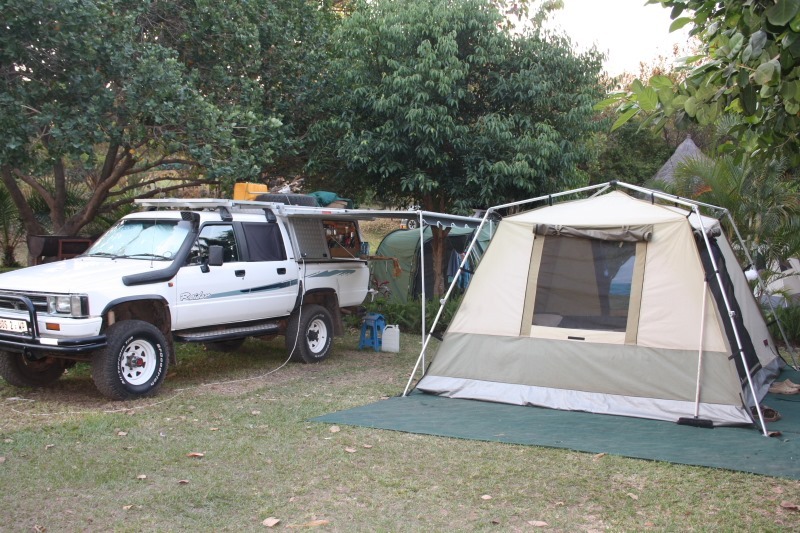 This was Overlanding! 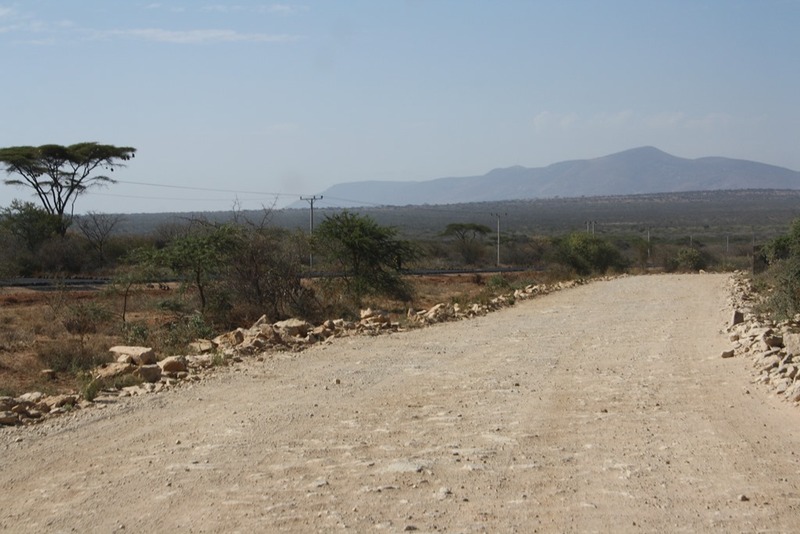 We are heading tomorrow south to start the infamous Moyale/Marsabit road towards Kenya and Nairobi. 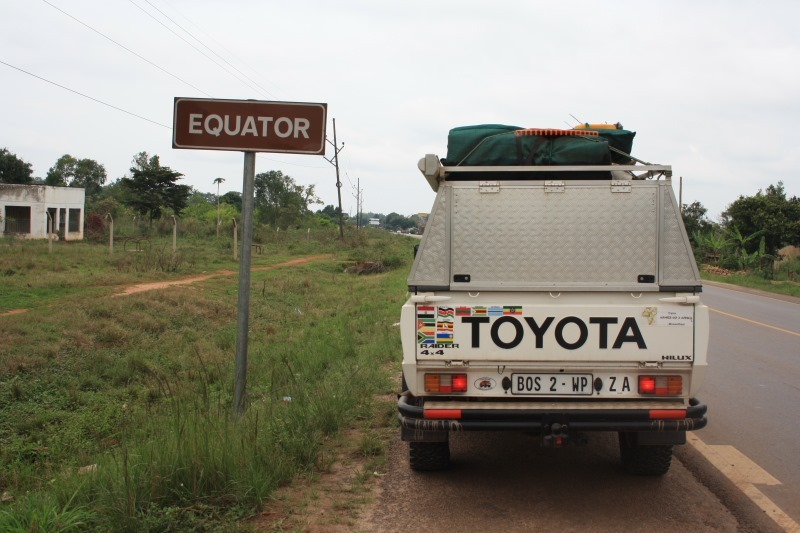 This will still be overlanding but once we leave Nairobi after stocking up a bit, we are going to travel leisurely towards Uganda, Rwanda, Tanzania and Zambia rather being on holiday than overlanding. 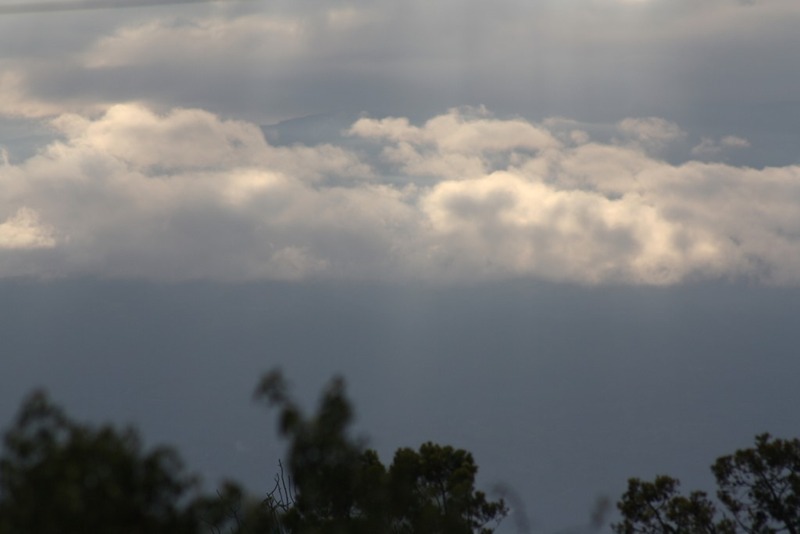 It happened that we arrived in Addis on the Ethiopian New year, 11 September 2006. It was a holiday and the city were silent and quiet. 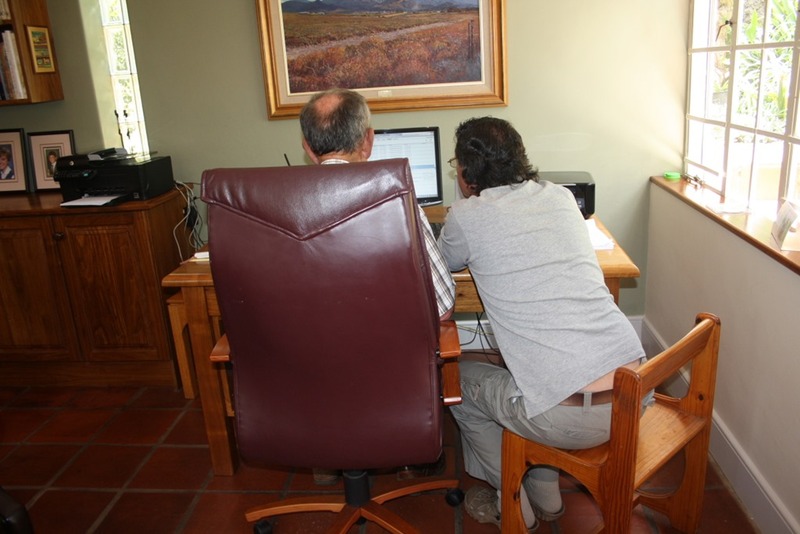 We were actually going to leave today, but Wim insisted that we stay for tonight’s party they are having. It is a combination of a Dutch oliebol party and New Year’s party. The new Dutch Ambassador to Ethiopia is also invited, so it is going to be a very interesting event. 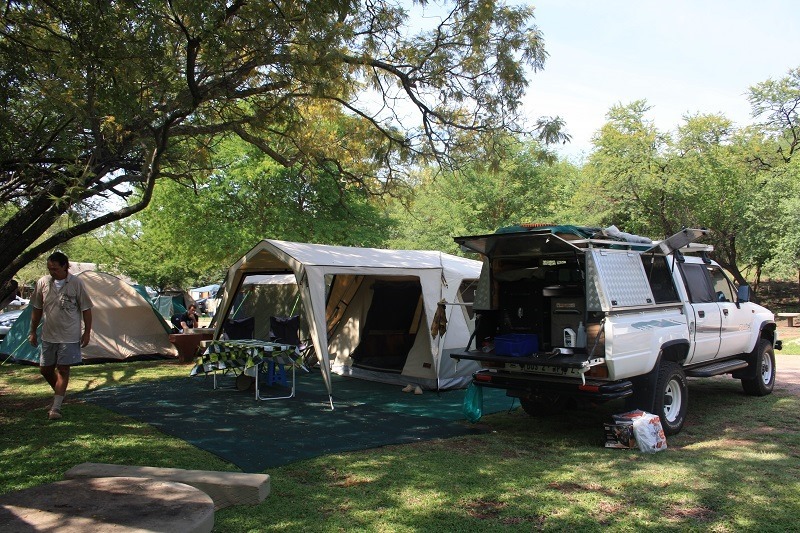 We are ready to depart very early tomorrow, filled up with petrol, water and veggies.The truck had a thorough wash (even the engin,) greased and we are ready for the next adventure!! The local children came around with New Year wishes giving us pictures that they’ve drawn, some of them making a huge noise, singing. 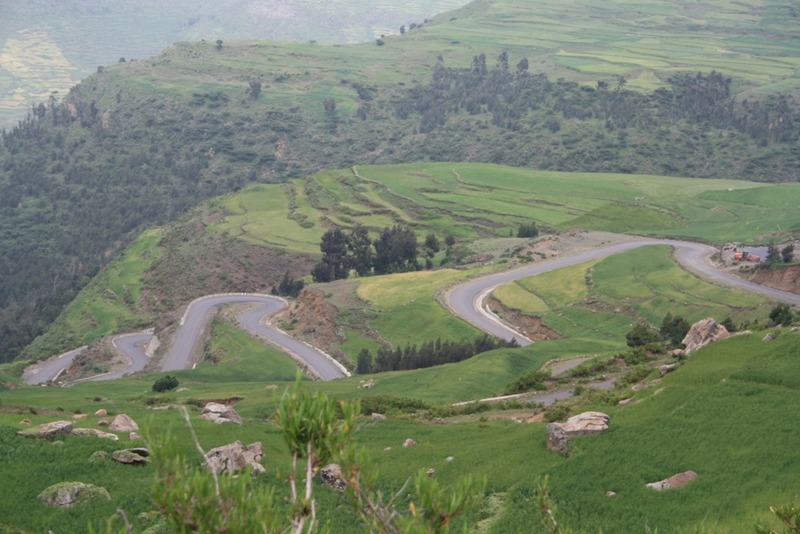 We drove from Axum to Hawsen in the Tigray region. 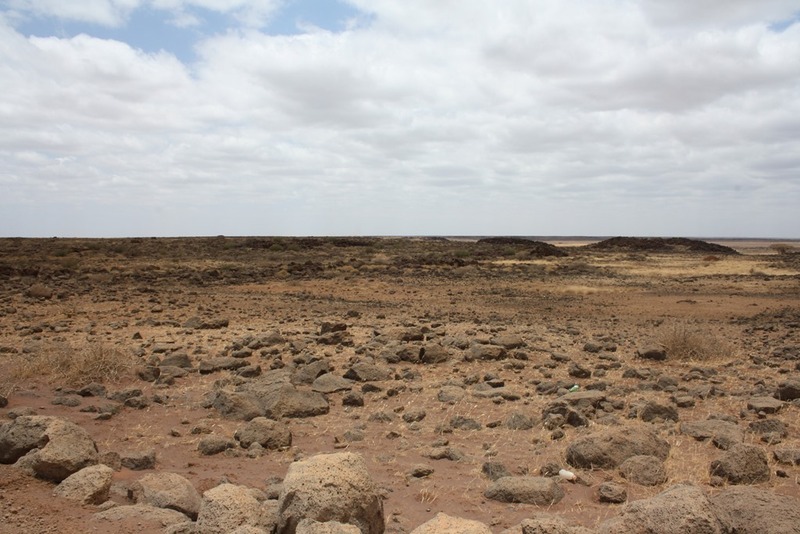 The Gheralta cluster of rock-hewn churches are not far from there. We opted to visit the nearest of them. We stayed at the Tourist Hotel which is very nice because you can actually park your vehicle right in front of your room. We paid 230Birr for a basic but clean room with a nice bathroom. 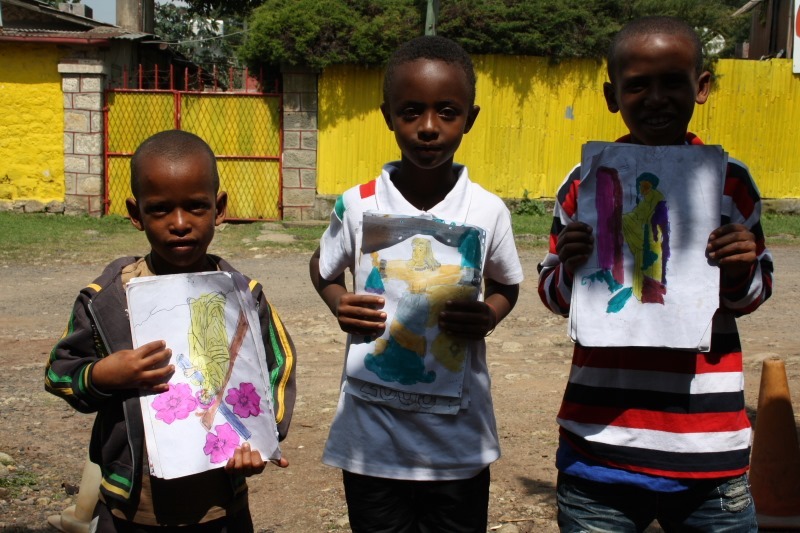 We made an appointment with a school boy to guide us to the church the next morning at 2 (Ethiopian time) 8:00 our time. 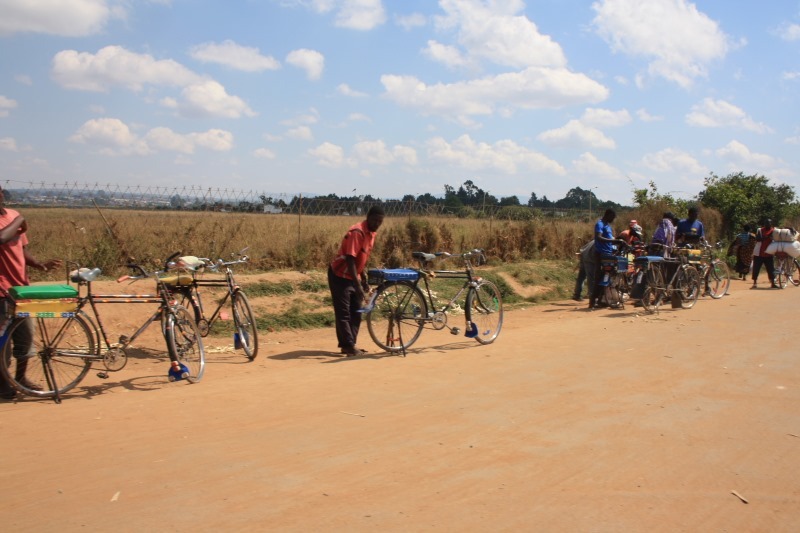 It was at some stages a 4×4 drive to the church and our guide, who was riding on a bicycle was totally exhausted by the time we arrived at the area where the church is located. The key for the church had to be organised and when the farmer that has the key arrived, he was to say the least, not very friendly! 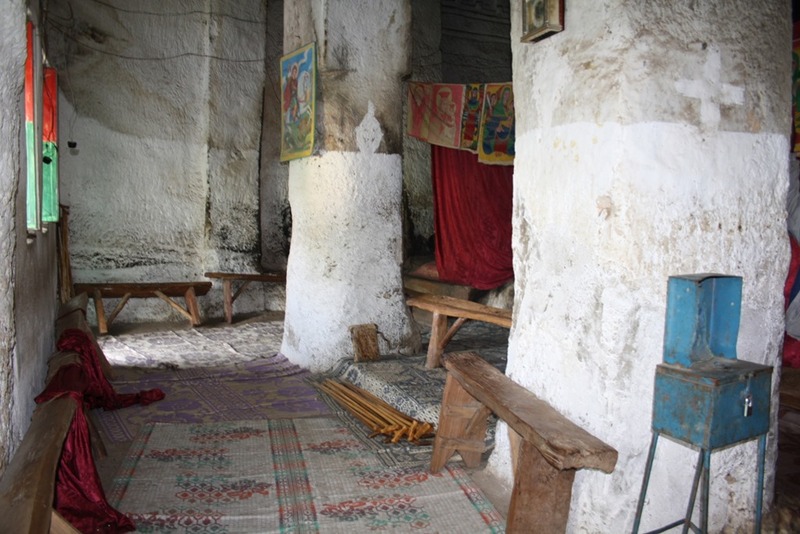 He demanded 150Birr entrance fee, so Arno opted out and I entered the church after removing my shoes. Although this drunken key holder sort of spoiled the occasion for us, we still enjoyed it and I made sure that enough photo’s were taken for Arno to see how the church looks inside. 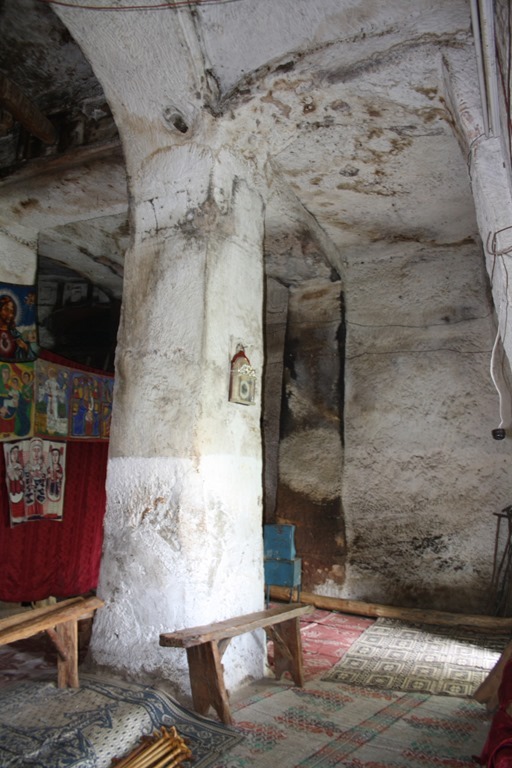 This church are more like a cave with stone pillars and steps carved out of the rock. 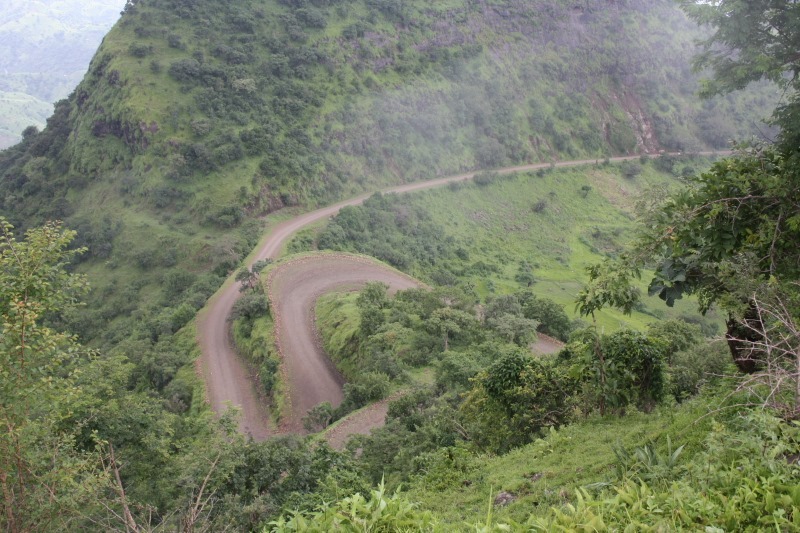 We drove the 30 teeth rattling kilometers back towards the main road trying to locate the Takatisfi cluster of churches. 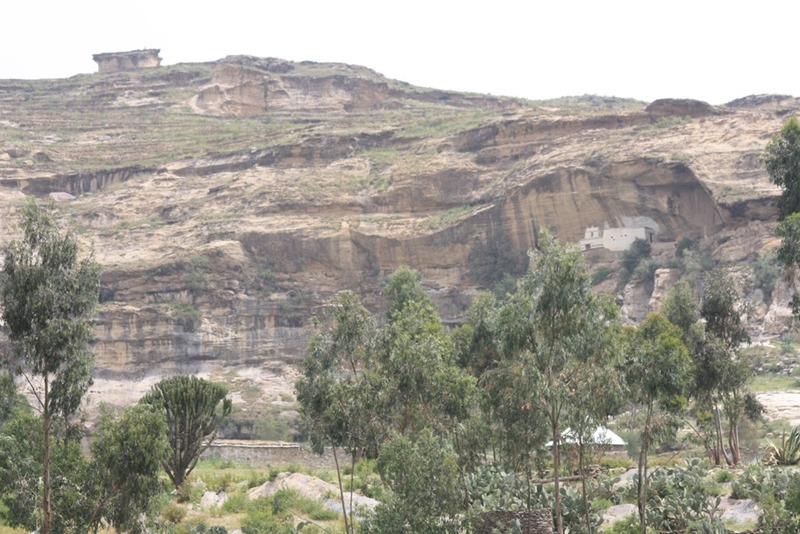 Between Adigrat and Mekele we turned offroad again to look at the Petros and Paulus church which is perched high onto the mountain side. 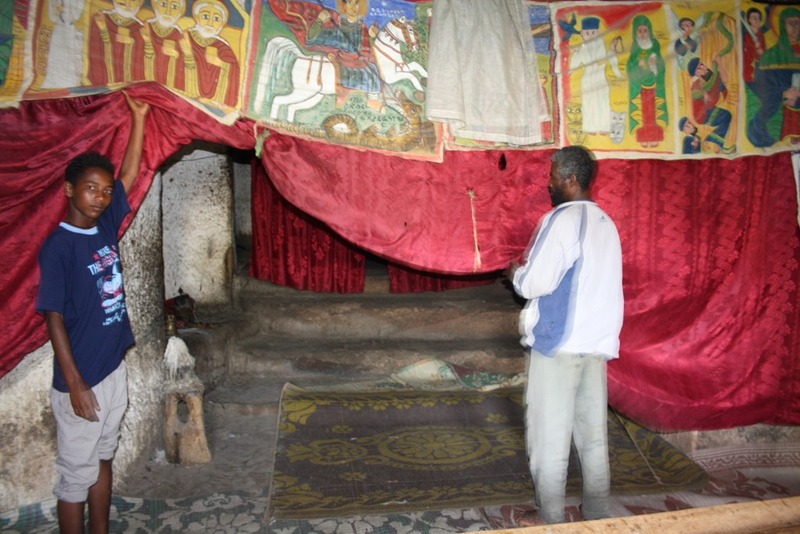 Though most of the travelers to Ethiopia visit the famous rock-hewn churches of Lalibela, the rock-hewn churches of Tigray offer the most spectacular views. 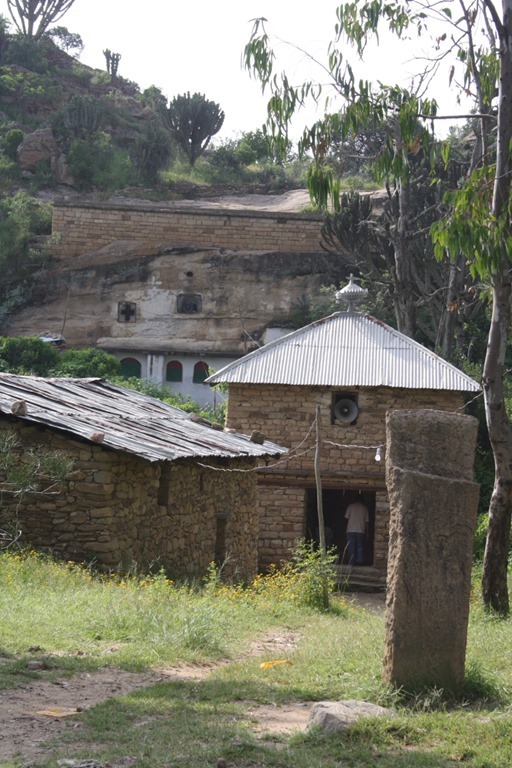 Until the mid 1960’s, the churches were almost unknown outside Tigray itself. 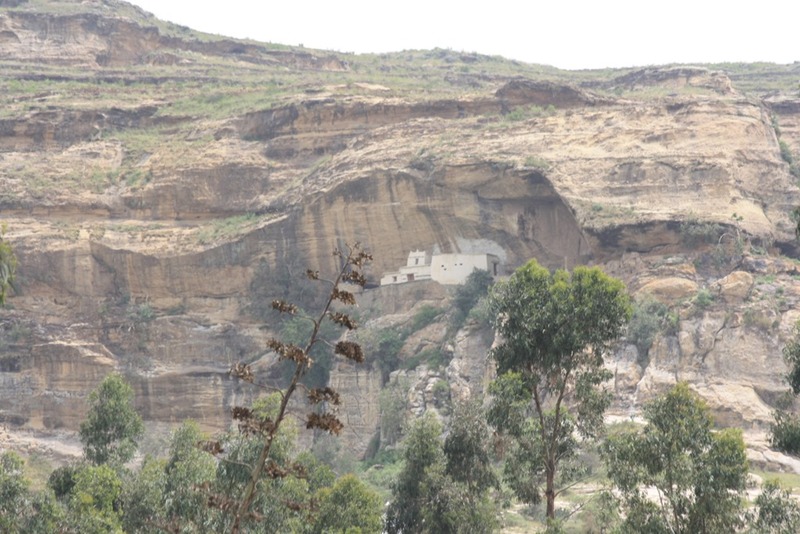 The churches in Tigray are generally semi-monolithic (only partially separated from the congregation rock) or built in to the pre-existing caves. 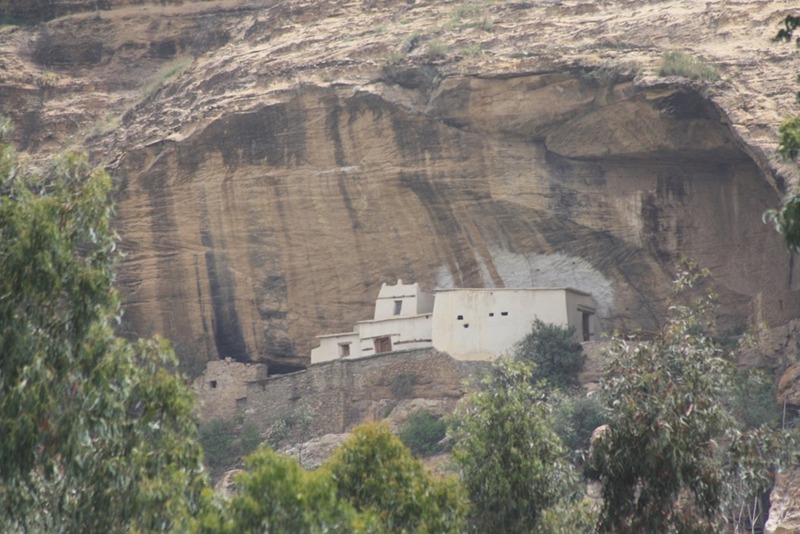 There are over 200 rock-hewn churches from Gheralta to Adwa most of them easily accessible although some are situated on the mountain ranges and involve climbing through fairly difficult terrain. 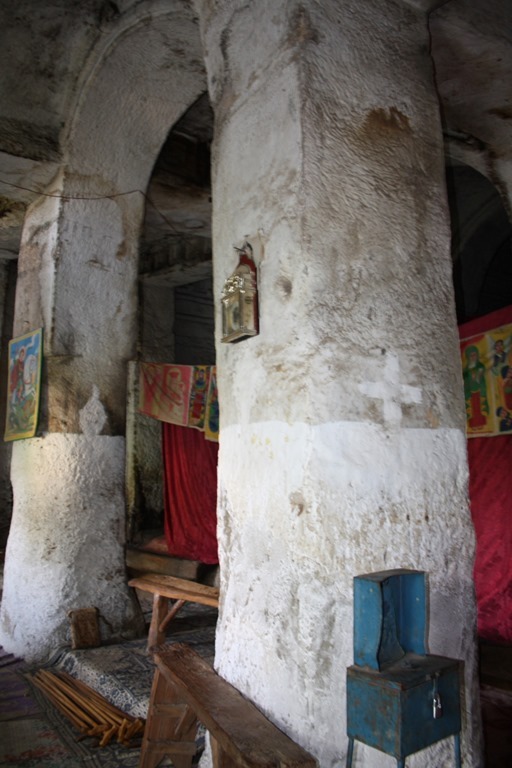 But, all this somehow adds to the attraction of the churches and offers an incredible scenery of the surrounding countryside which makes the trip to these churches very enjoyable and rewarding. 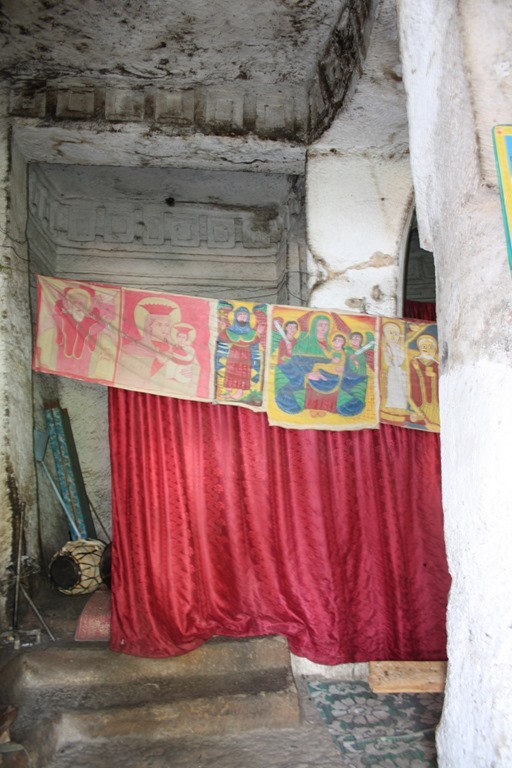 The Tigray churches may well prove to be Orthodox Ethiopia’s best-kept secret. 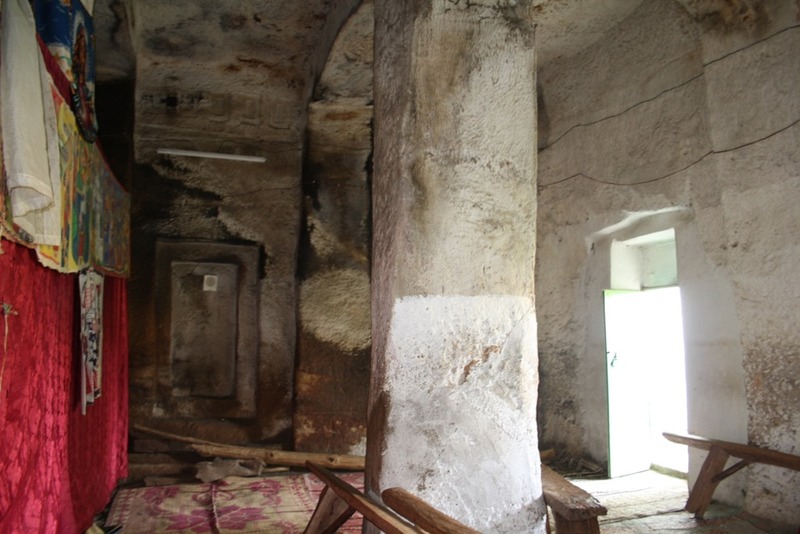 The churches were built in high, remote places to fend off would-be attackers. 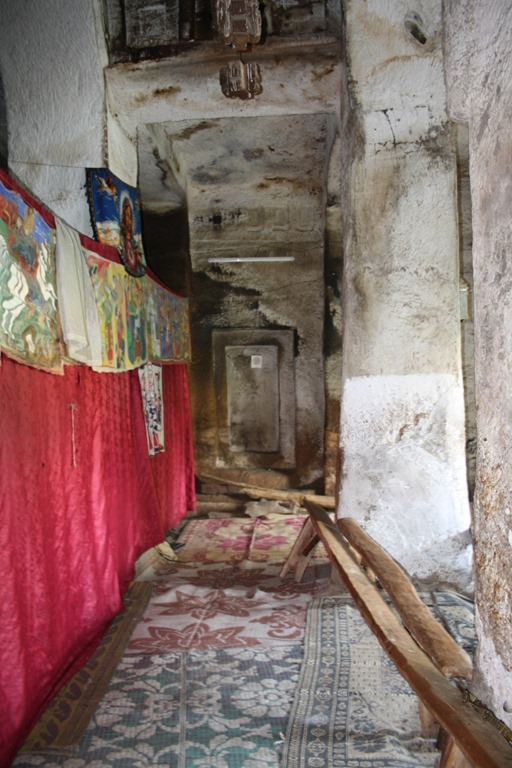 In the 10th century, the Jewish queen Judith tried to eradicate Christianity by burning churches and valuable Christian works. 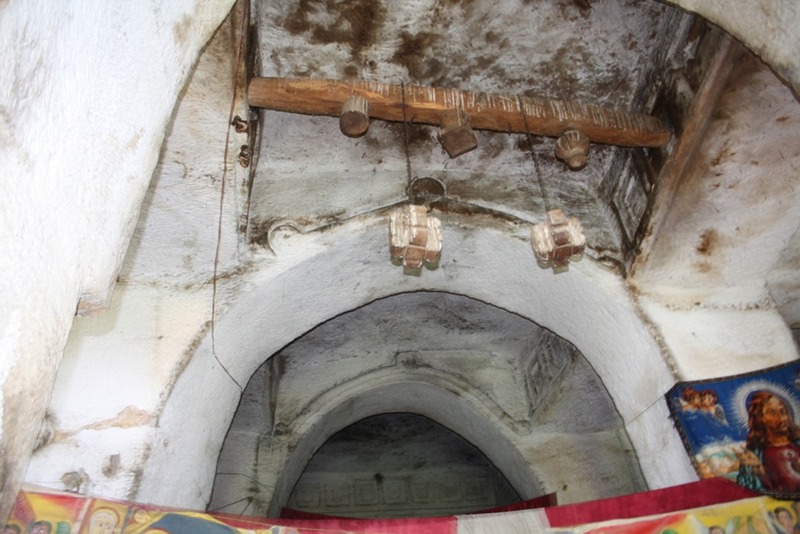 An invasion led by Ahmed Gragn (the “left-hand”) in the 16thc also destroyed valuable treasures and sign of the destruction still appear in many of the churches. 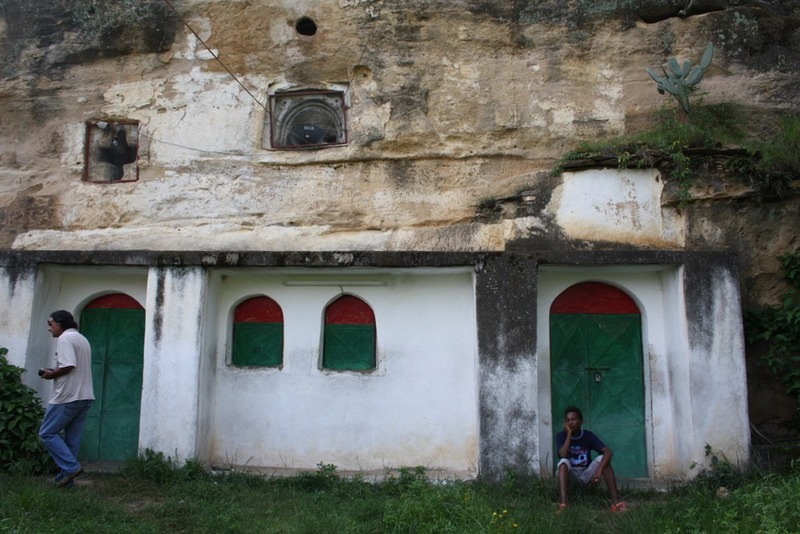 A local tradition attributes the churches were hewn out either during the joint reigns of Abraha and Atsbeha, the first Christian king of Ethiopia (c. 330-356 AD), or during the time when the nine saints spread monasticism in Ethiopia during the 6th century. 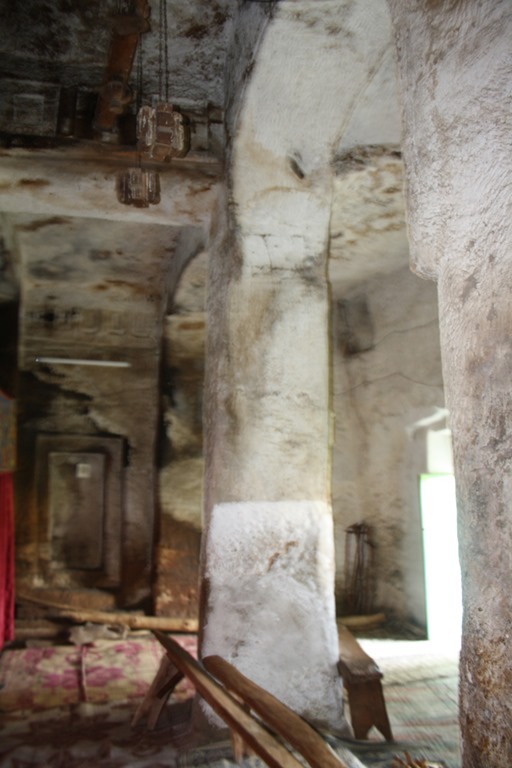 Some are very elaborate, cathedral-like, separated from the rock on three sides, while others are more like caves with great stone pillars descending within.